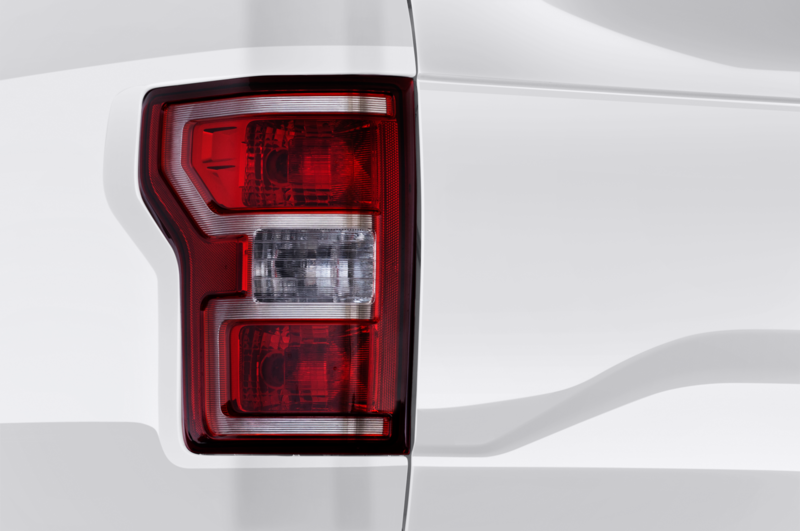 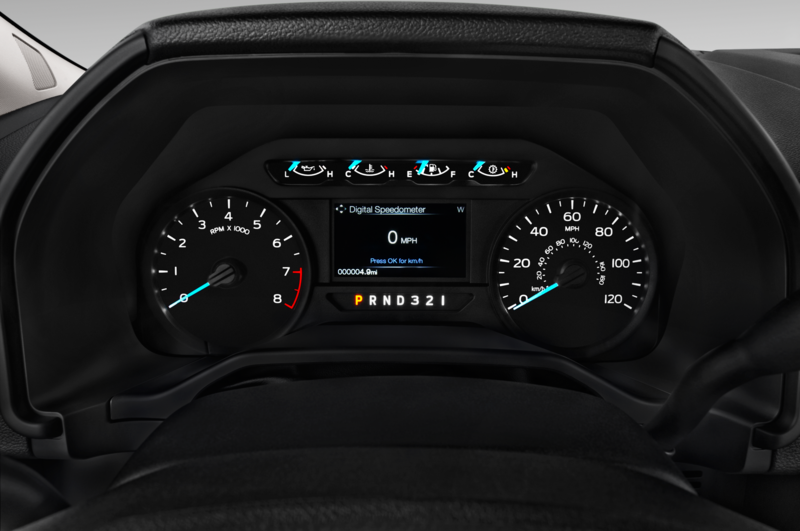 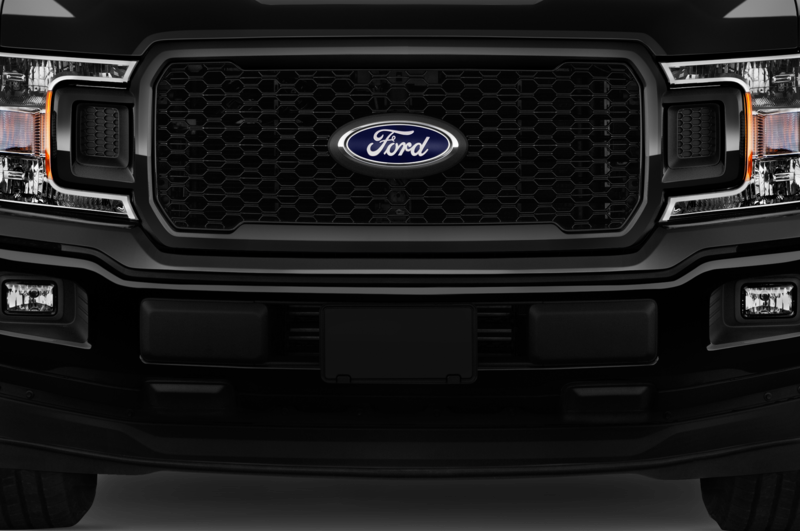 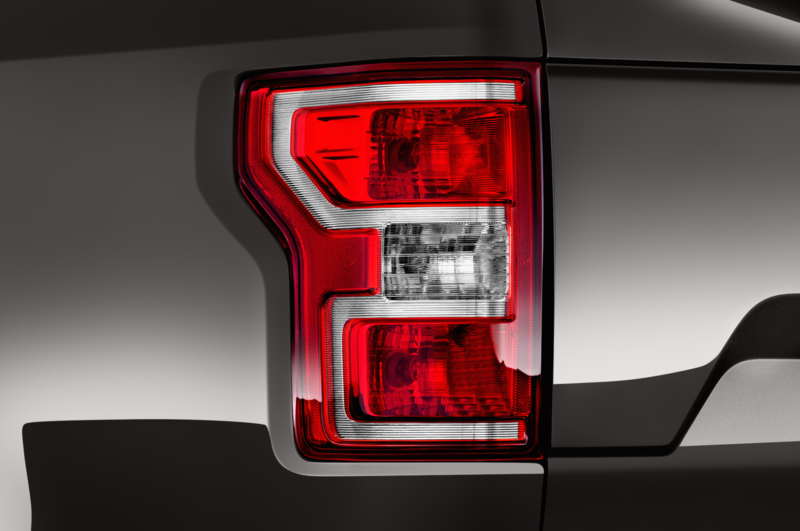 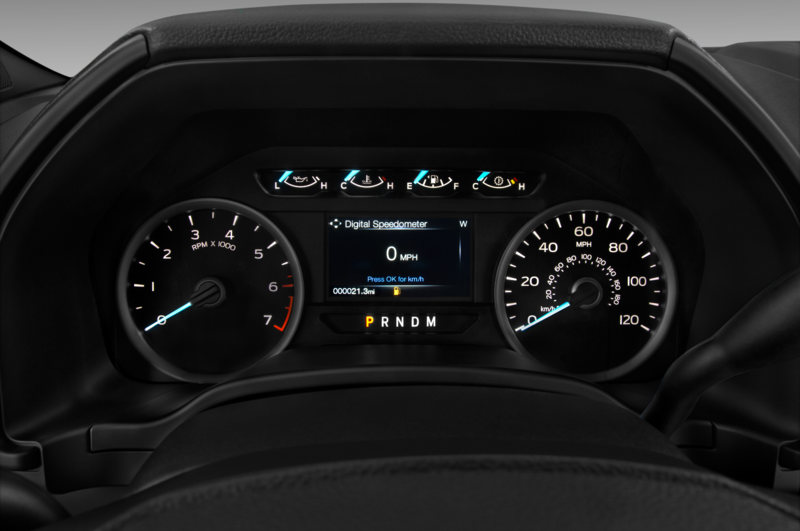 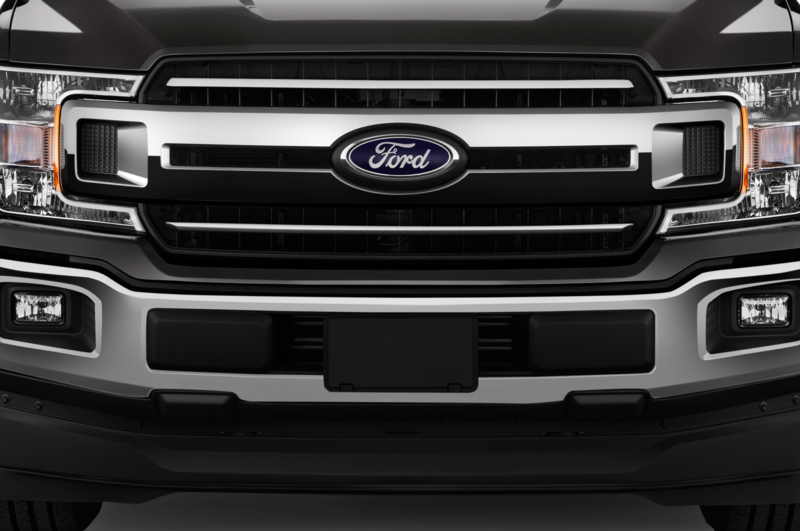 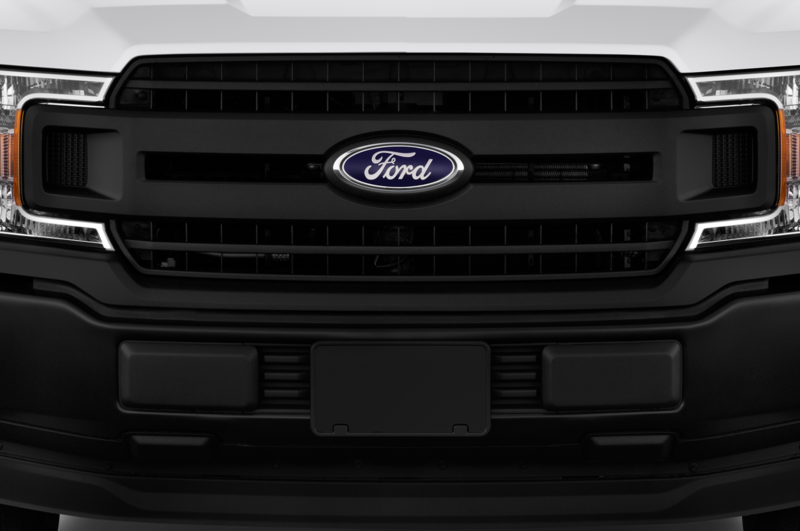 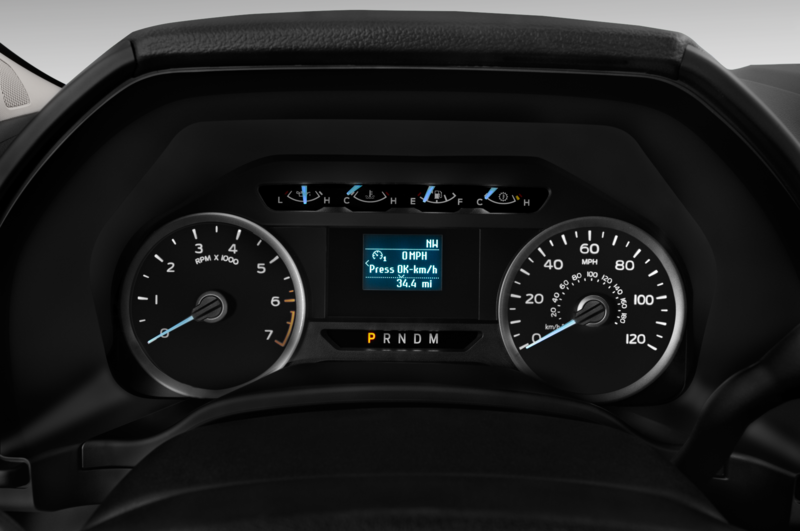 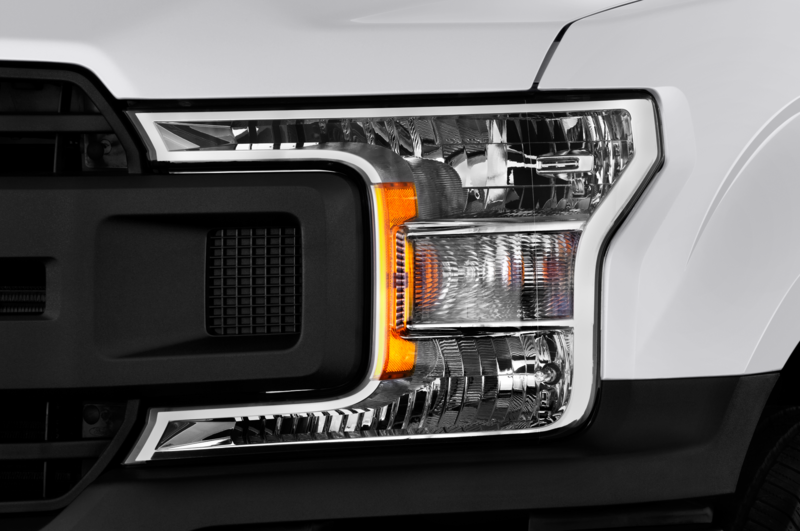 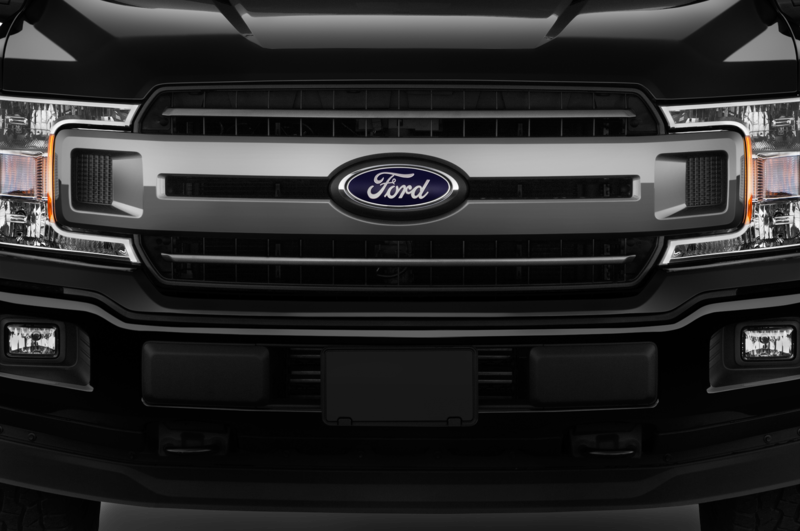 COSTA MESA, California — The Ford F-Series is no stranger to absurd numbers. 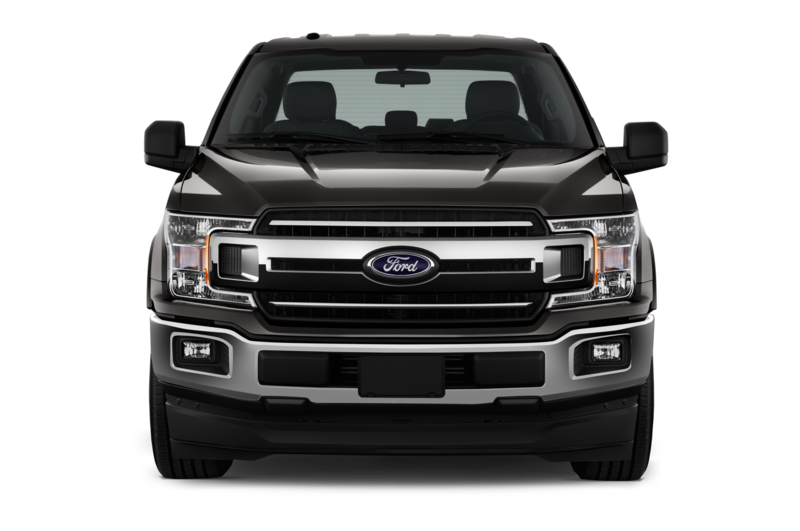 Take its 2017 sales total of 896,764, for example. 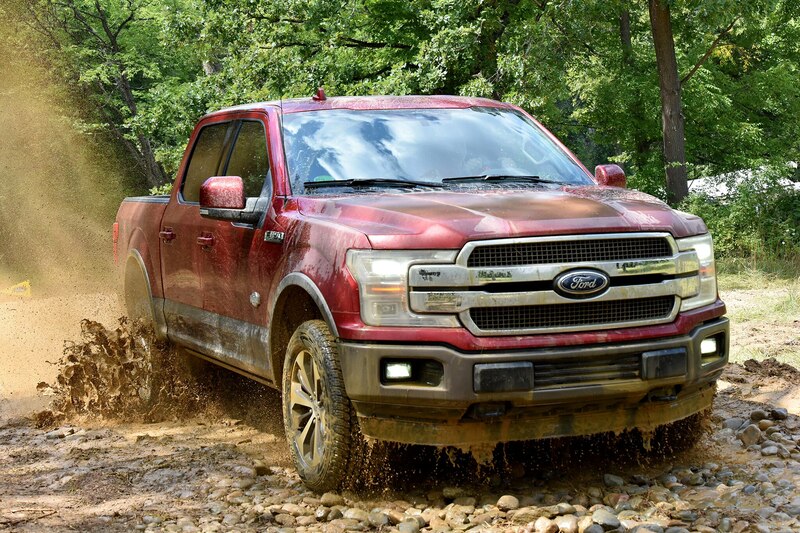 Not only was that a 9.3 percent increase from 2016, it accounted for 36.2 percent of Ford’s overall sales for the year and 5.2 percent of 2017’s total new vehicle sales of 17.2 million. 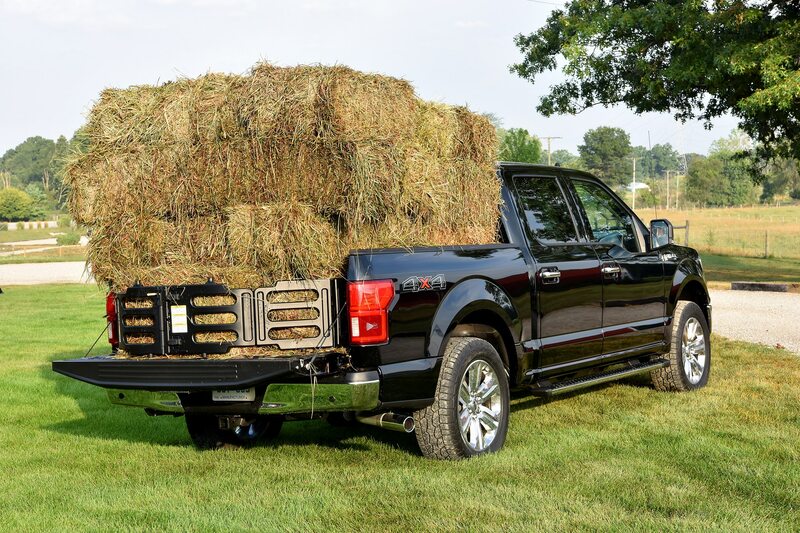 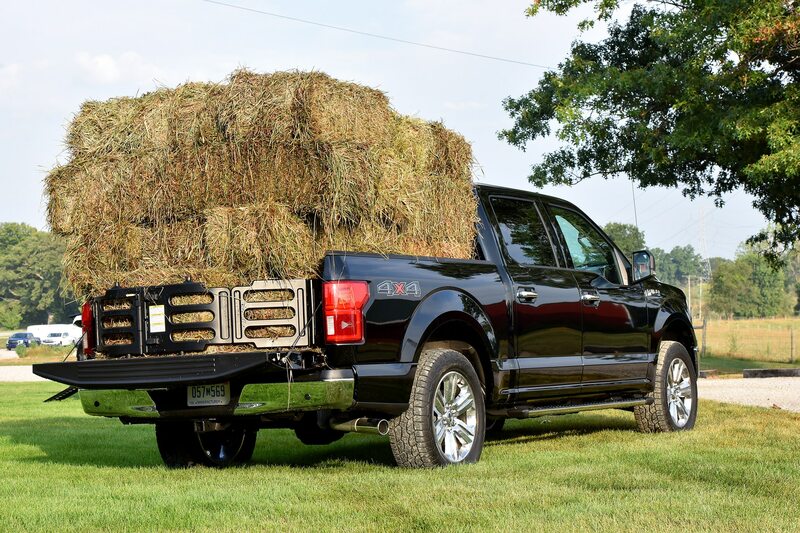 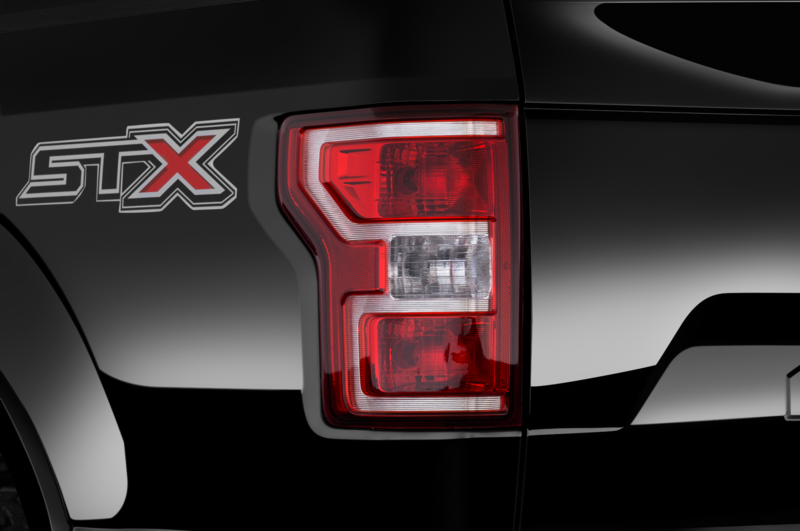 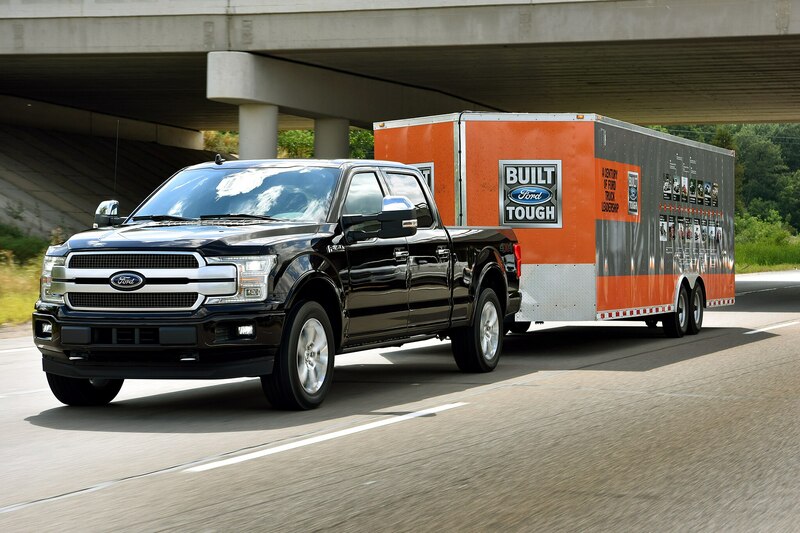 Then there’s the SuperDuty’s max payload of 7,630 pounds and max tow rating of 34,000 pounds. 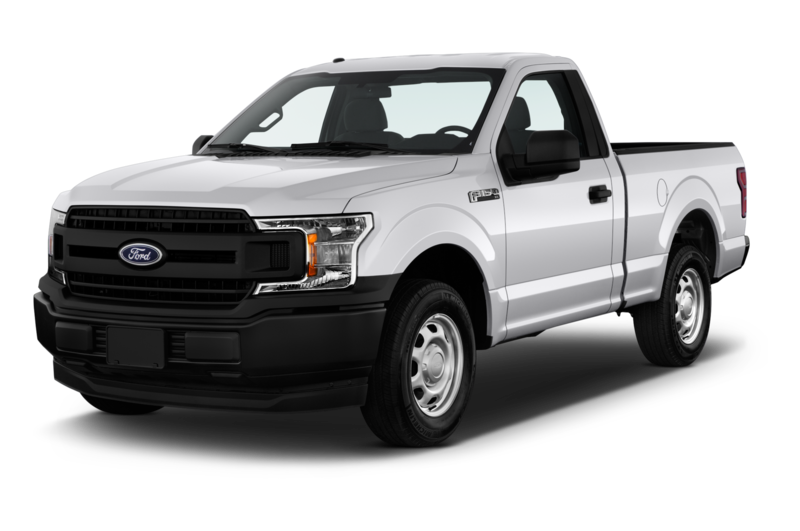 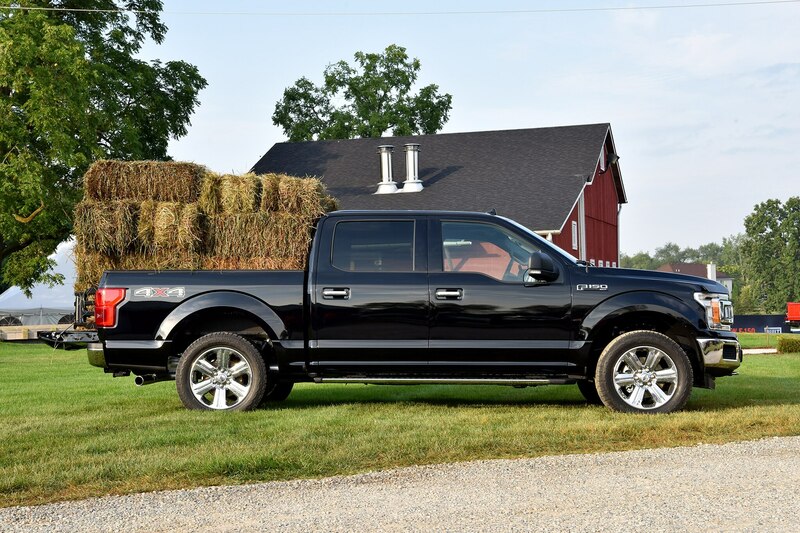 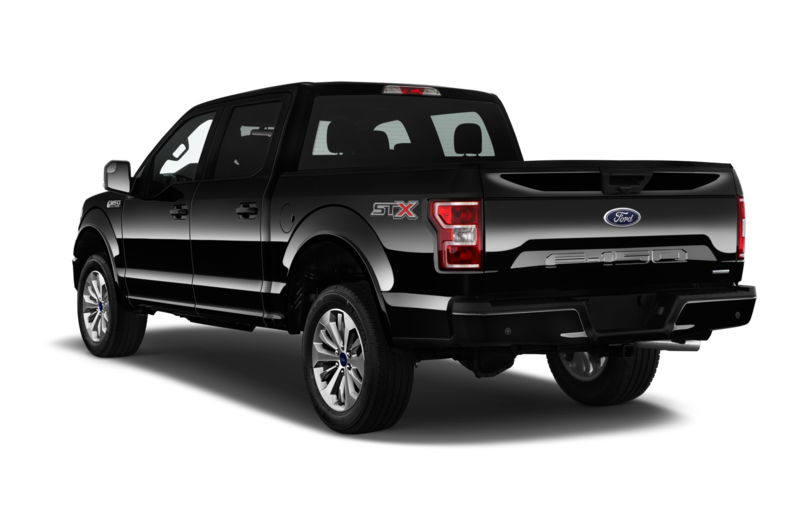 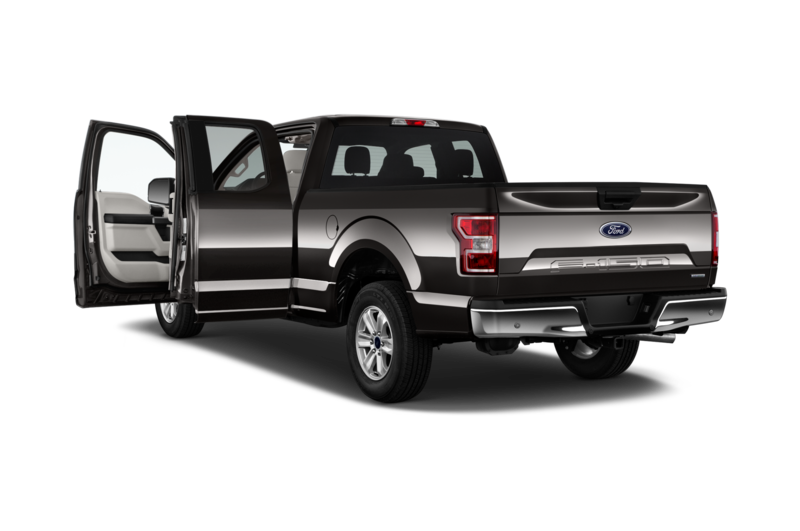 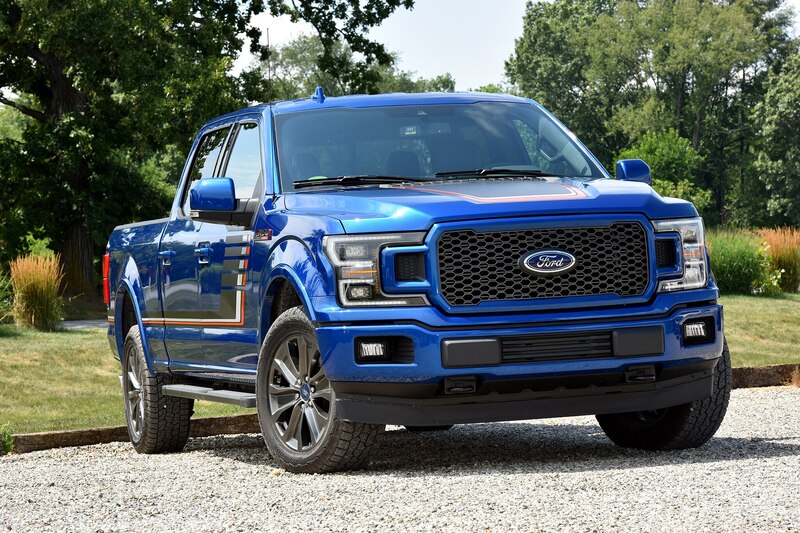 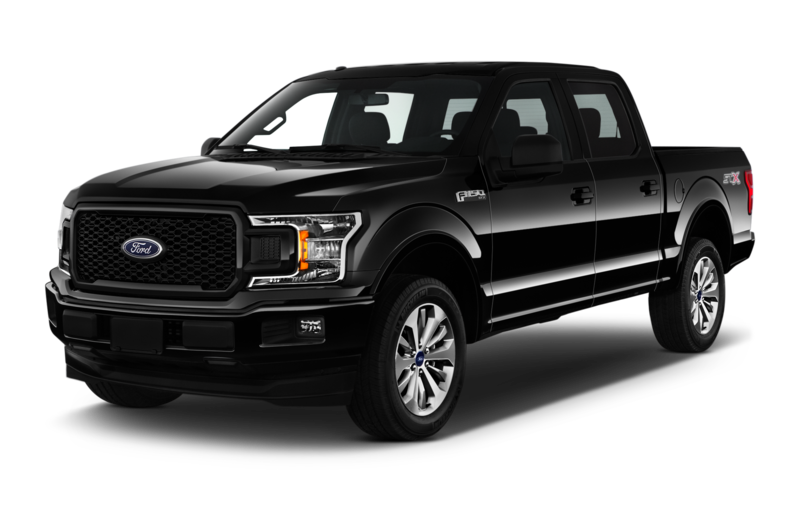 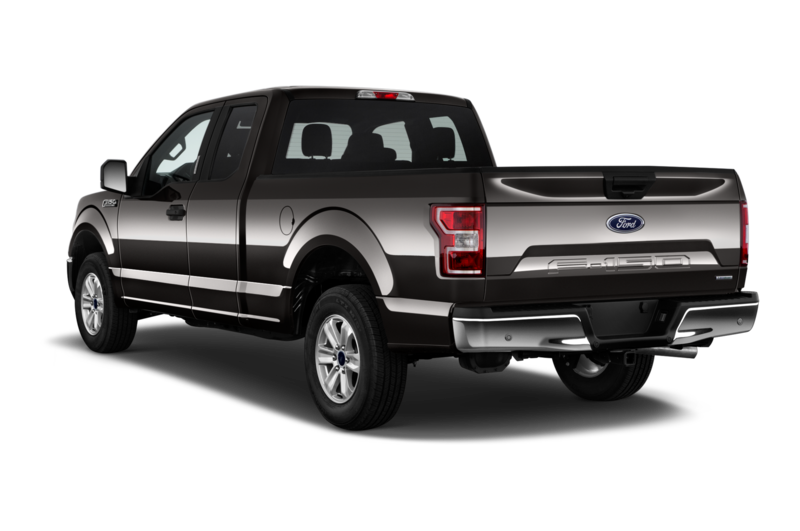 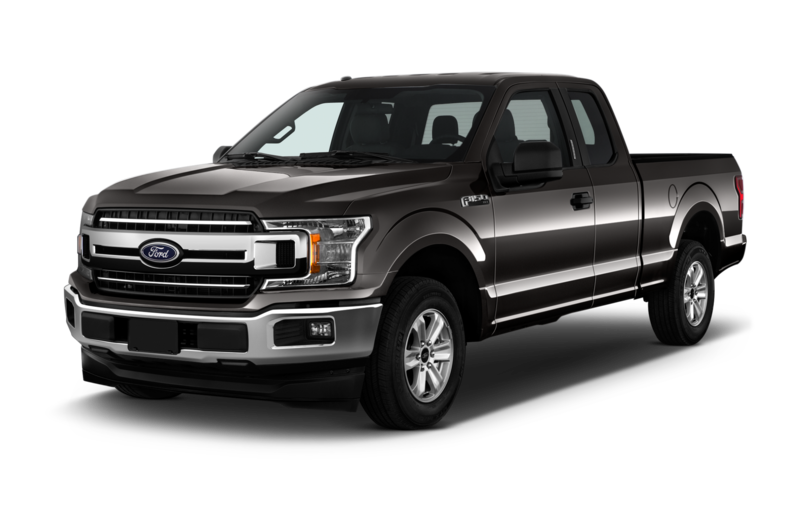 Or how about $60,475 for a 2018 Ford F-150 4×4 SuperCrew Lariat (a mid-range trim!) 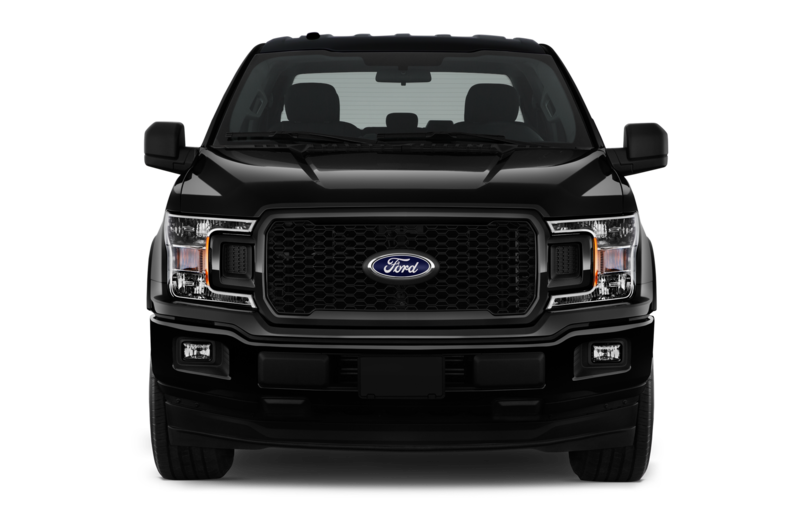 that recently spent a few weeks in our keep—an amount that until recently was widely considered to be preposterous for a half-ton truck. 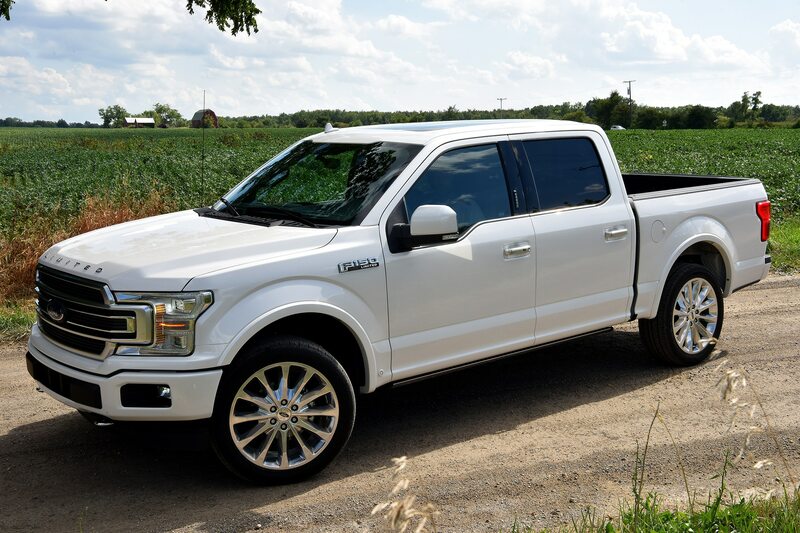 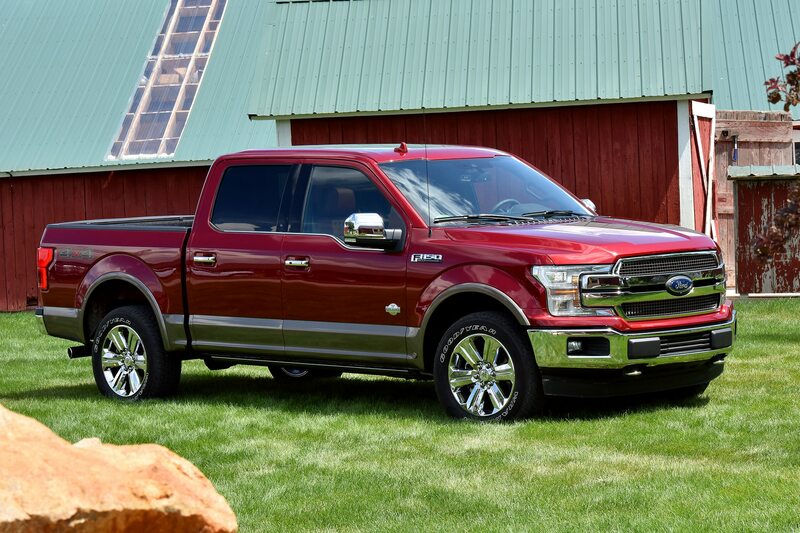 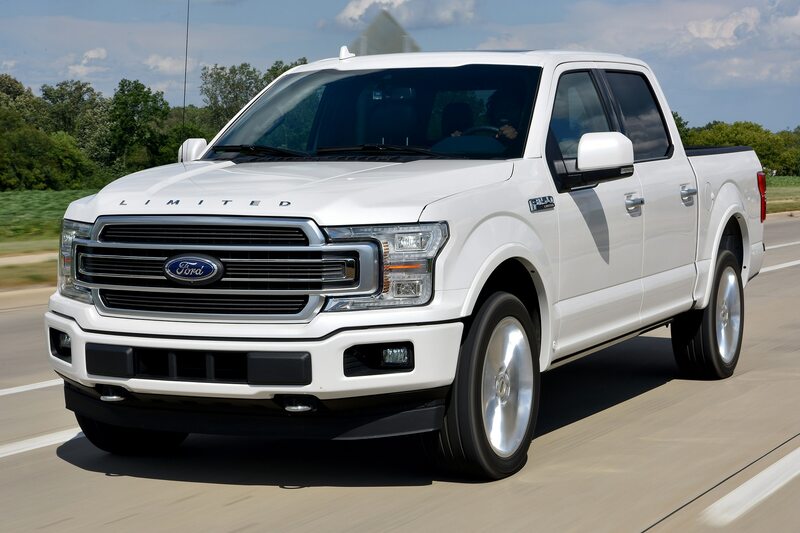 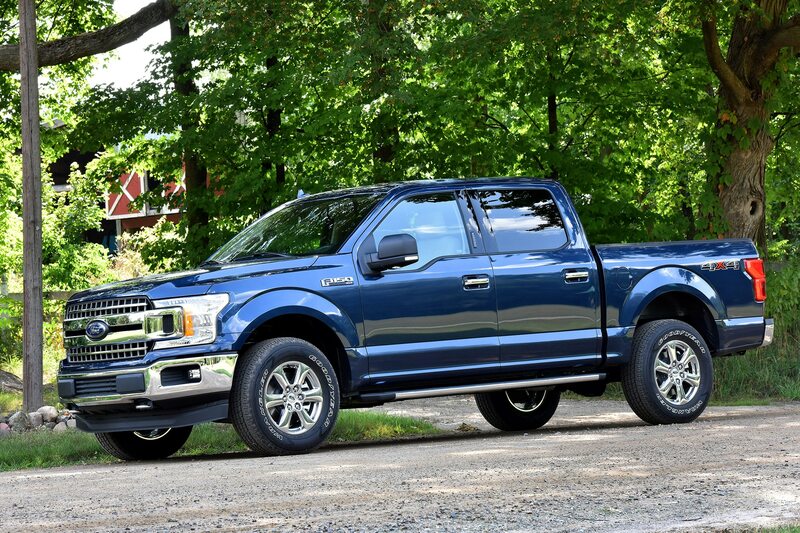 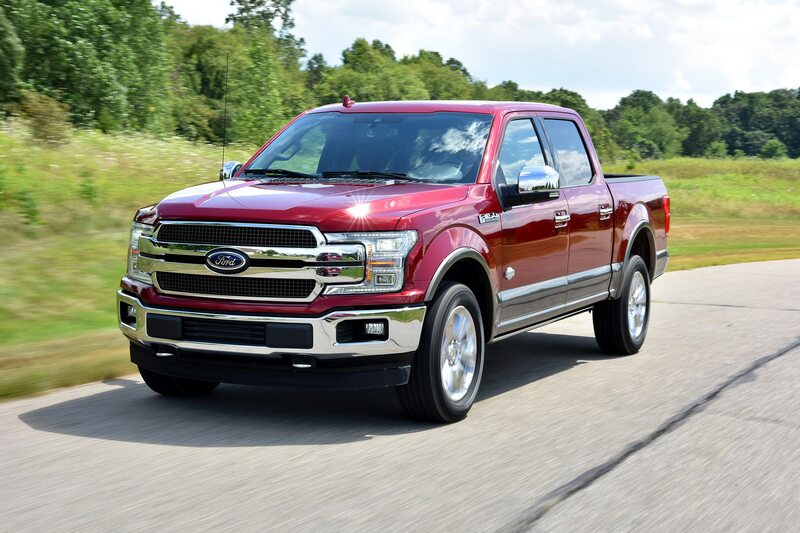 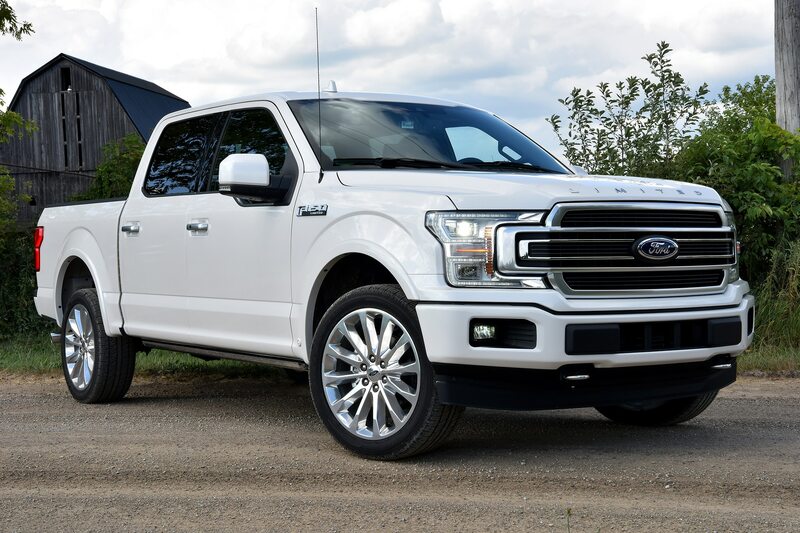 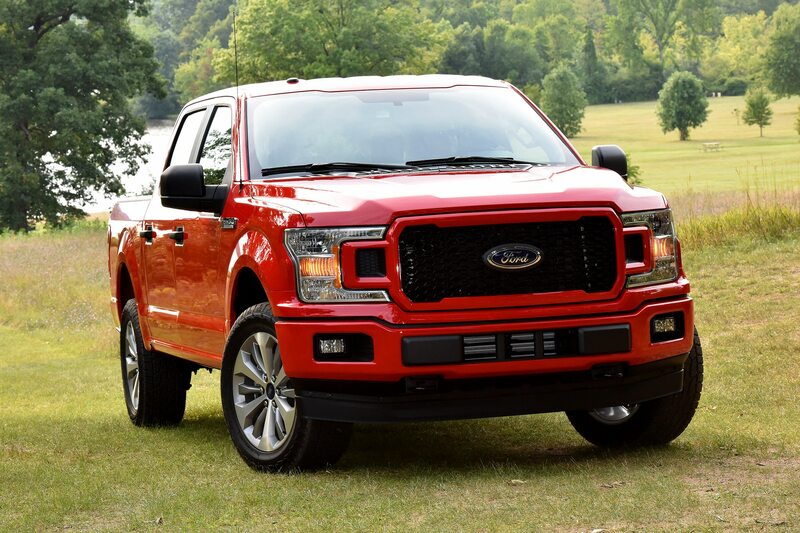 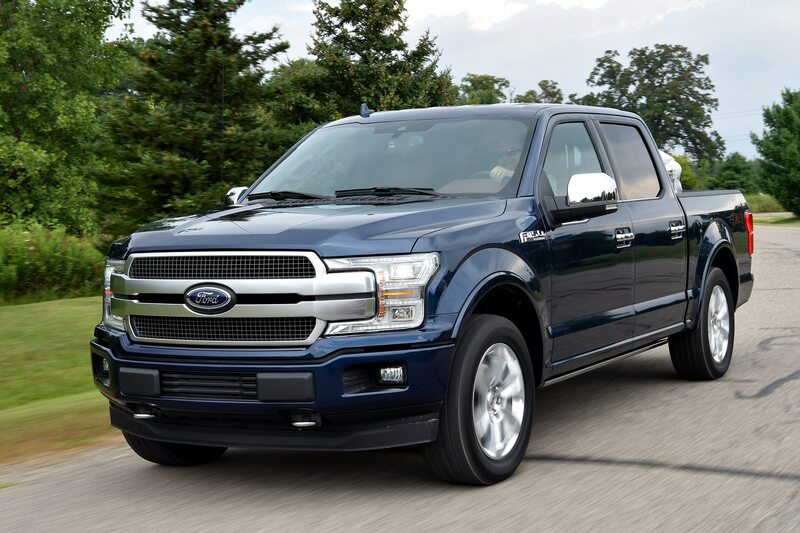 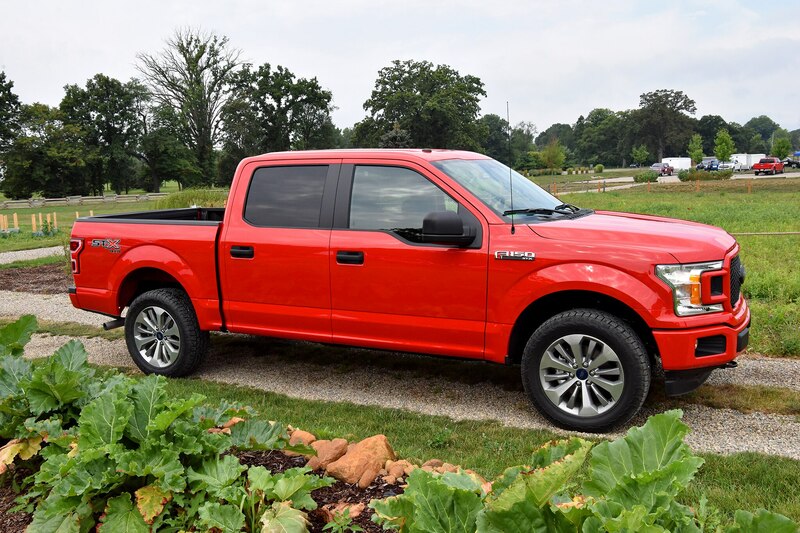 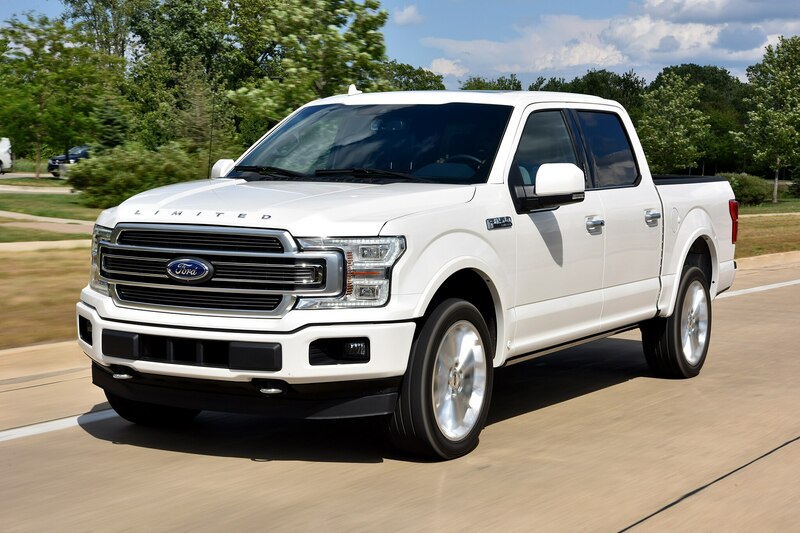 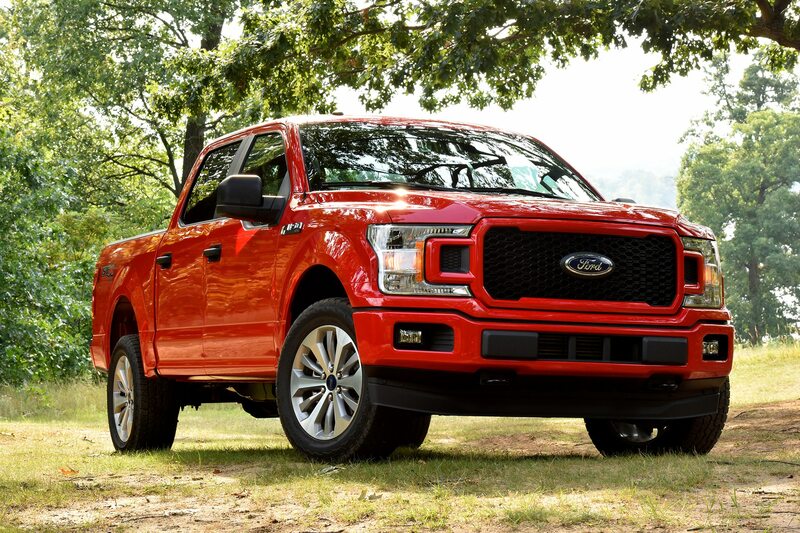 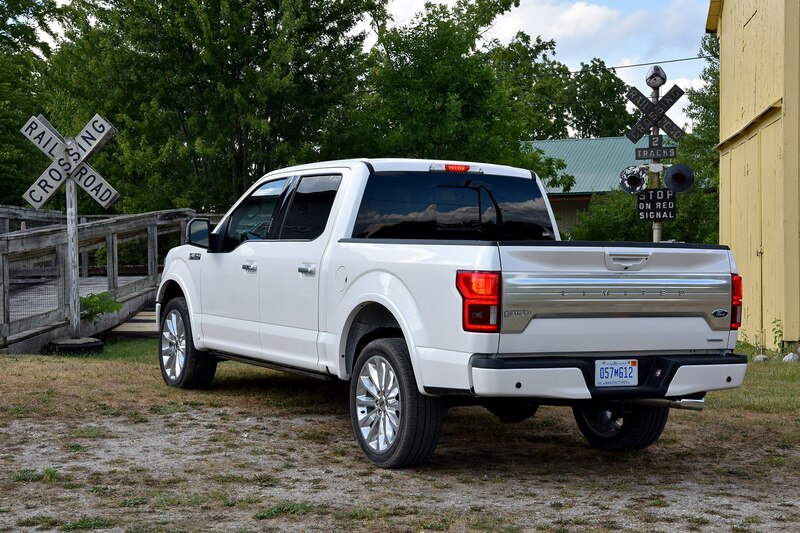 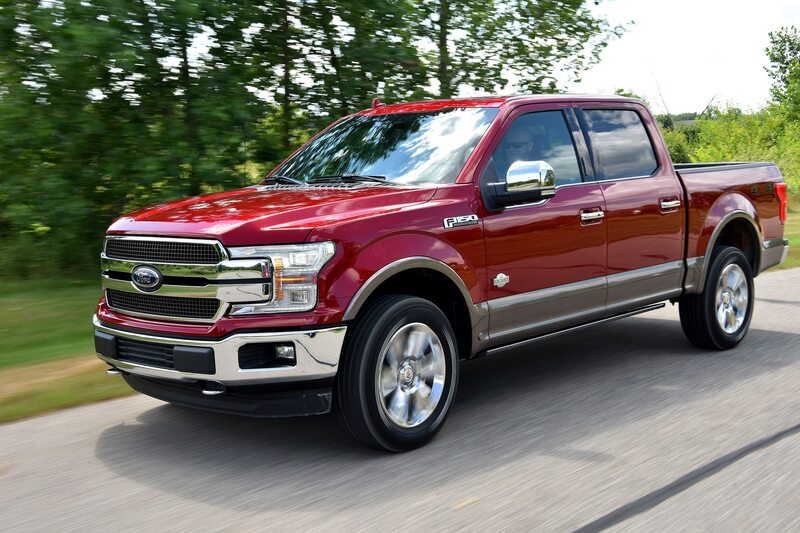 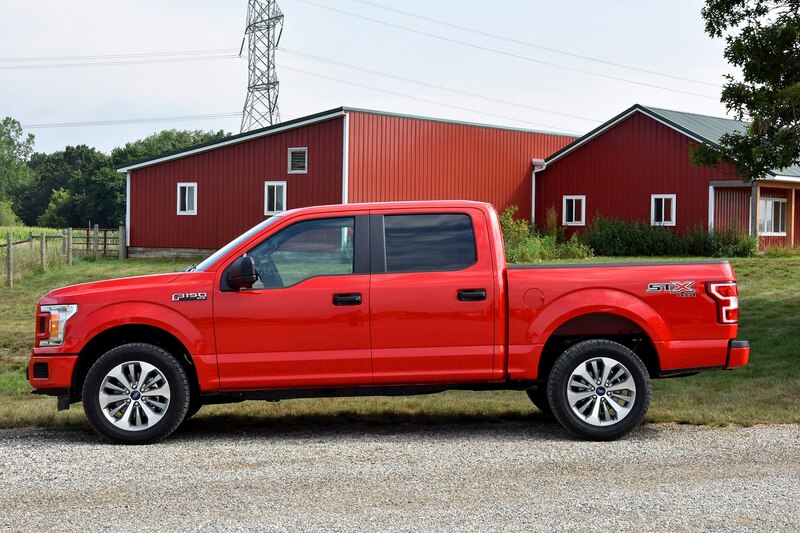 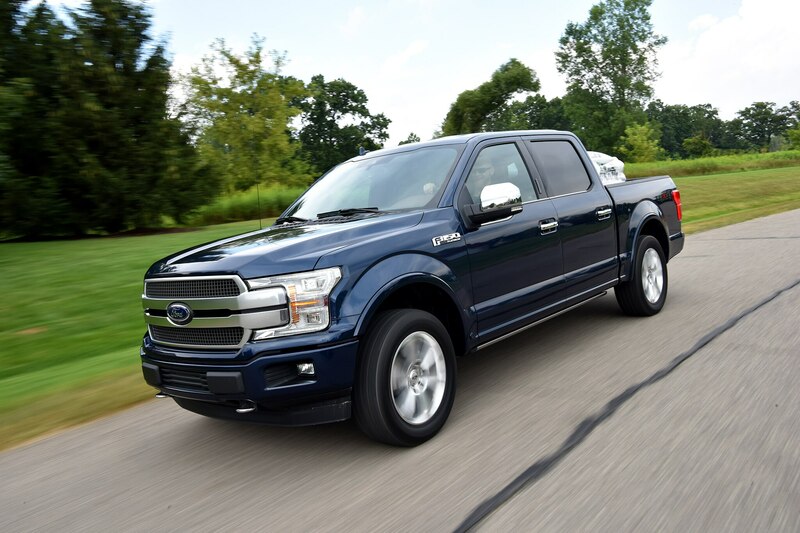 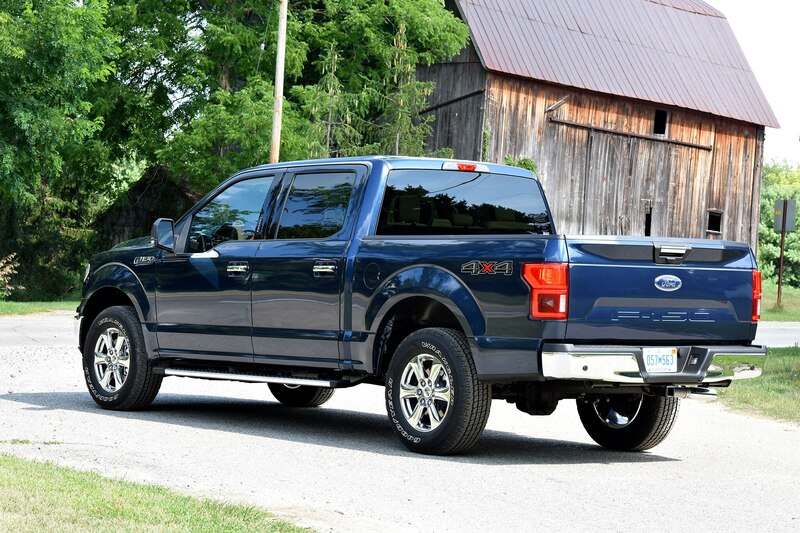 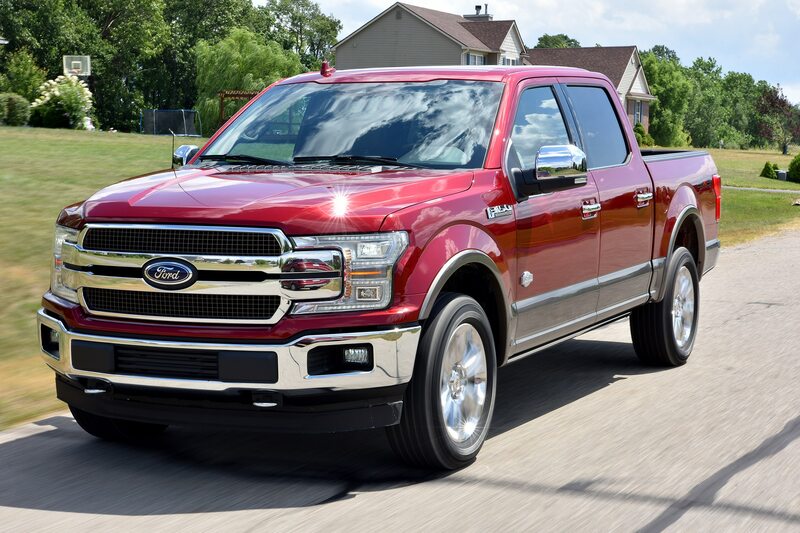 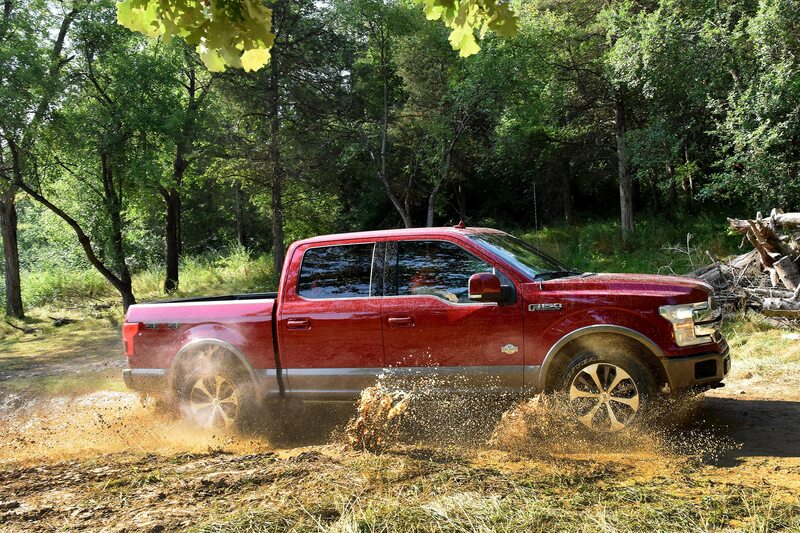 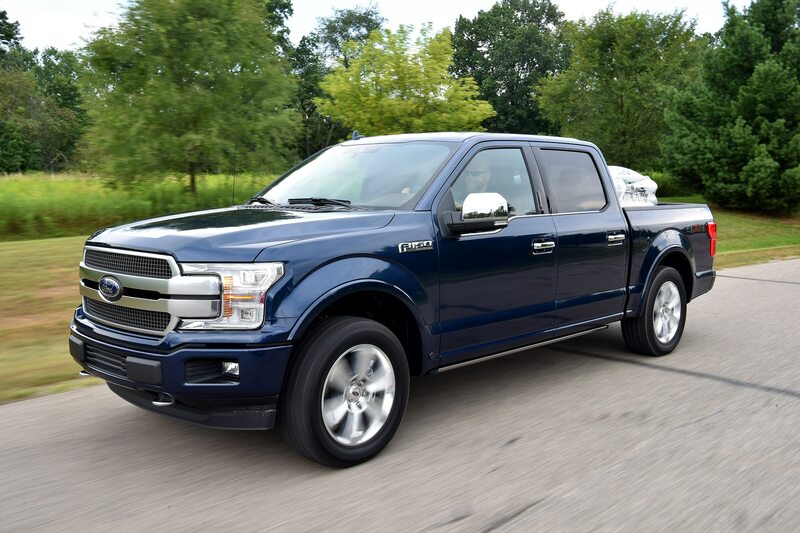 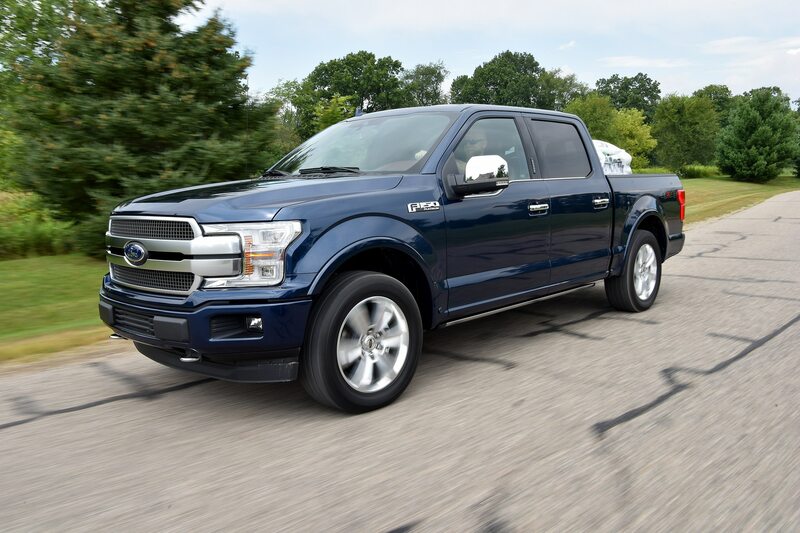 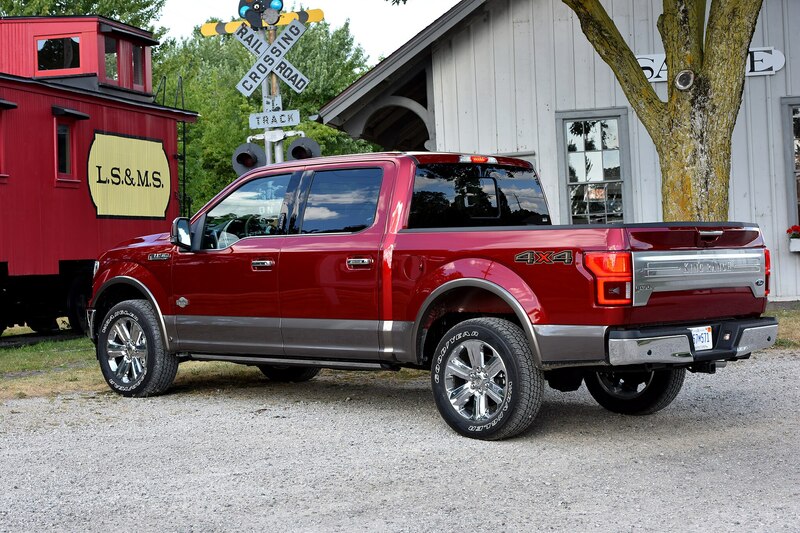 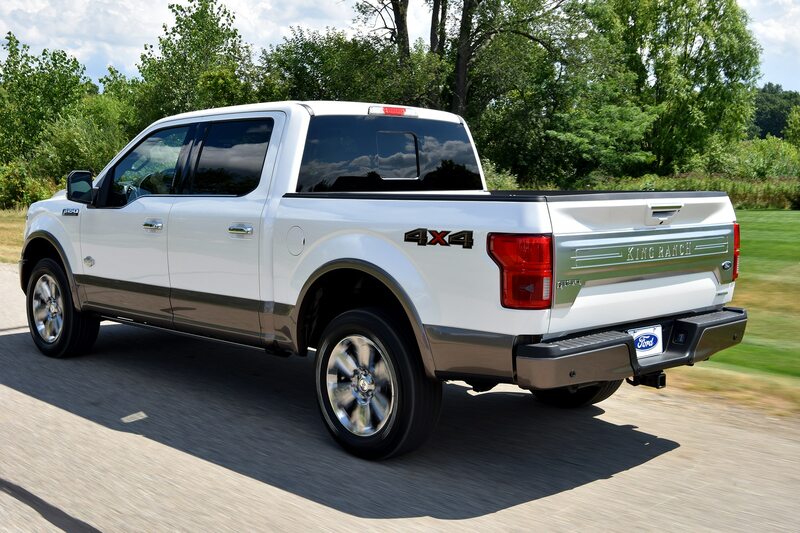 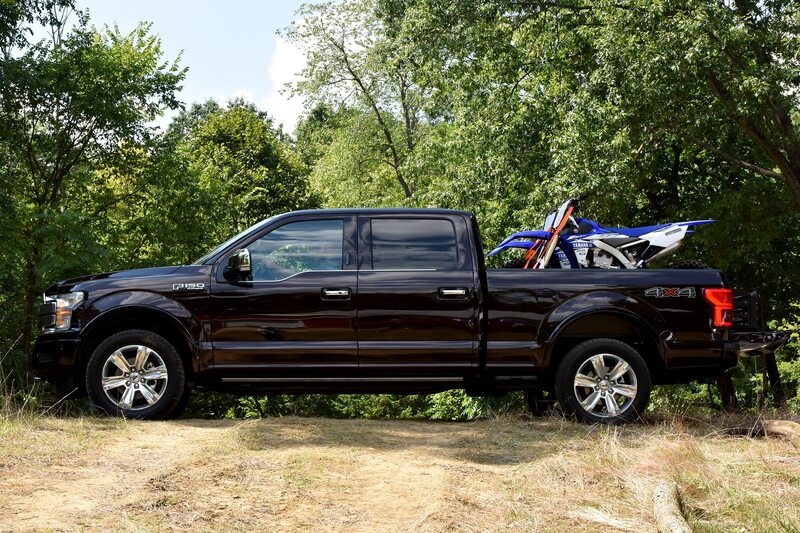 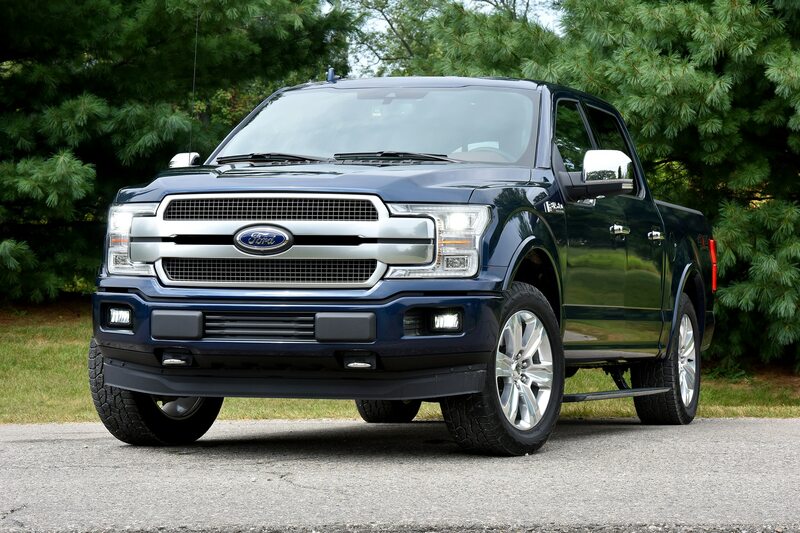 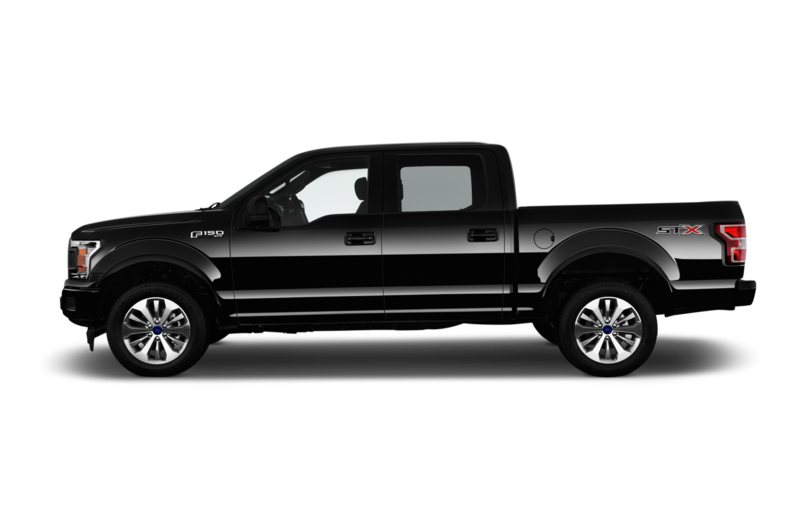 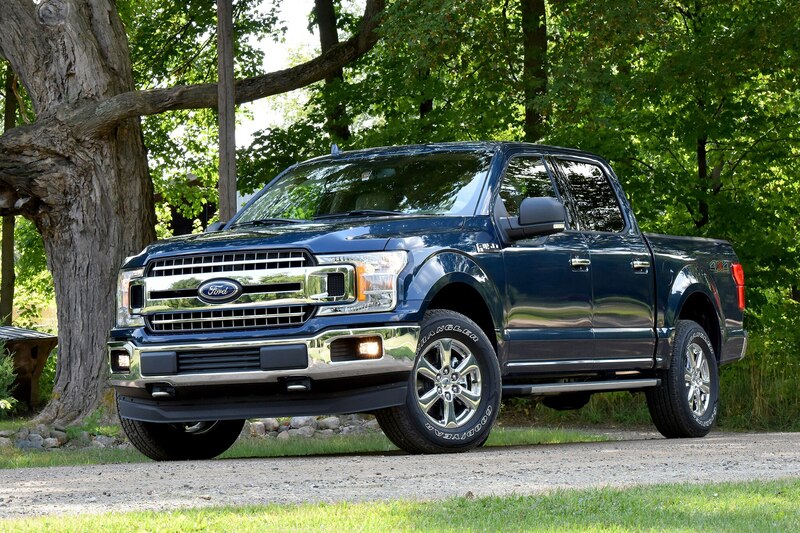 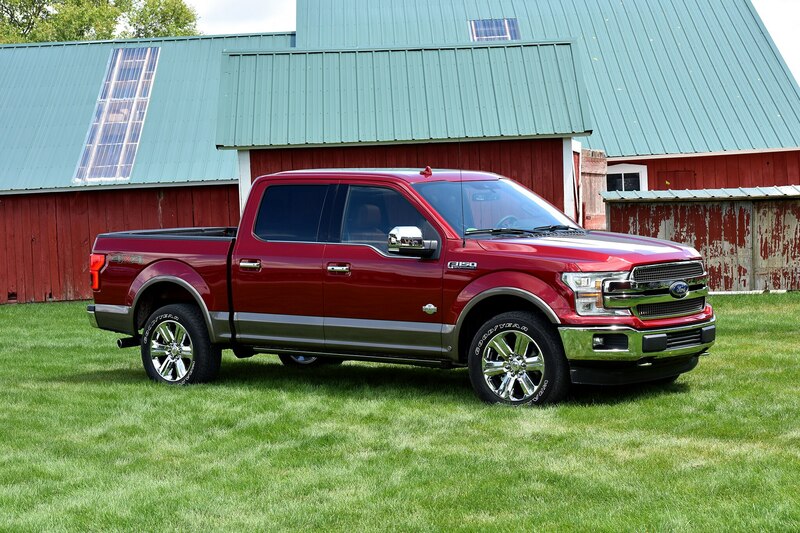 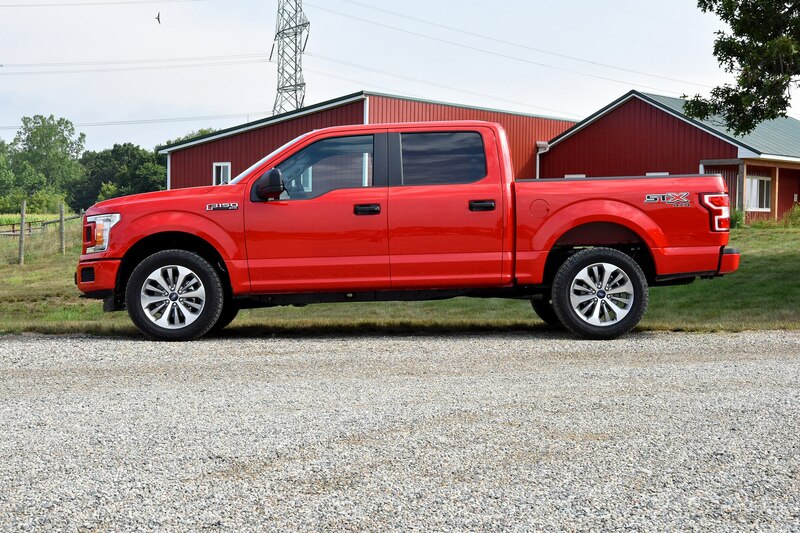 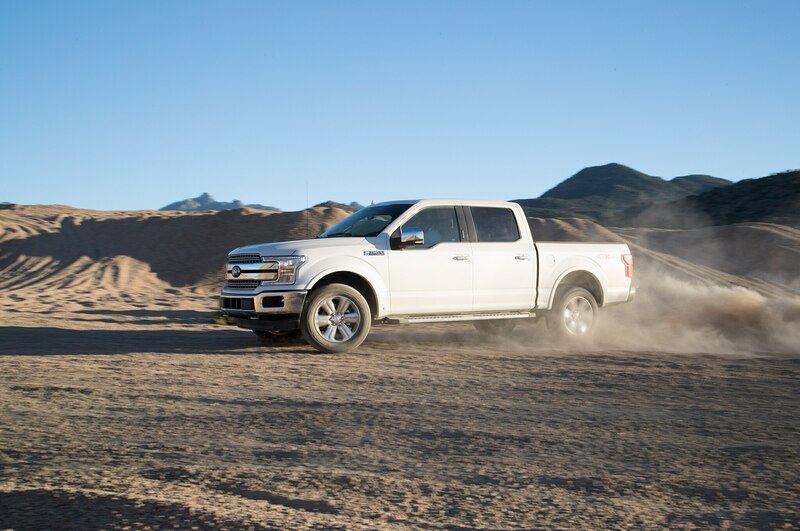 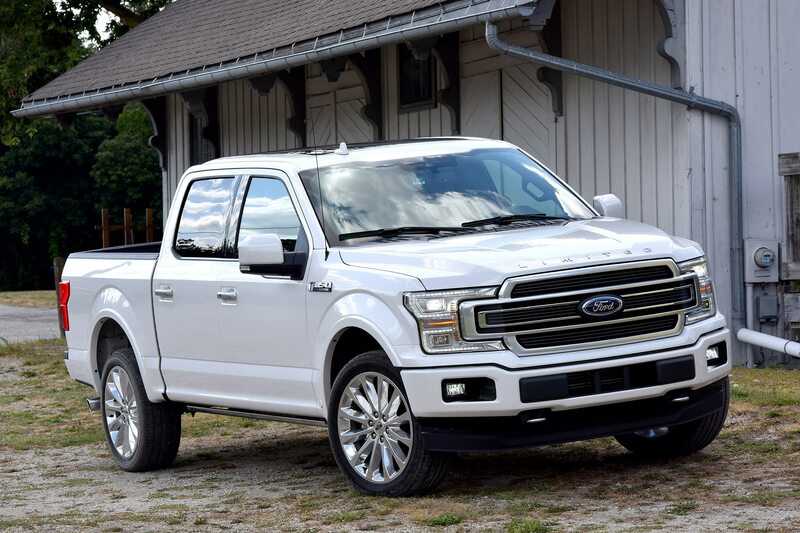 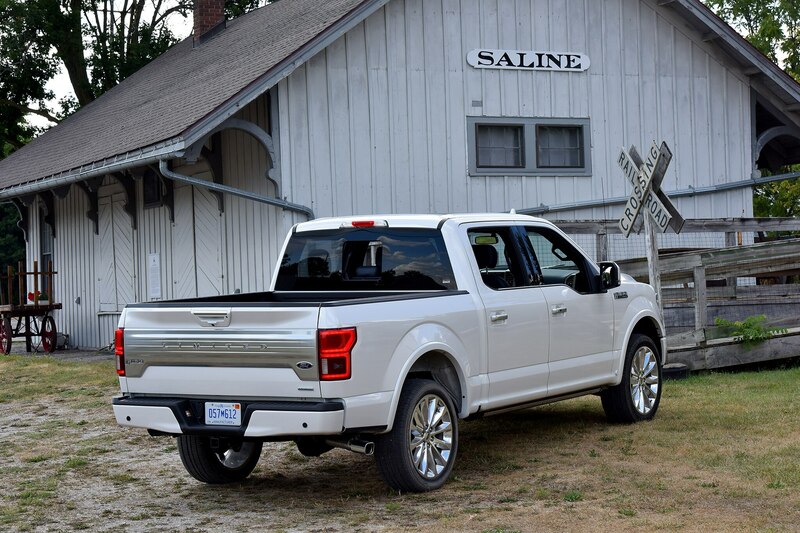 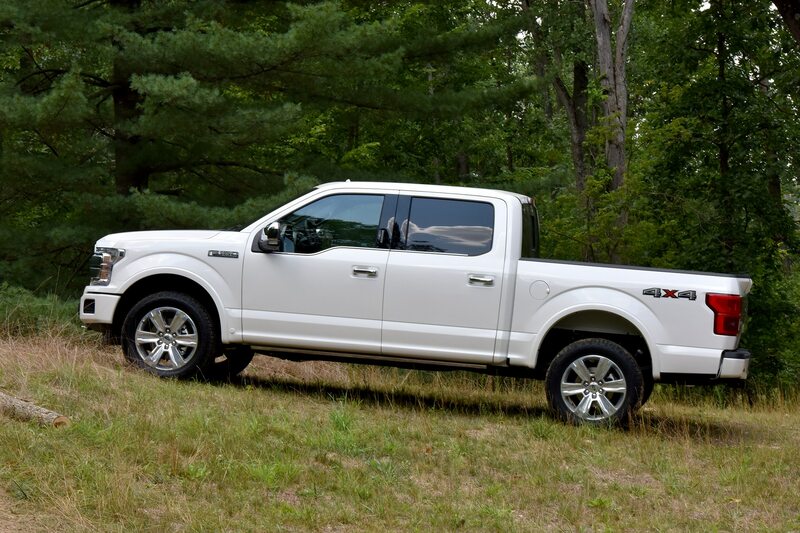 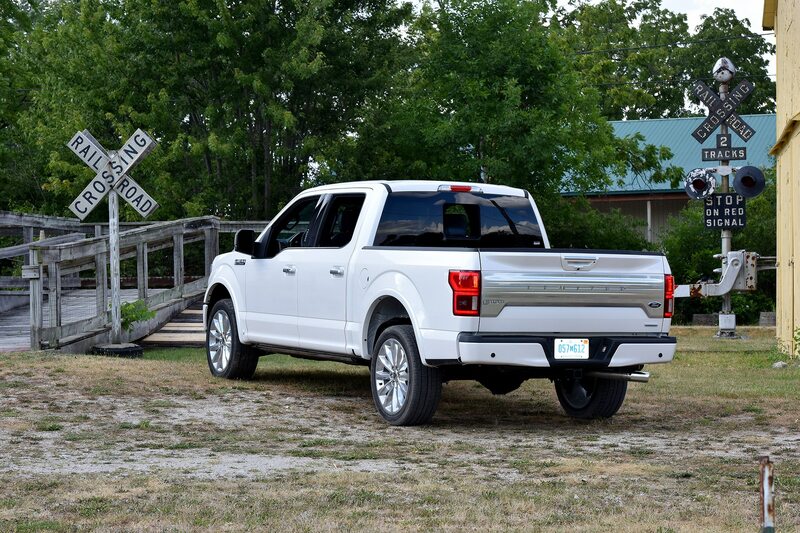 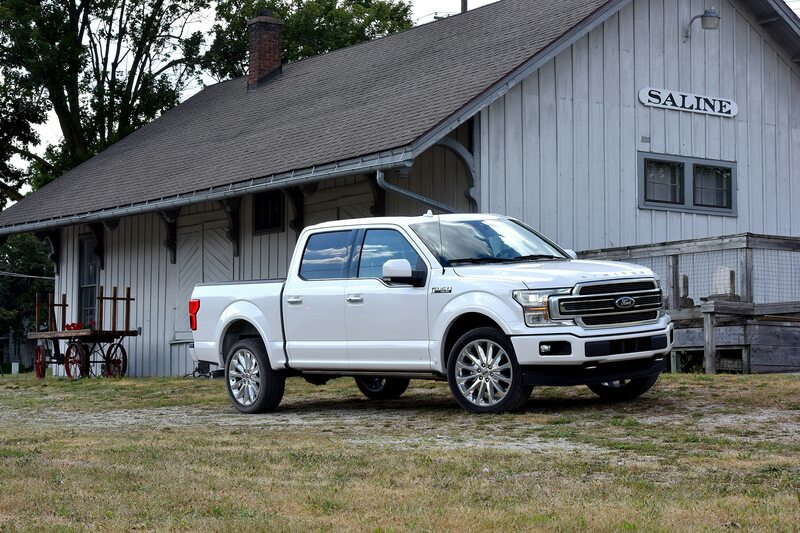 This particular 2018 F-150 didn’t even have one of the three optional engines offered, instead keeping the Lariat’s standard 2.7-liter twin-turbo V-6. 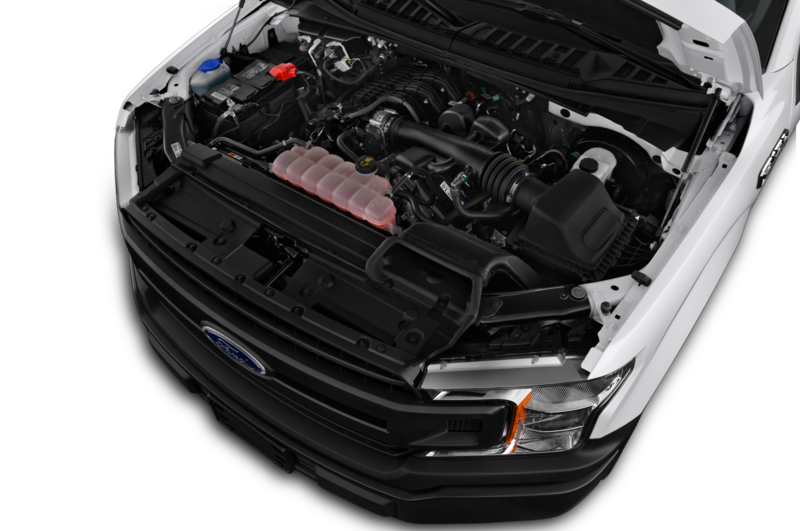 The smaller of Ford’s two six-cylinder EcoBoost engines, it makes a not-too-shabby 325 hp and 400 lb-ft of torque. 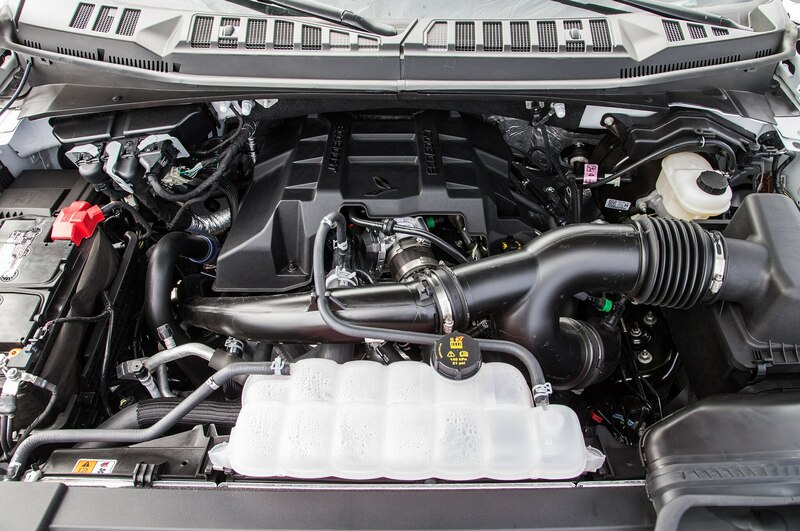 (A naturally aspirated 3.3-liter V-6 good for 290 hp and 265 lb-ft of torque is standard on lower trims). 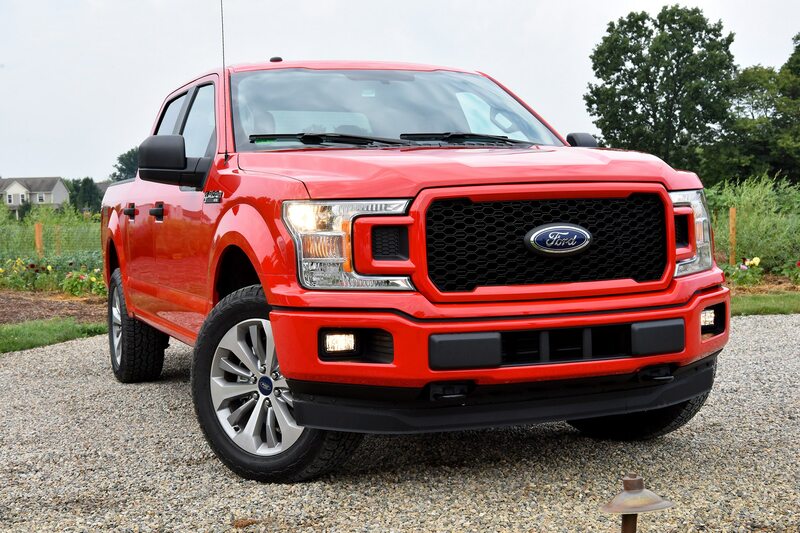 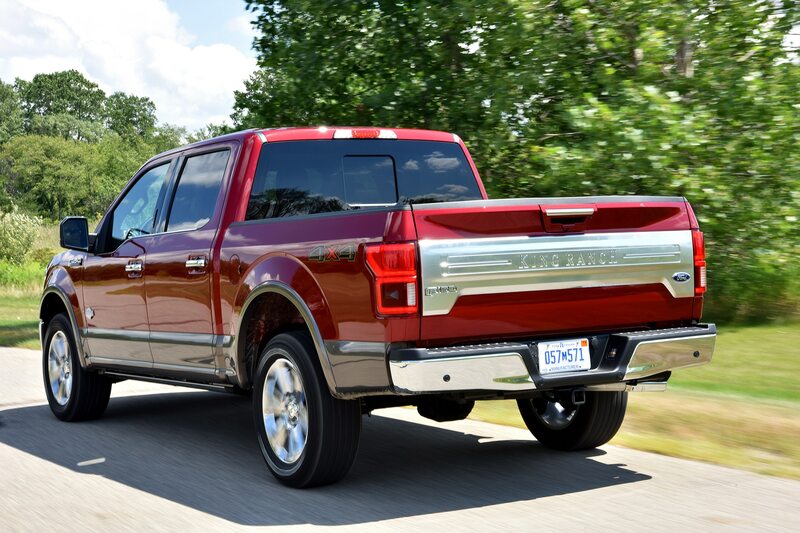 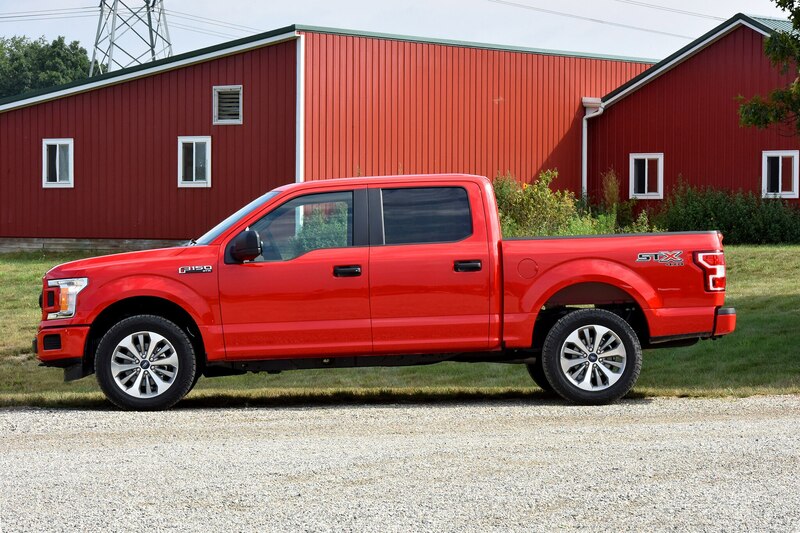 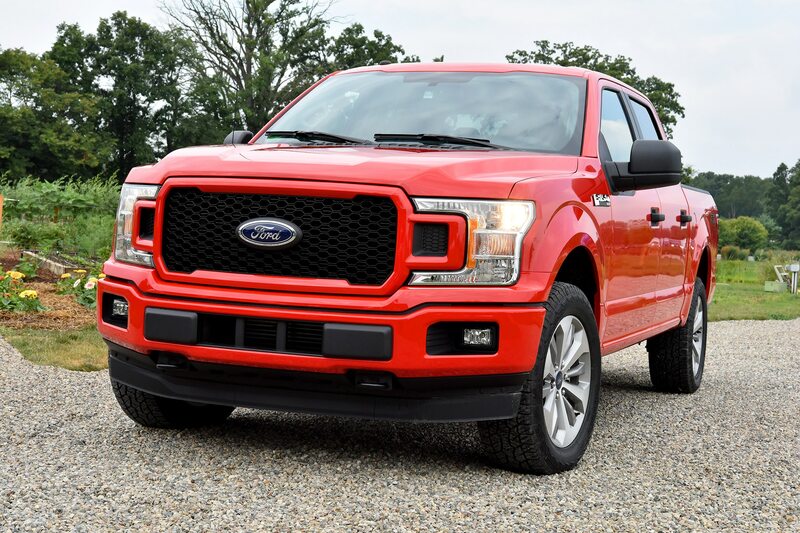 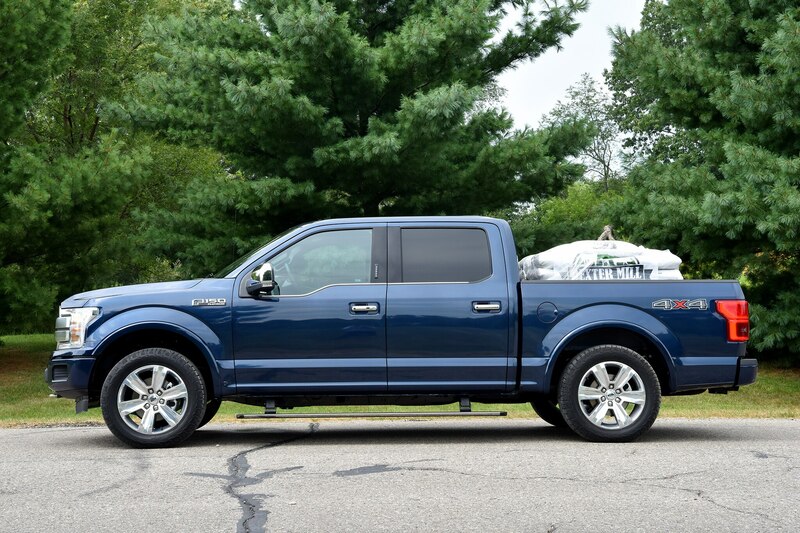 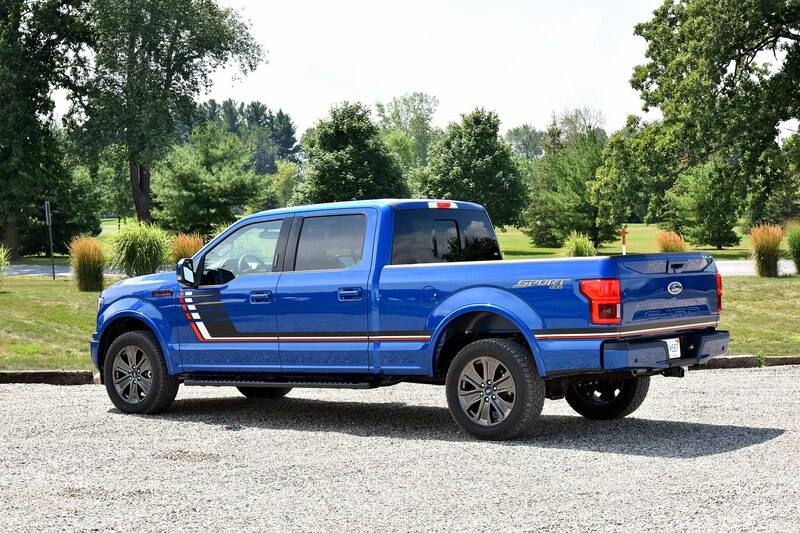 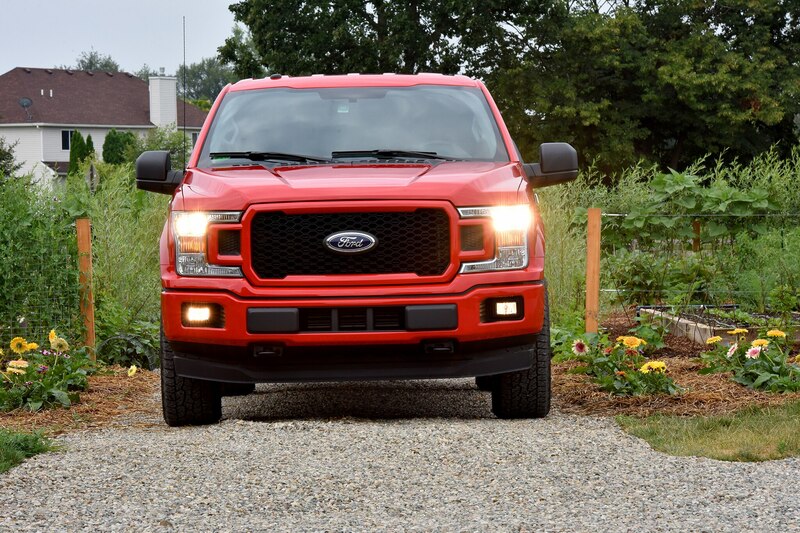 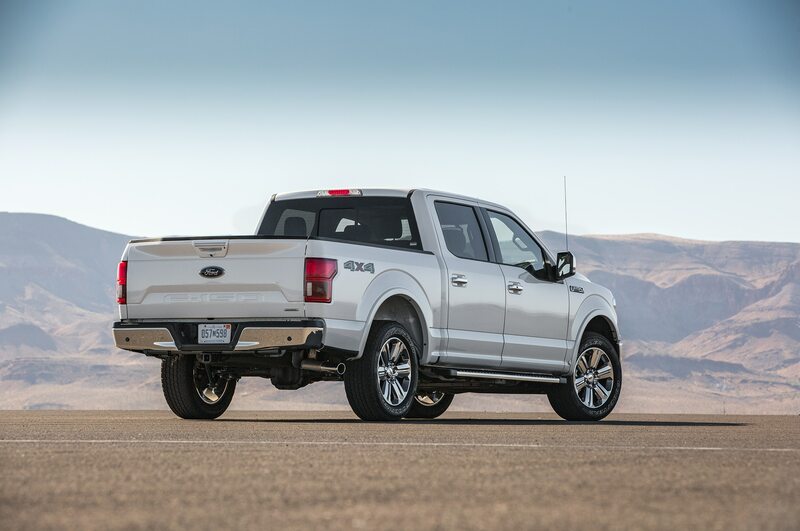 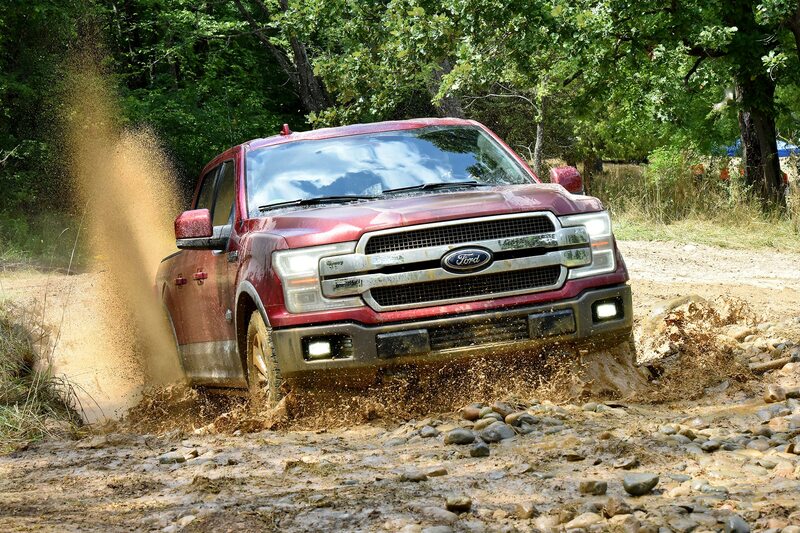 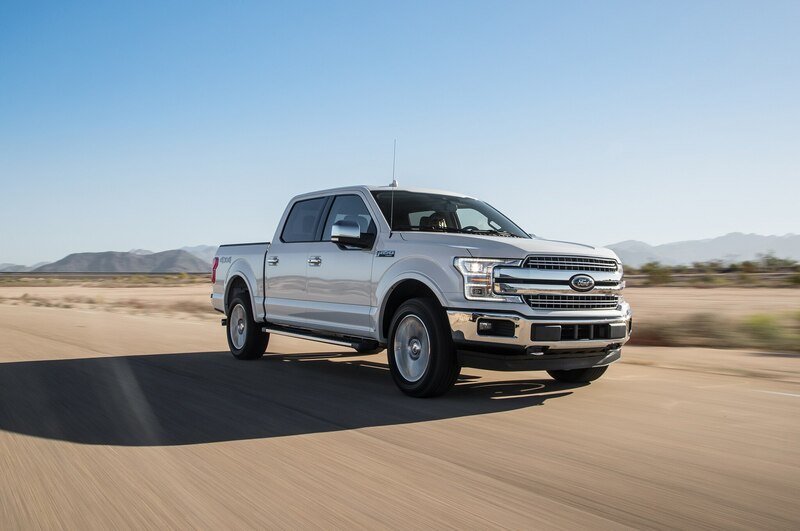 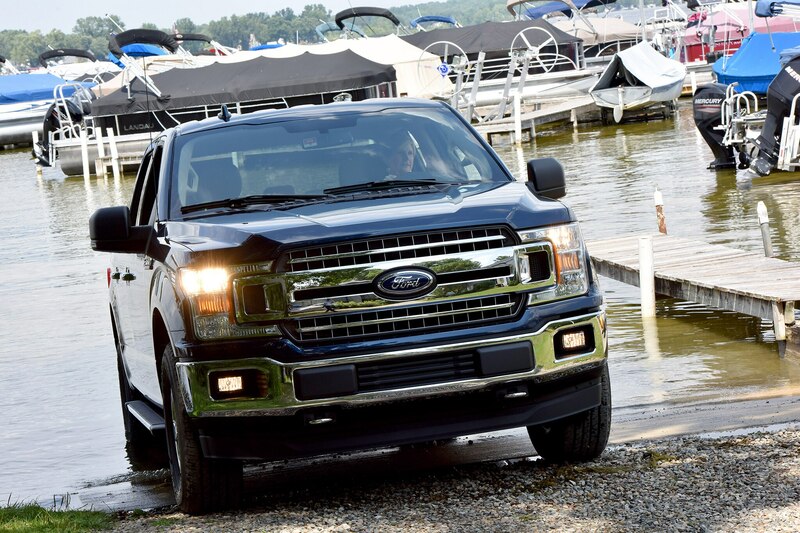 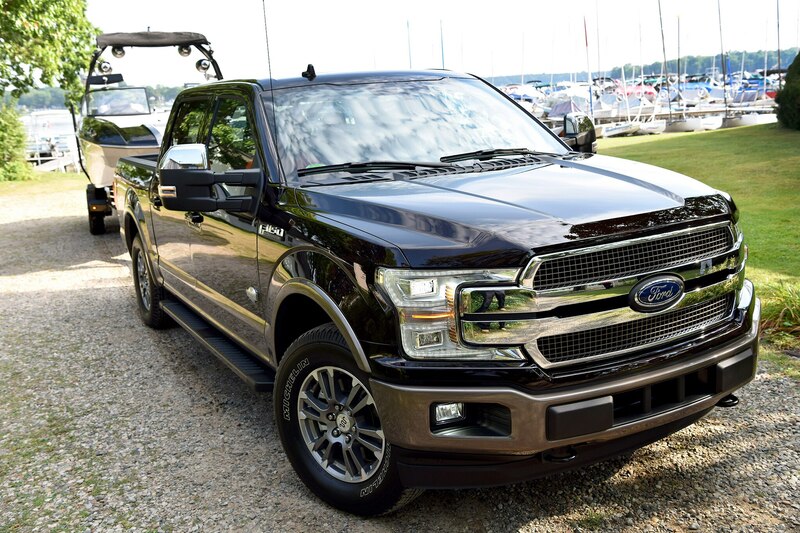 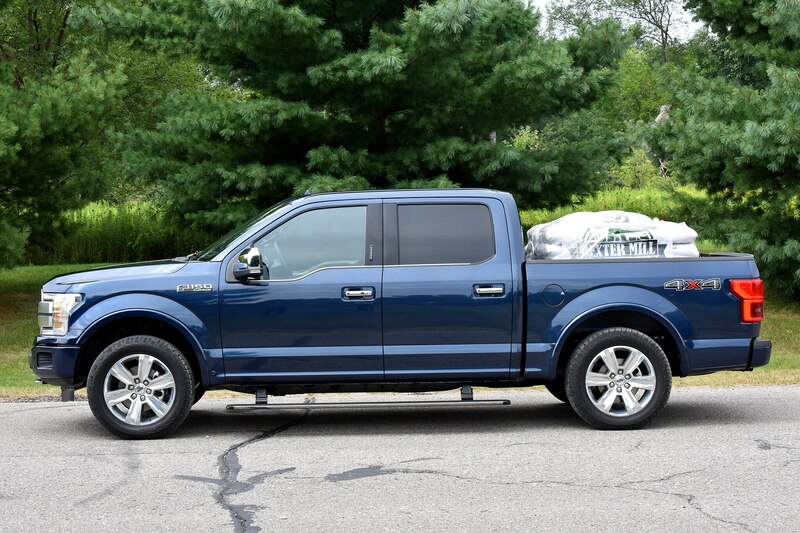 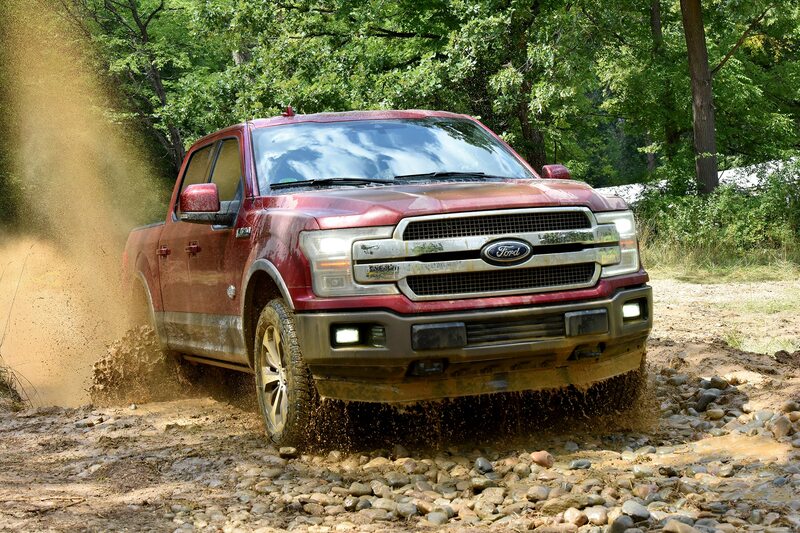 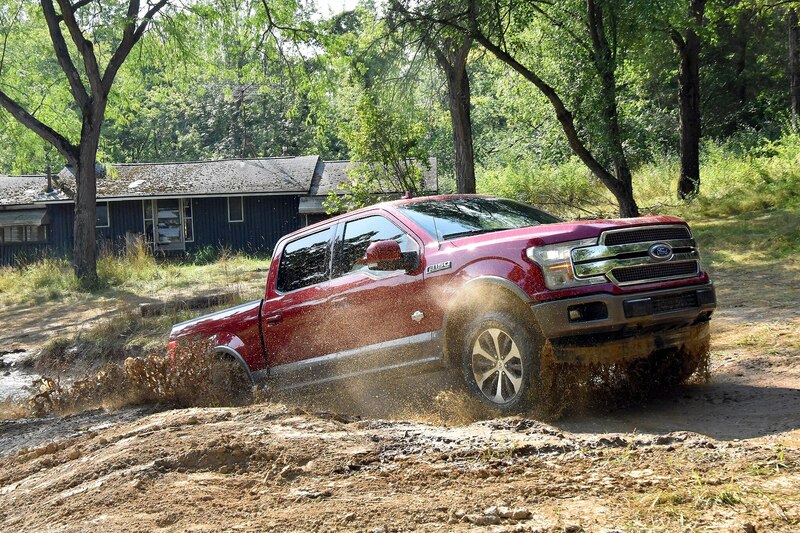 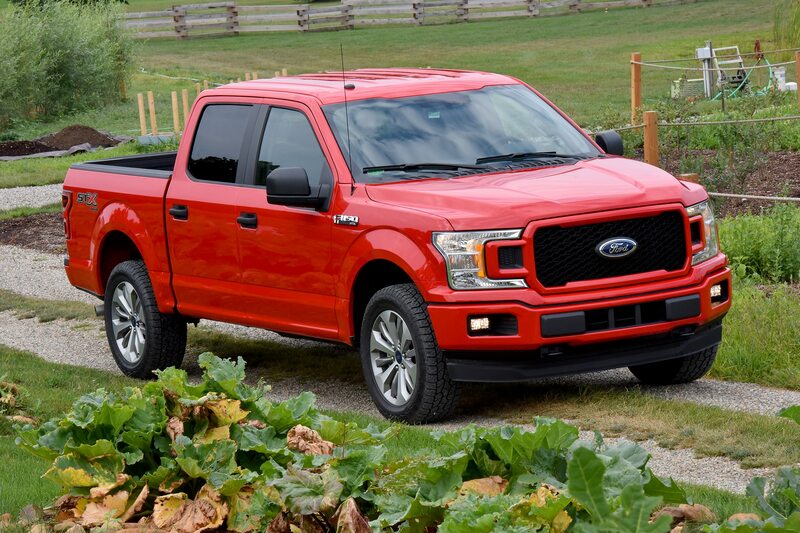 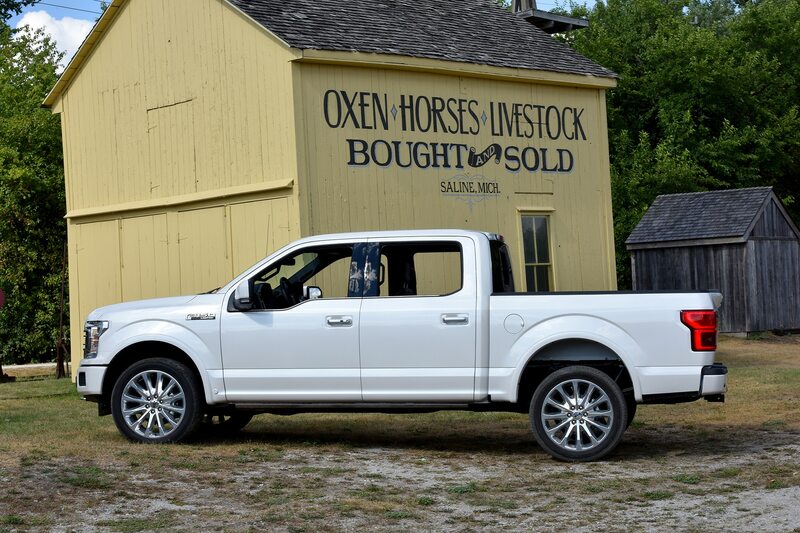 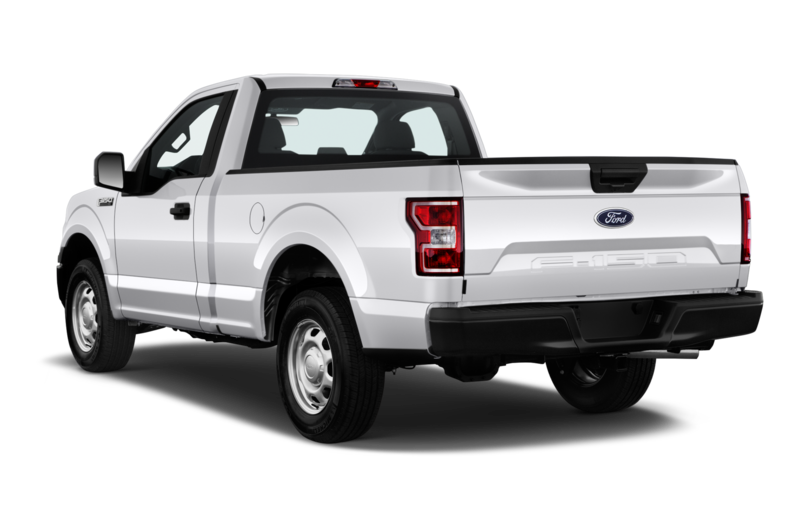 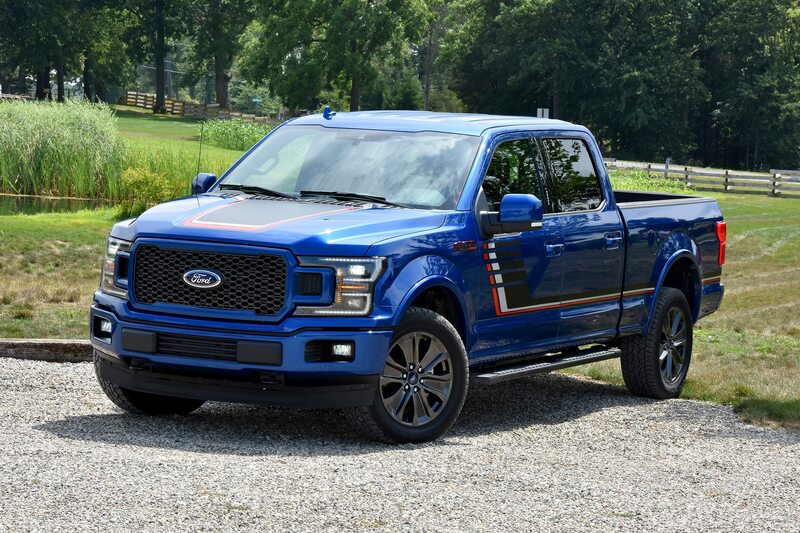 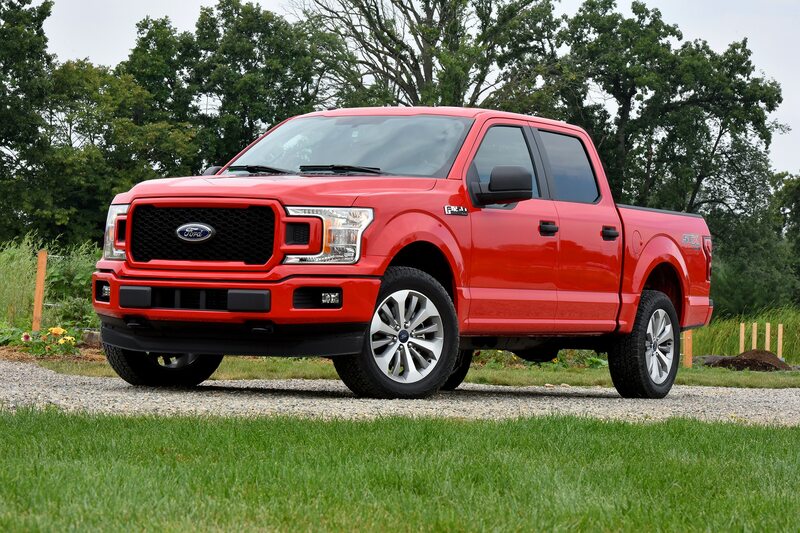 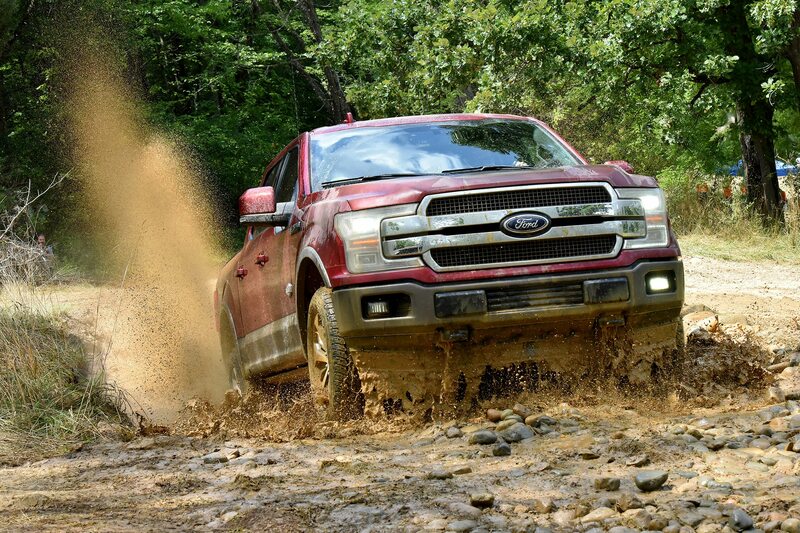 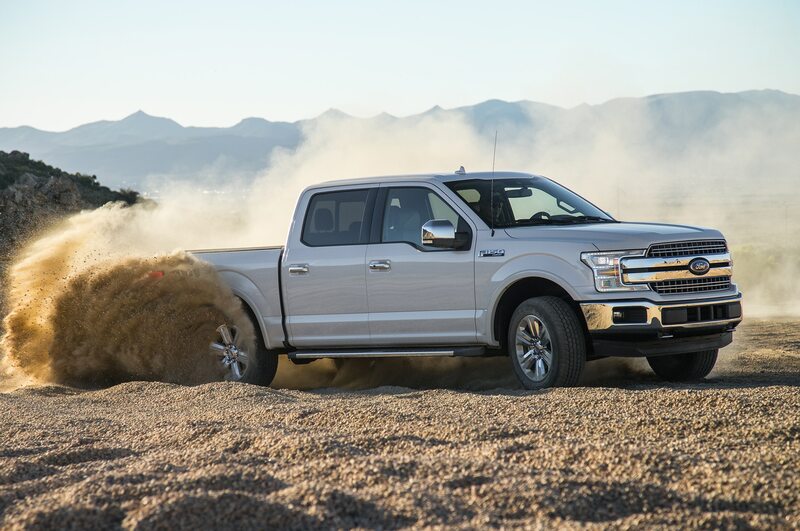 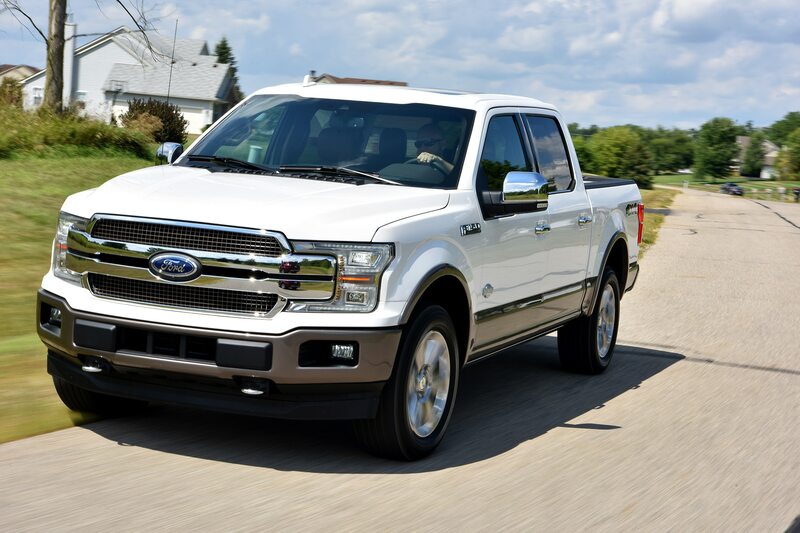 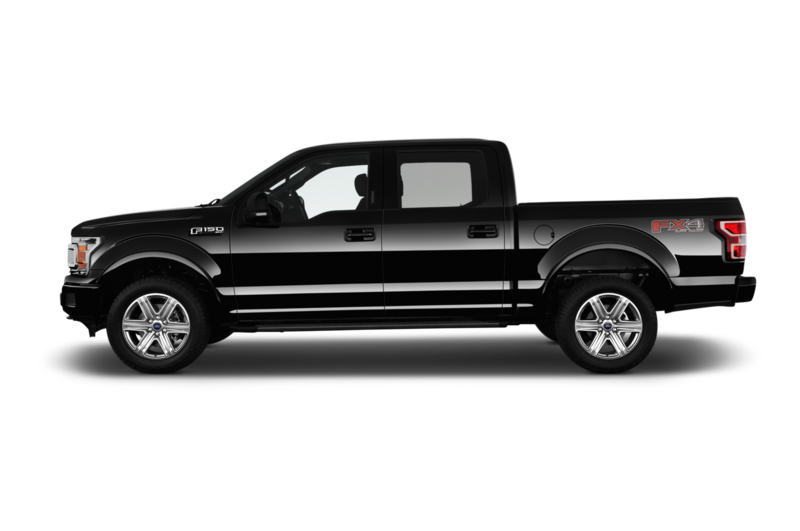 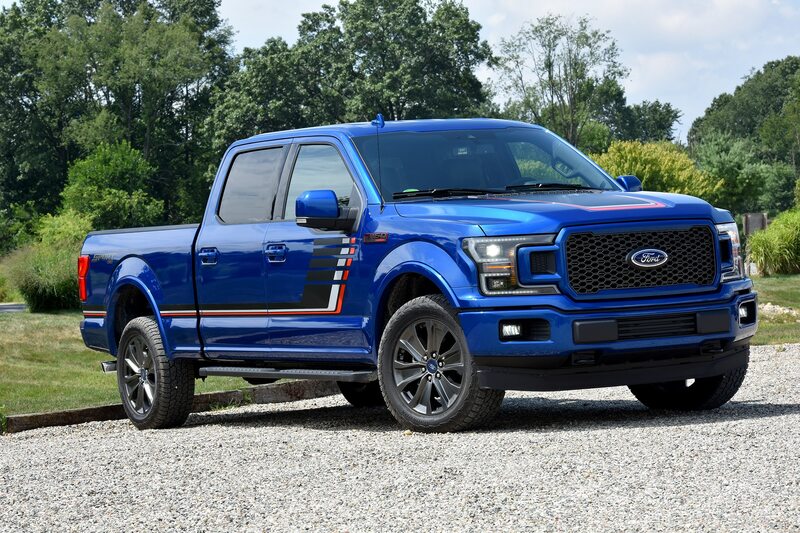 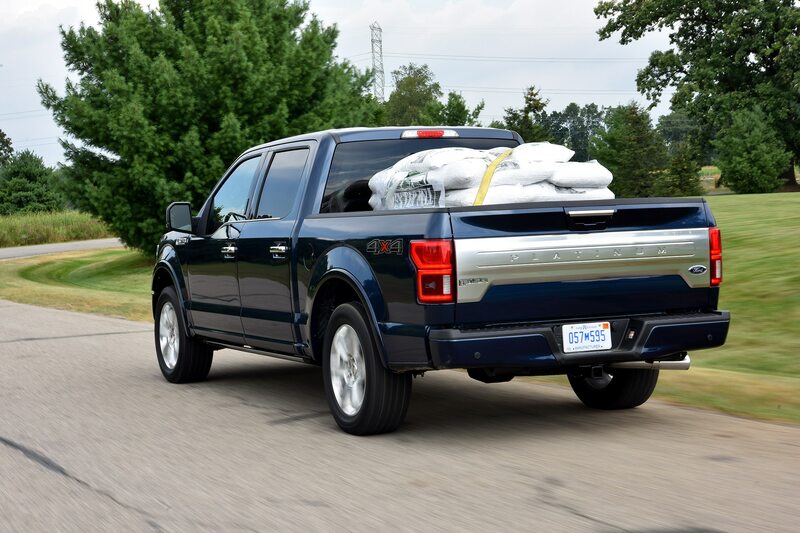 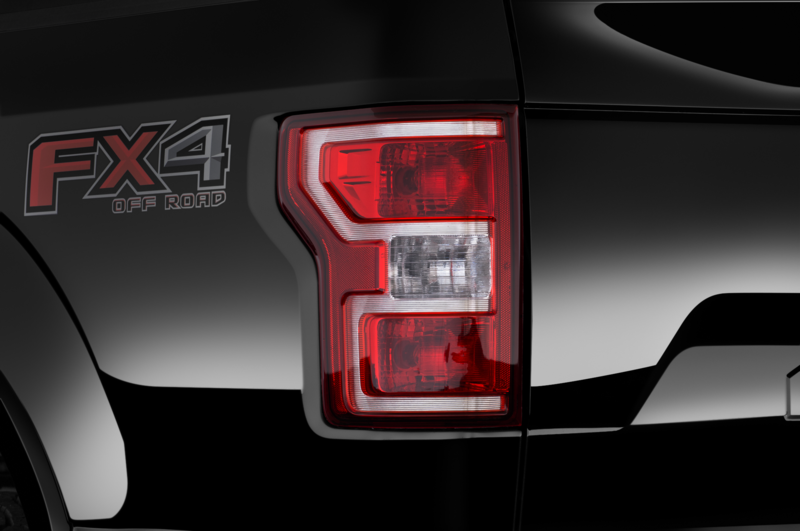 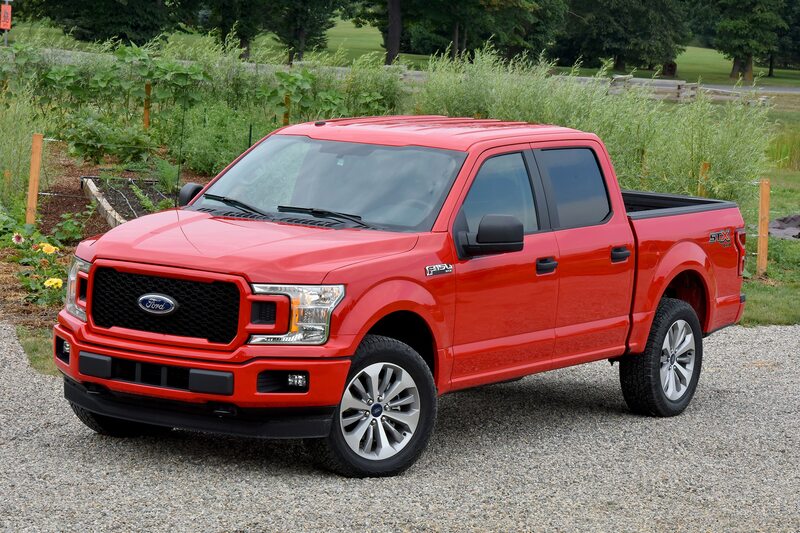 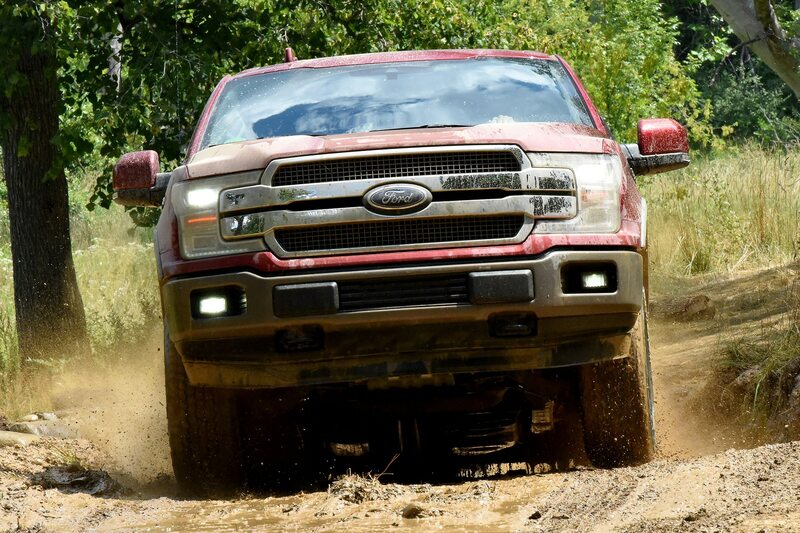 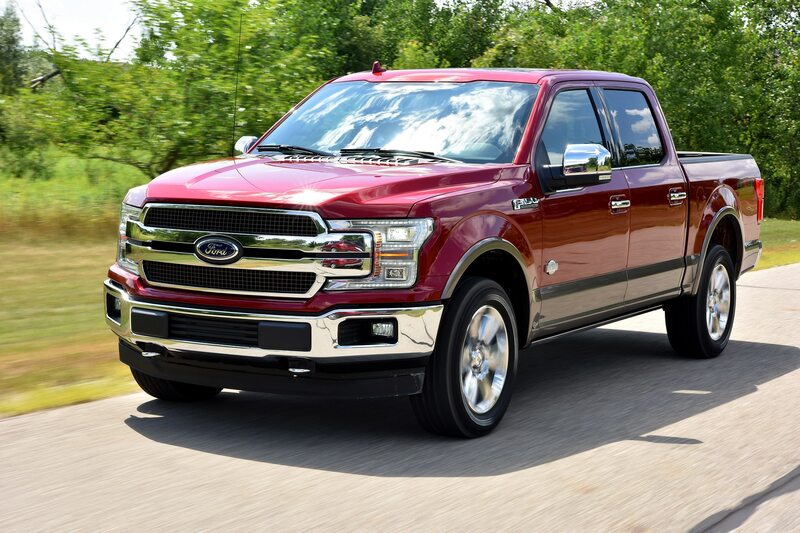 While it doesn’t deliver the completely effortless experience provided by its 3.5-liter cousin, which makes at least 375 hp and 470 lb-ft of torque (450 hp and 510 lb-ft in Raptor spec), the engine smoothly and progressively delivers plenty of power for everyday driving if you’re hauling nothing but air. 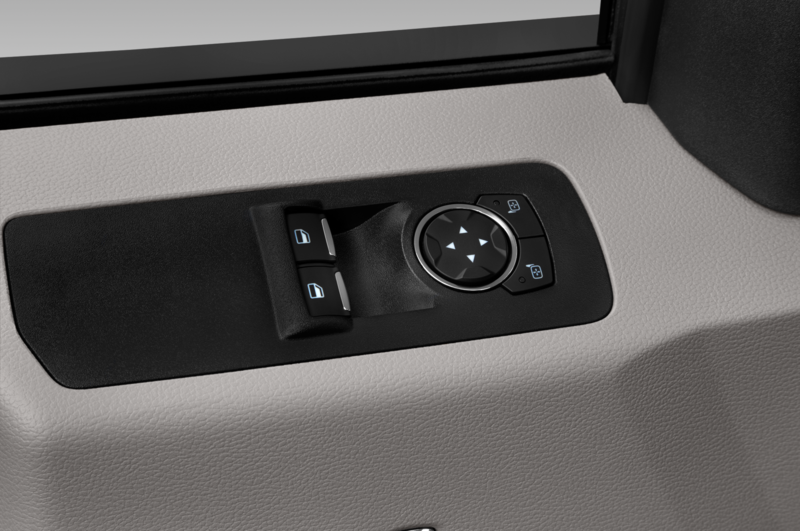 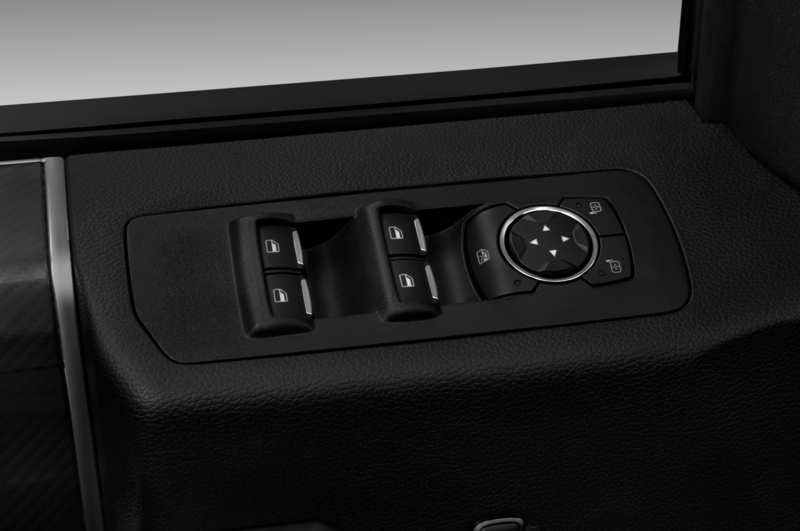 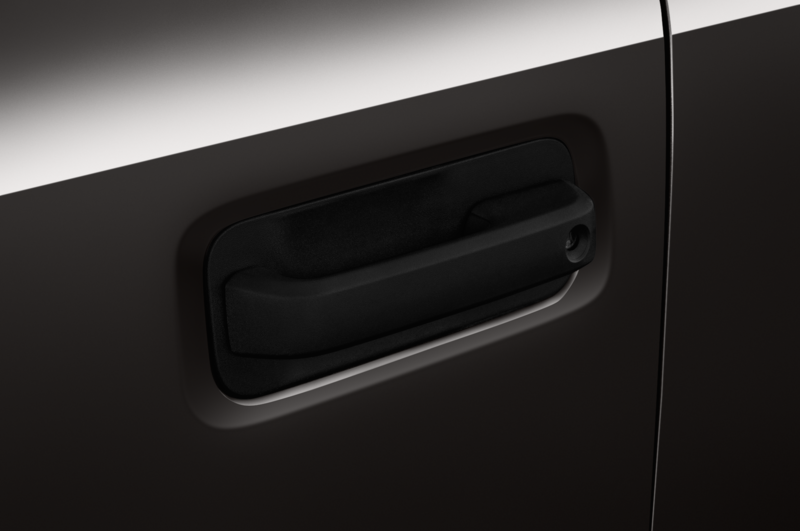 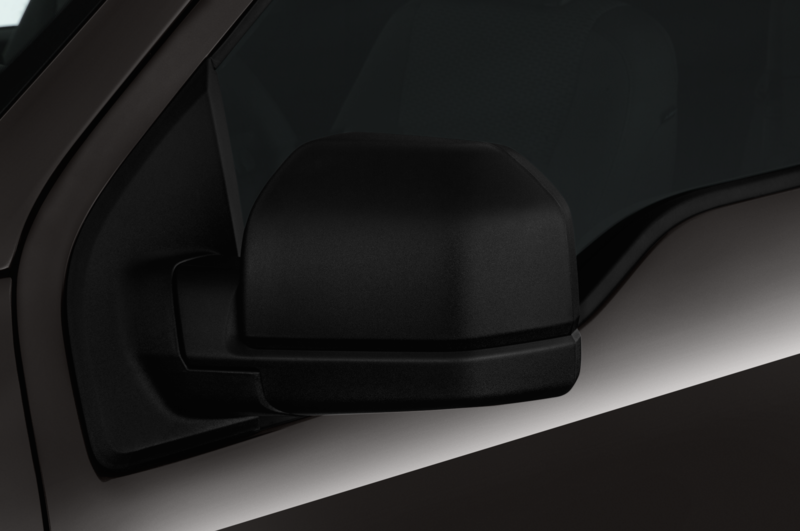 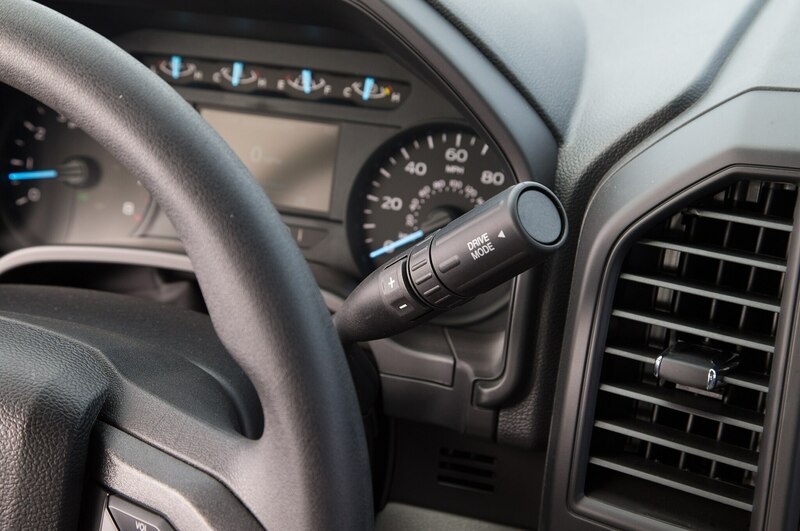 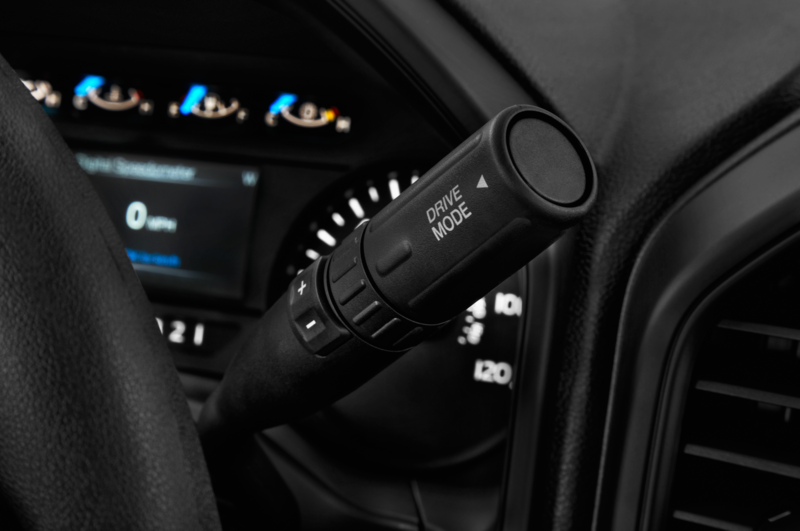 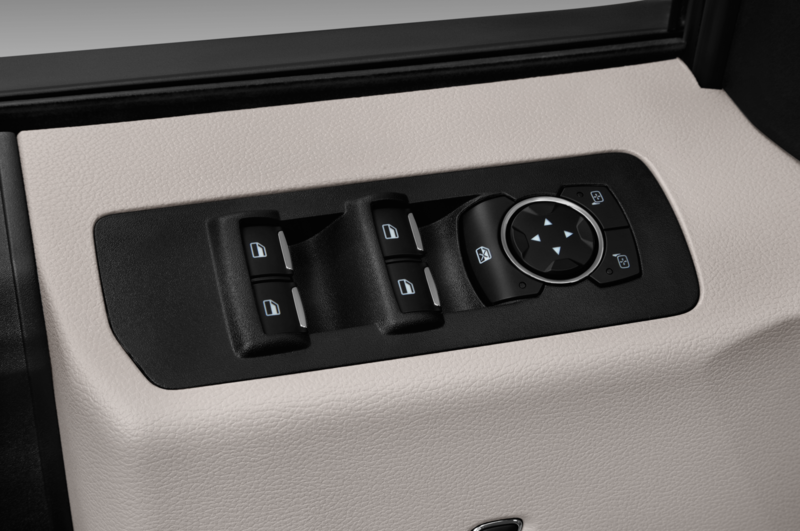 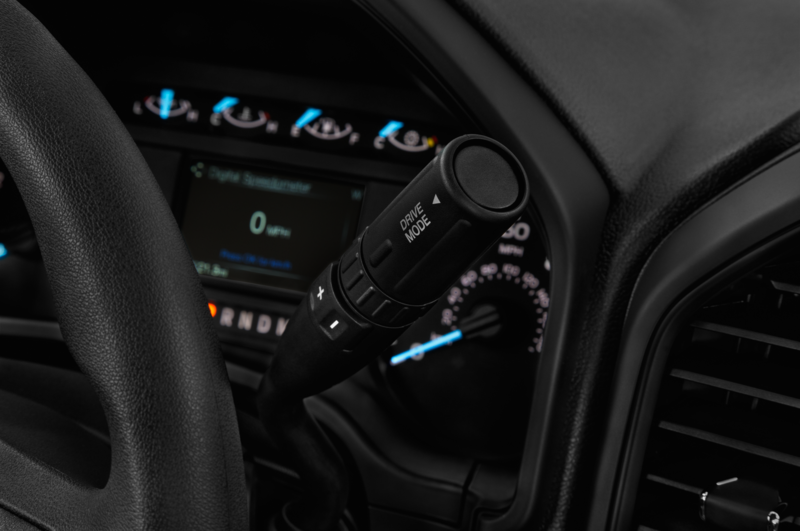 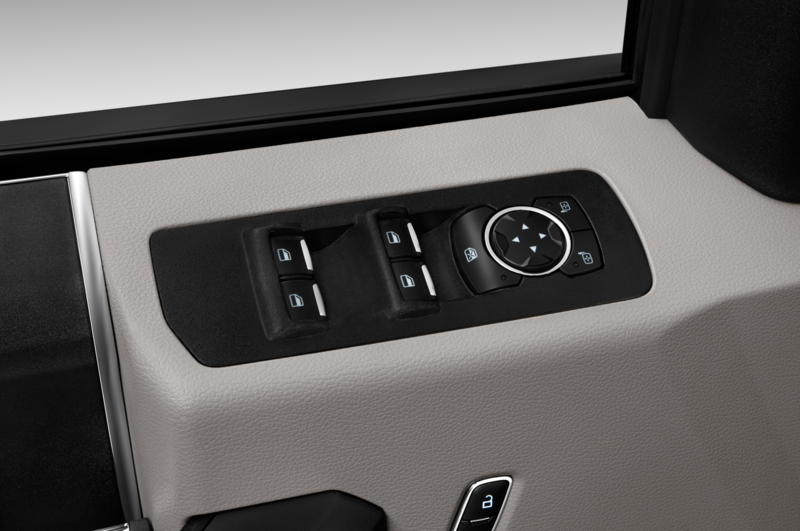 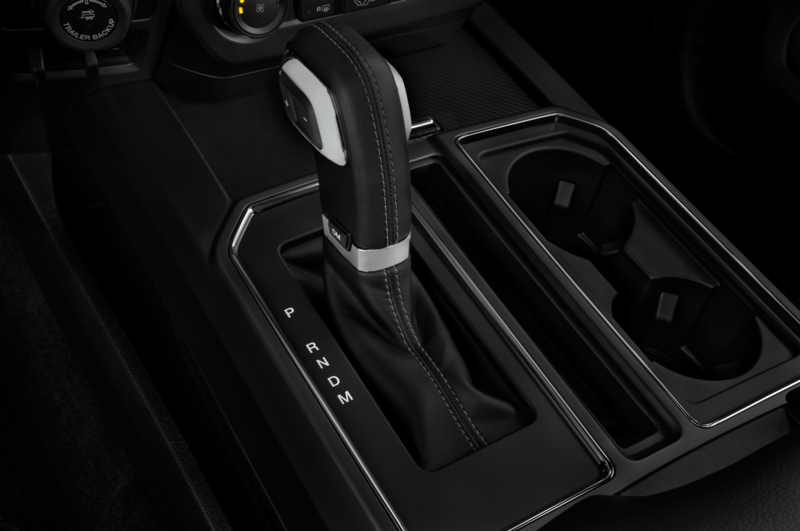 Its 10-speed automatic hunts for gears in normal mode as if it’s being paid by the shift, but simmers down considerably when switched into sport mode via a (rather small) button on the driver’s side of the console-mounted shifter. 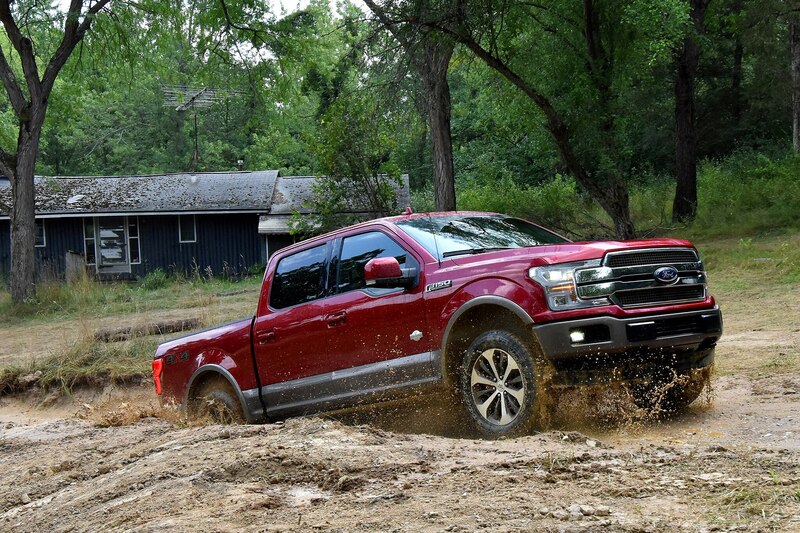 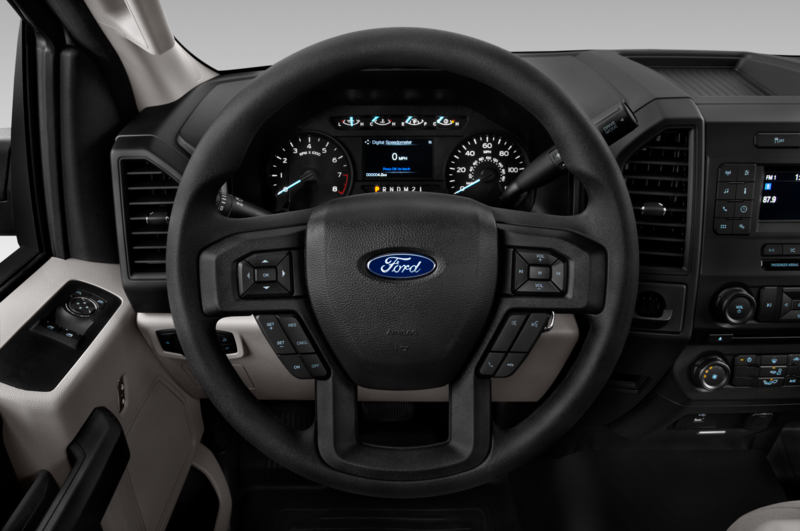 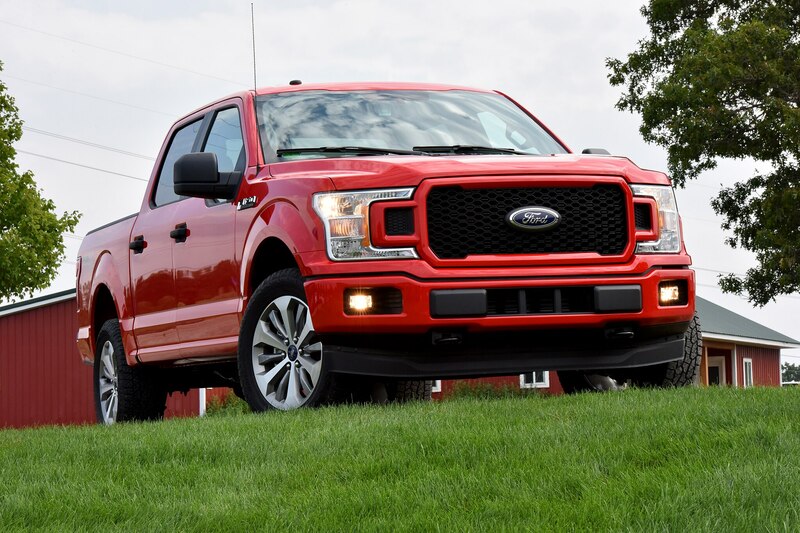 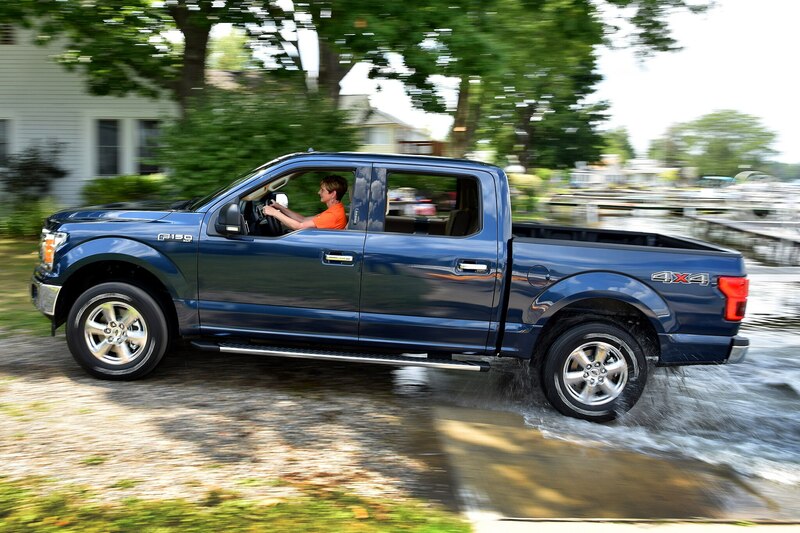 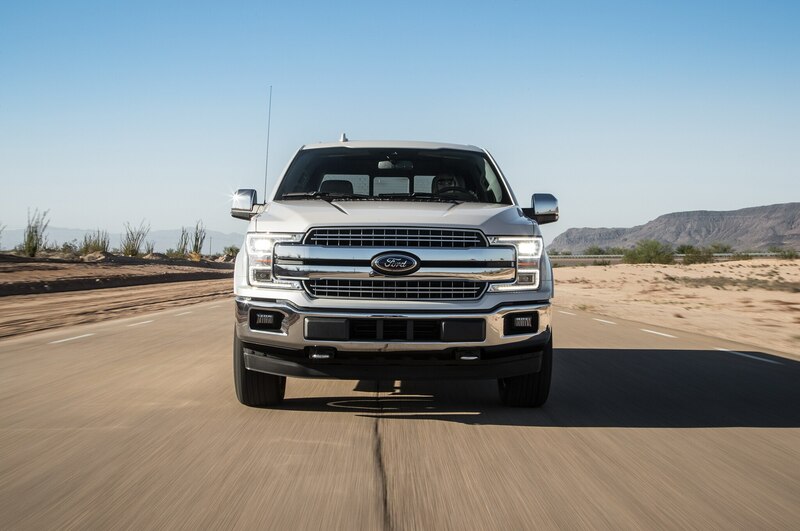 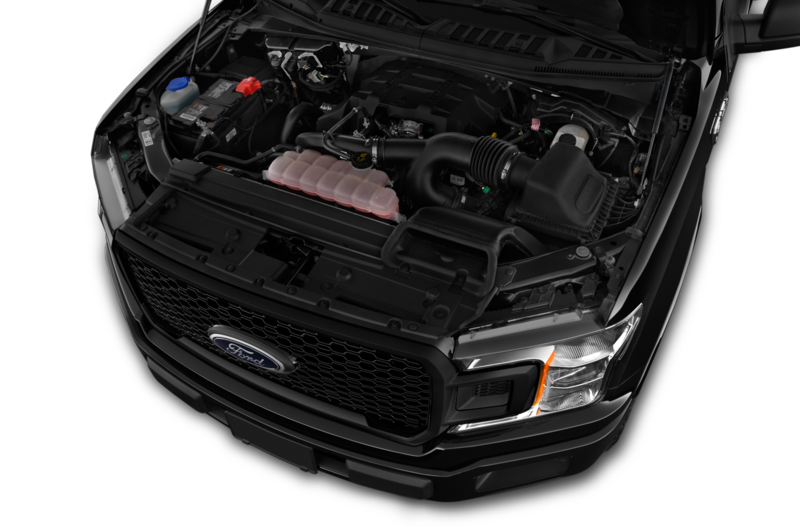 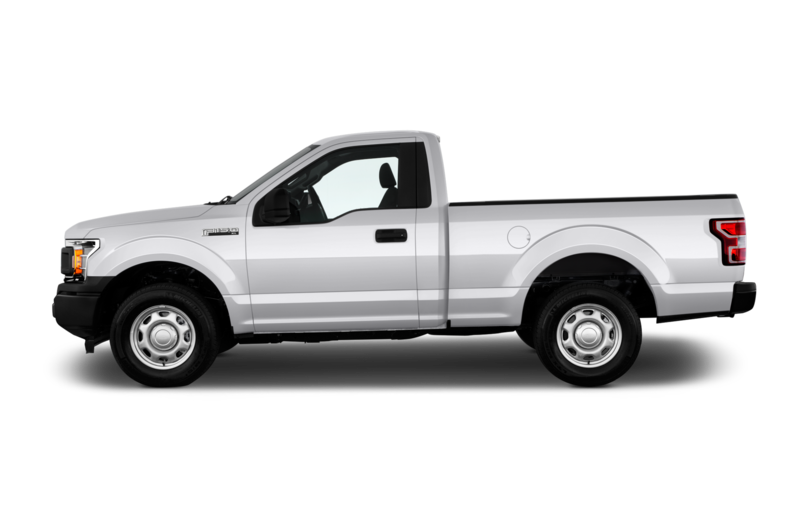 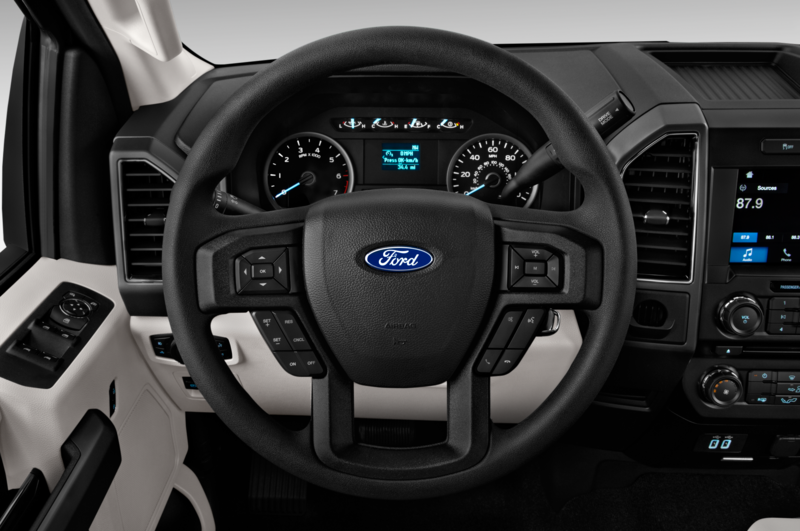 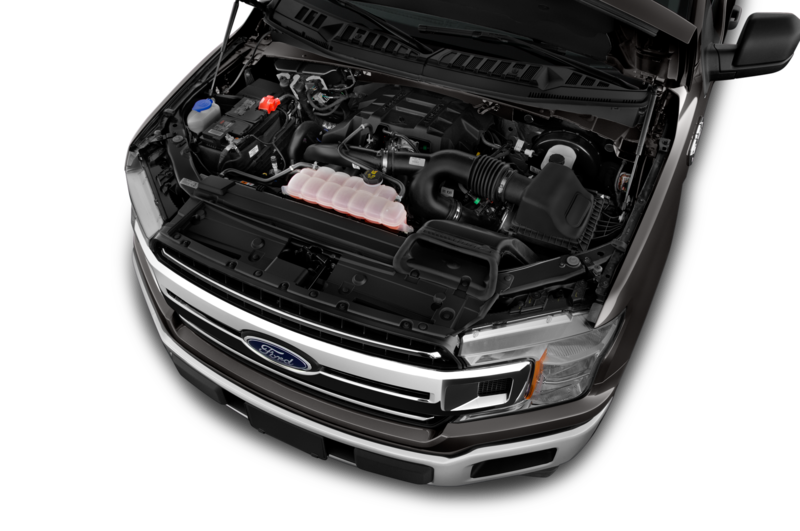 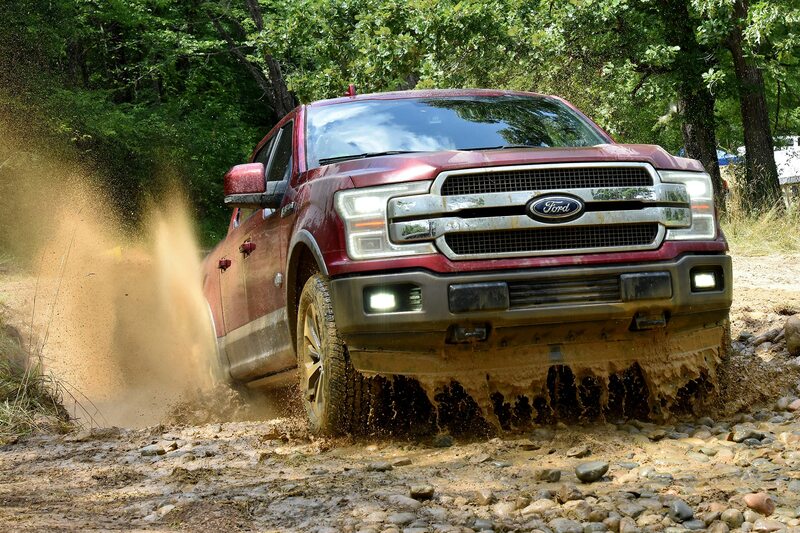 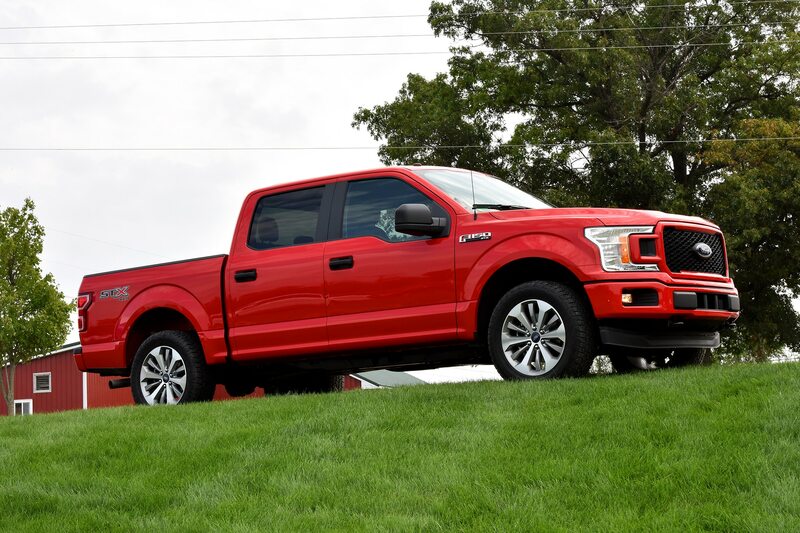 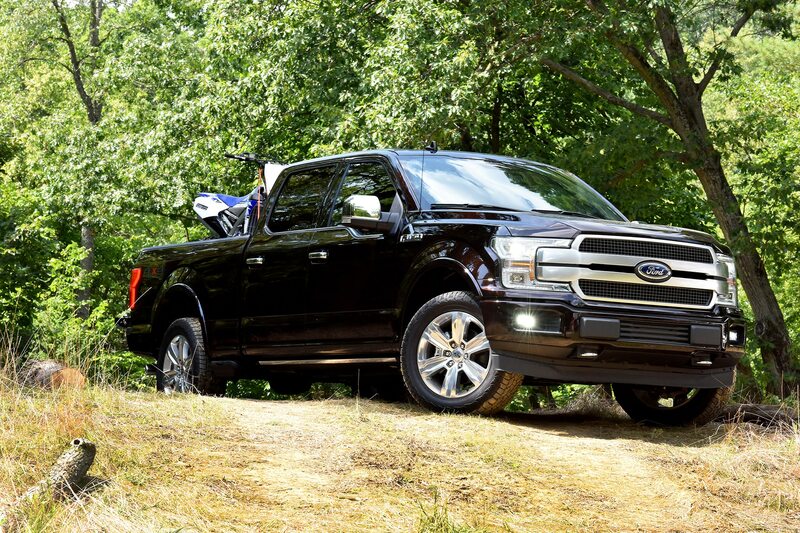 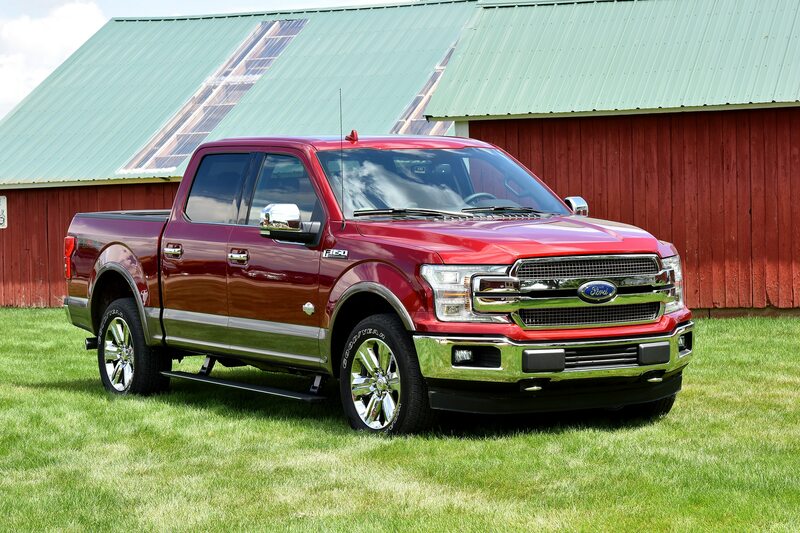 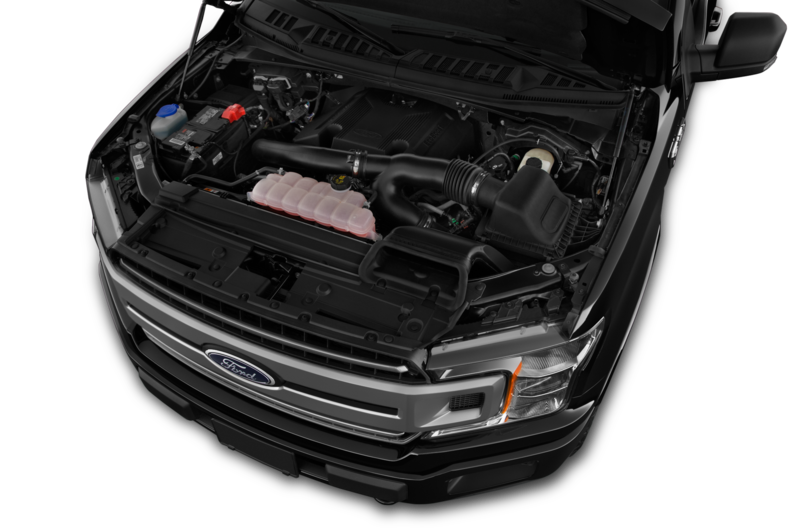 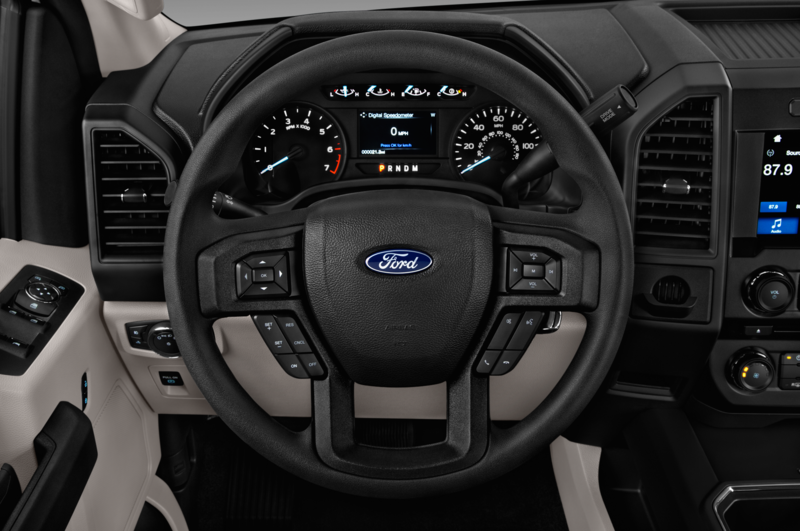 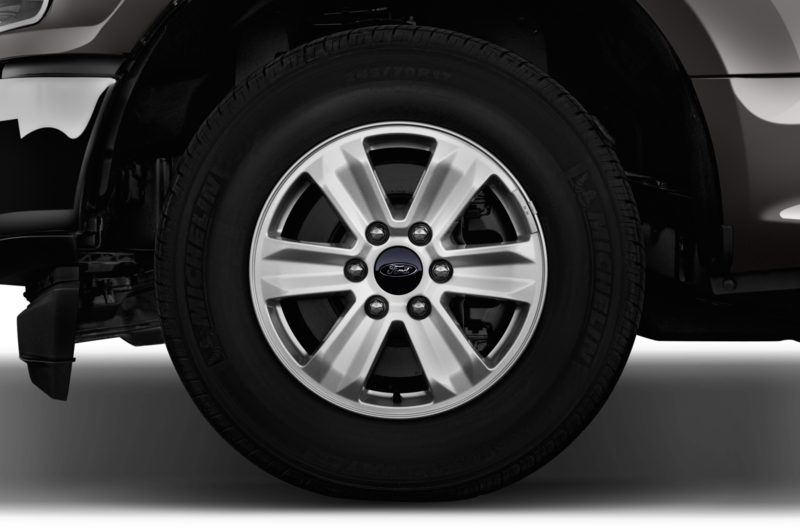 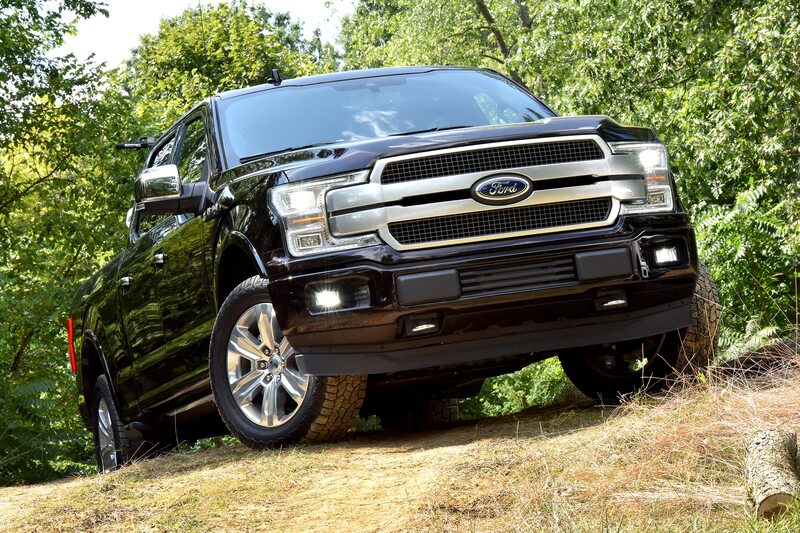 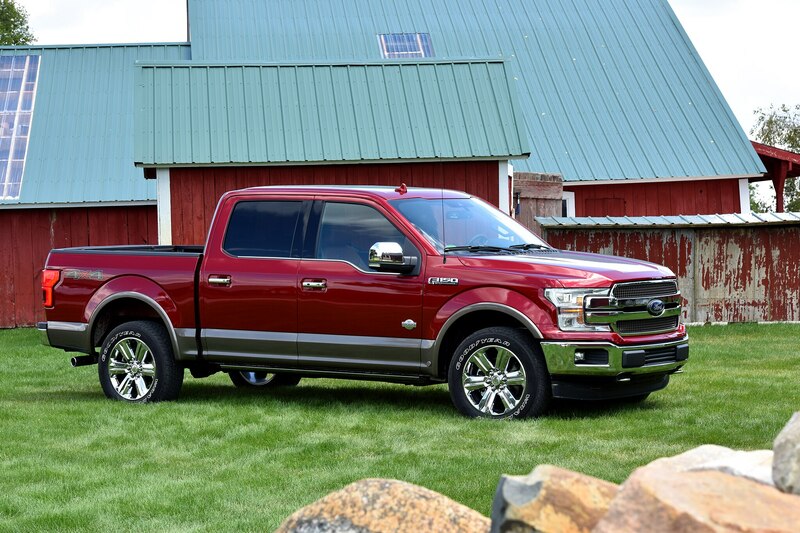 The engine and transmission were among a number of updates Ford made to the F-150 for the 2018 model year. 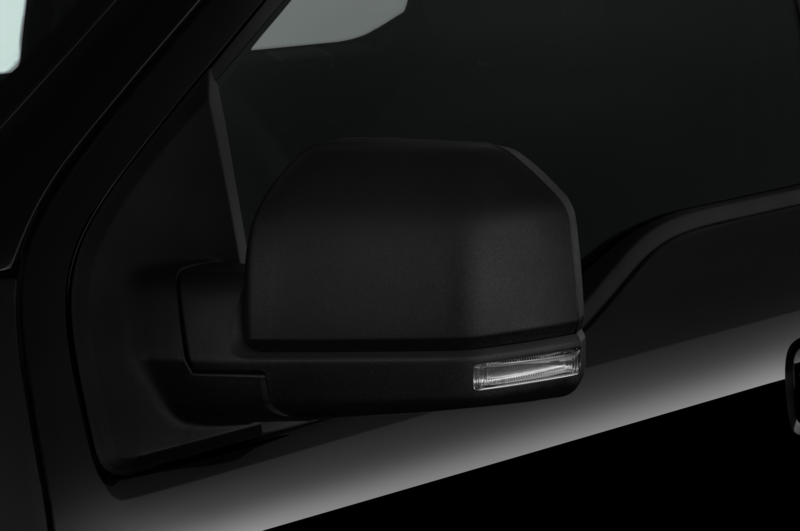 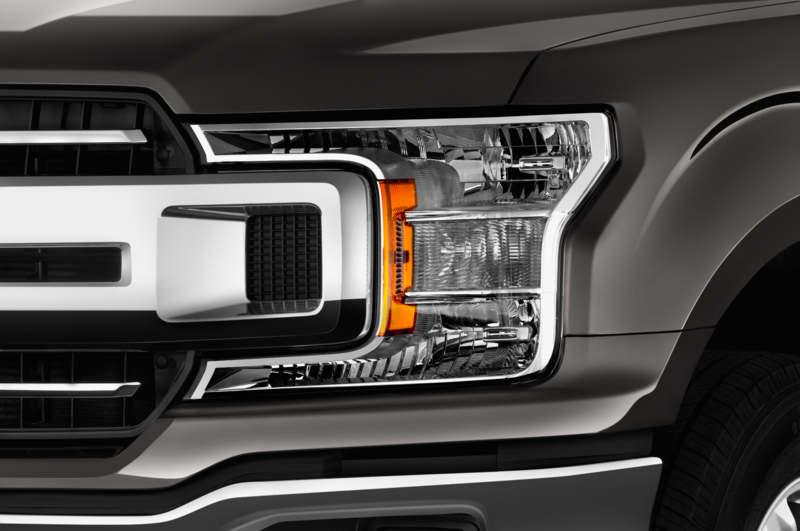 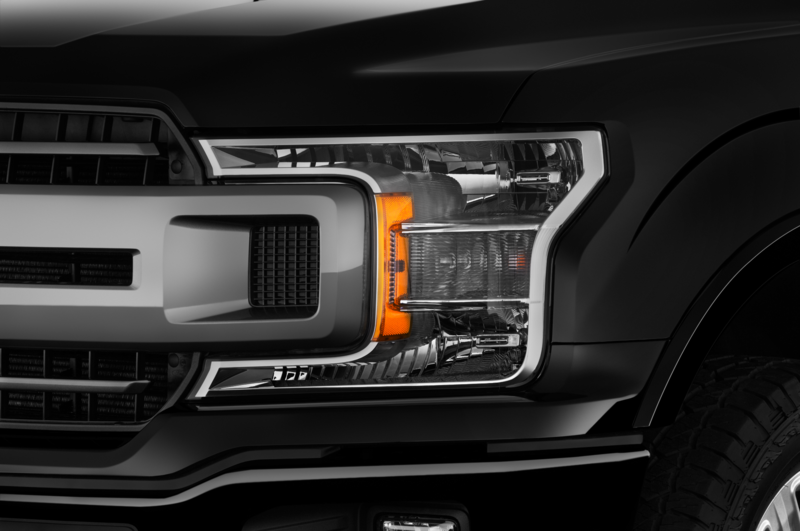 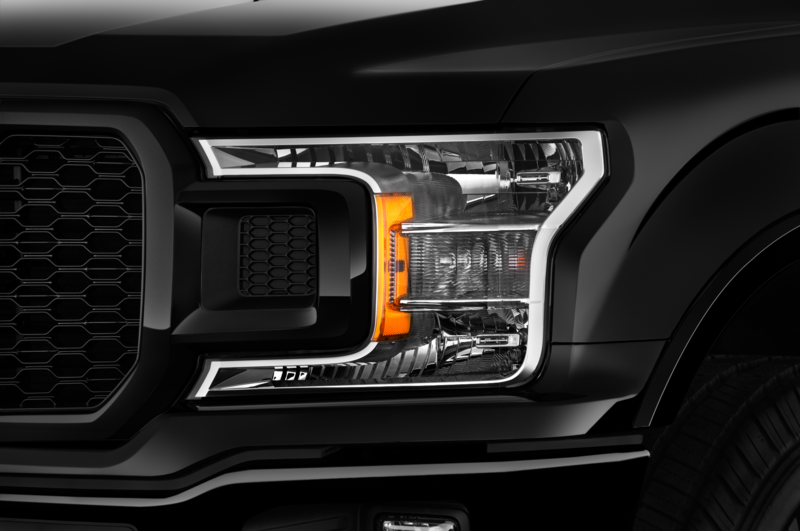 The mid-cycle refresh also gave the truck a new grille design, new headlamps, new wheels, styling tweaks, and beneath-the-metal structural improvements. 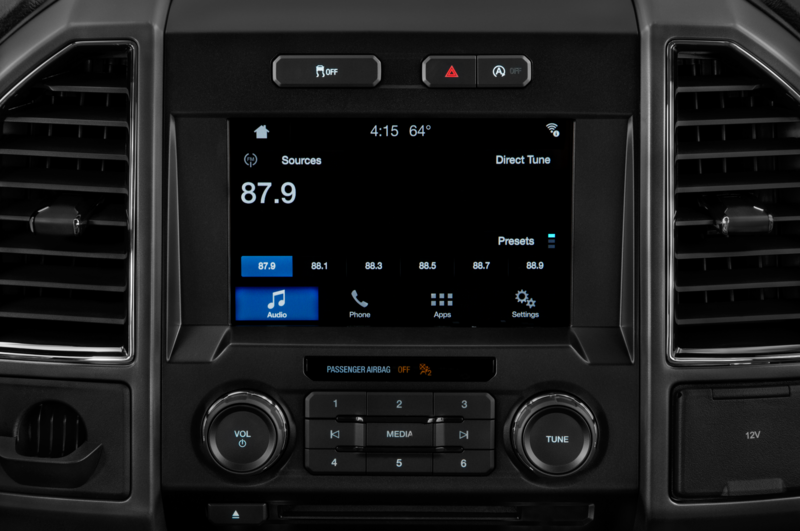 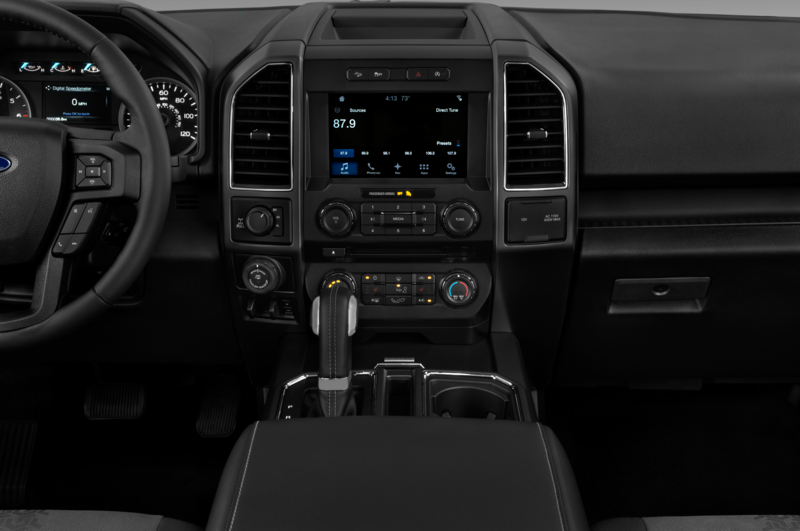 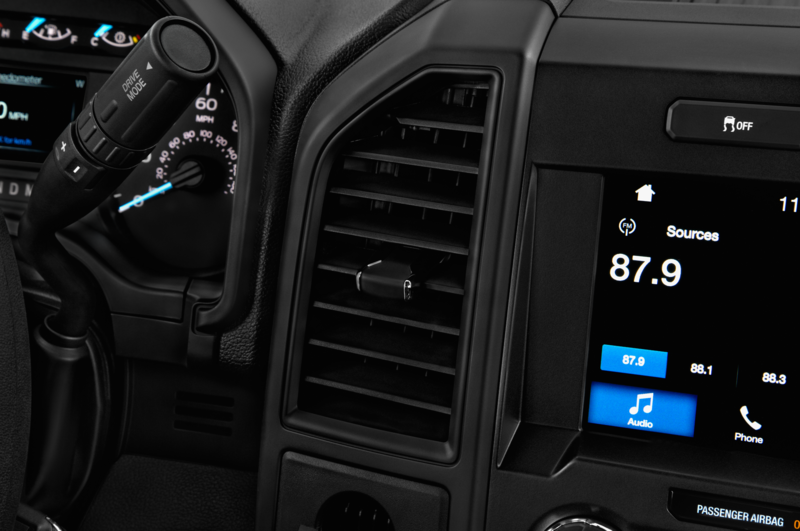 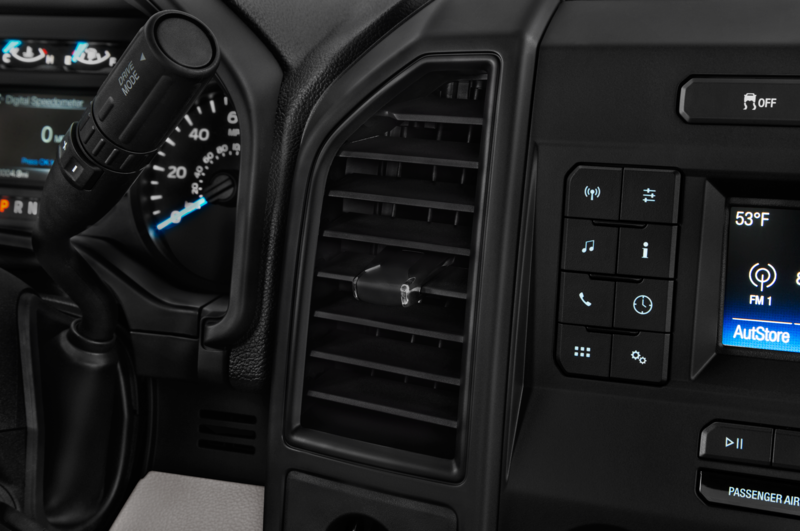 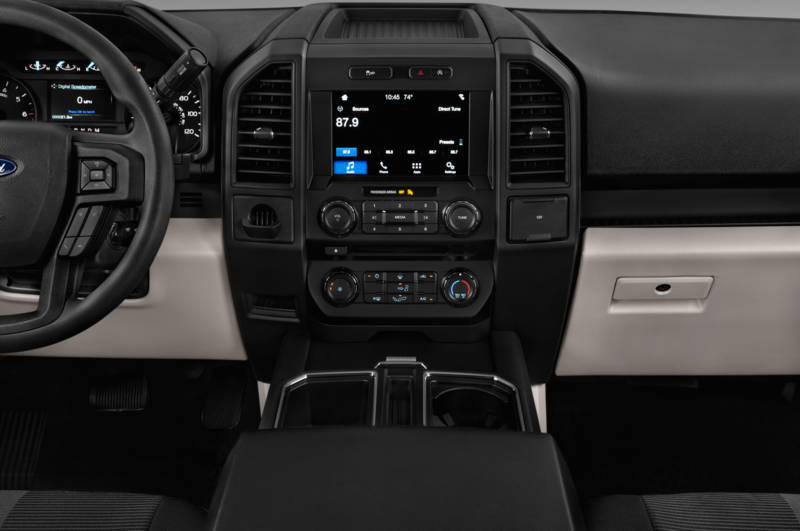 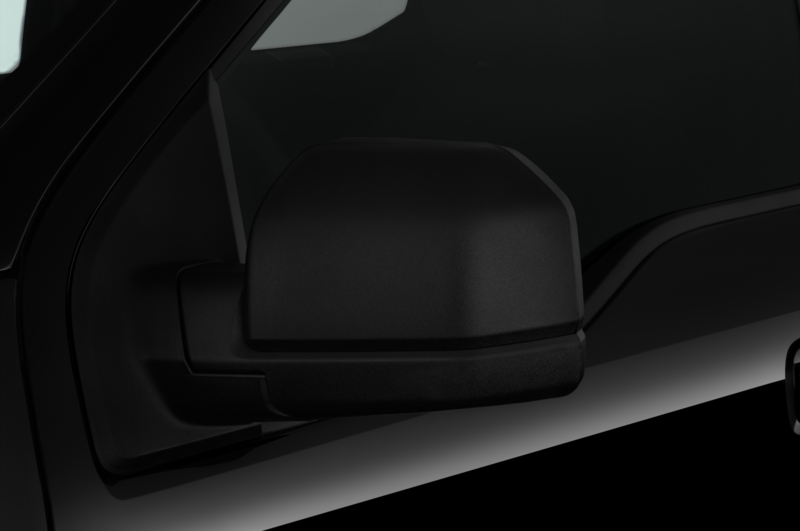 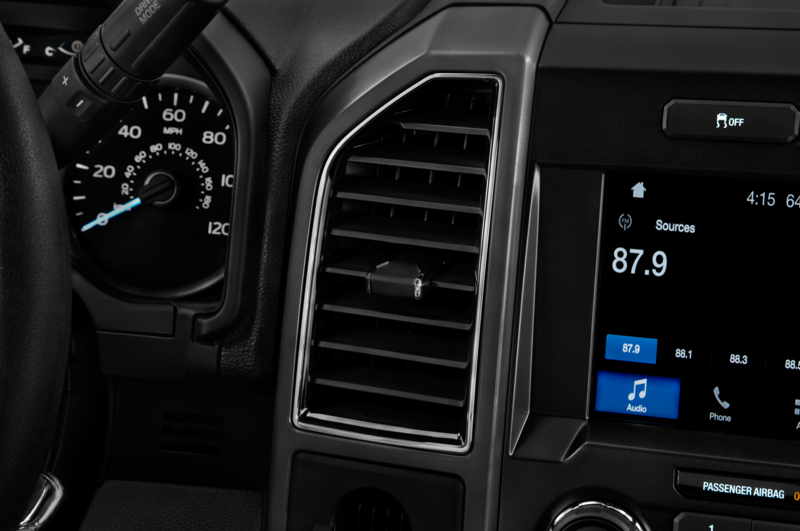 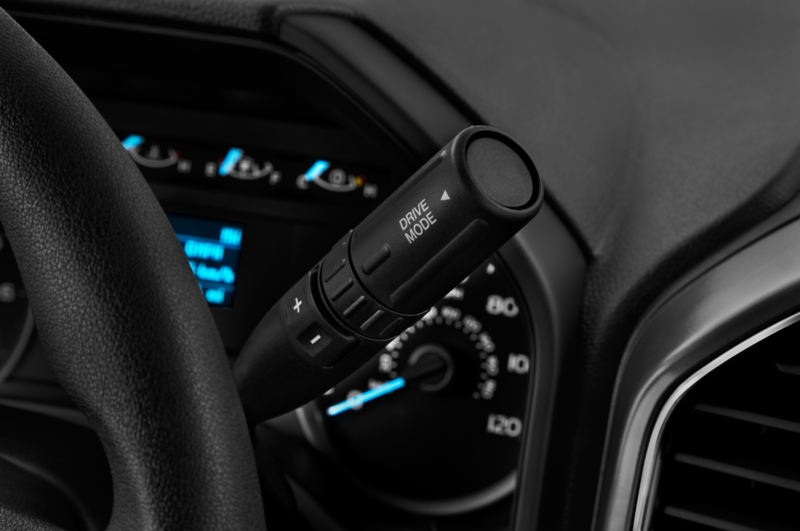 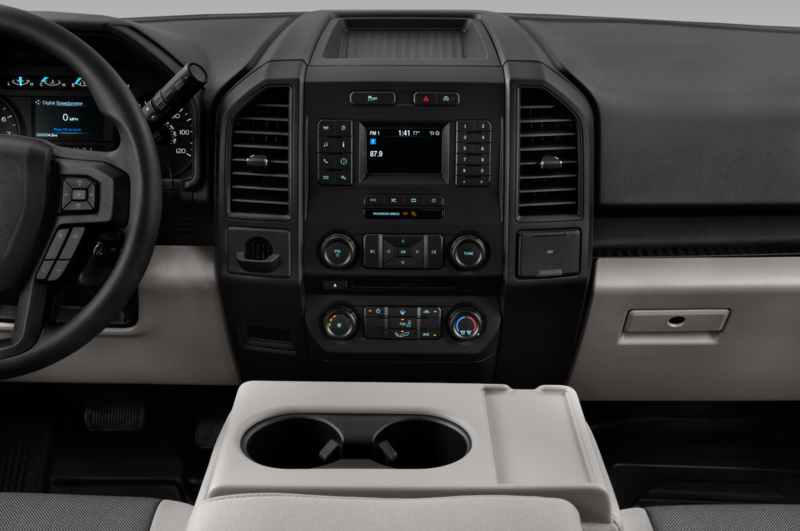 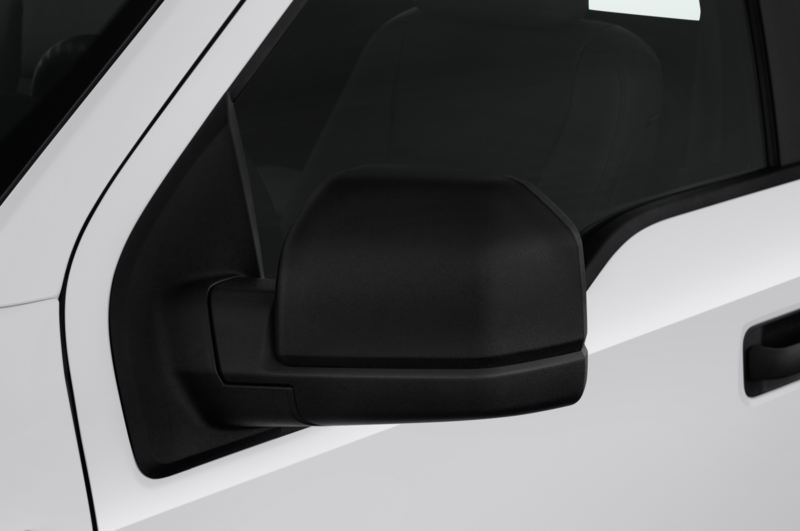 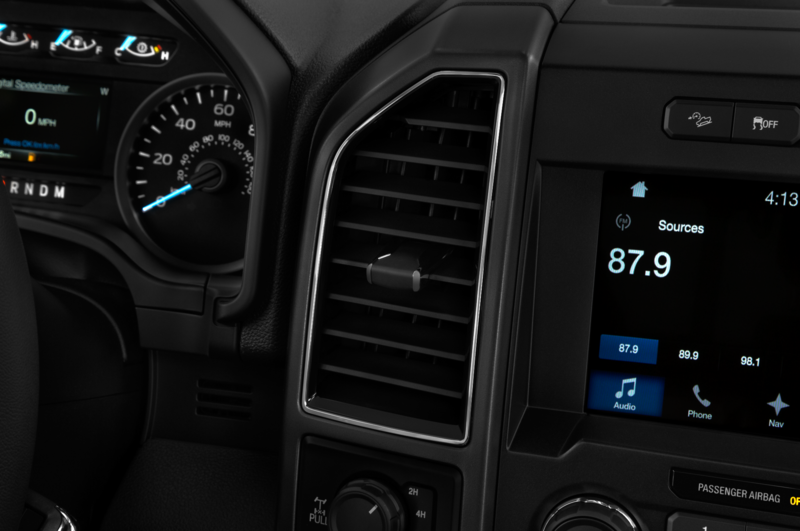 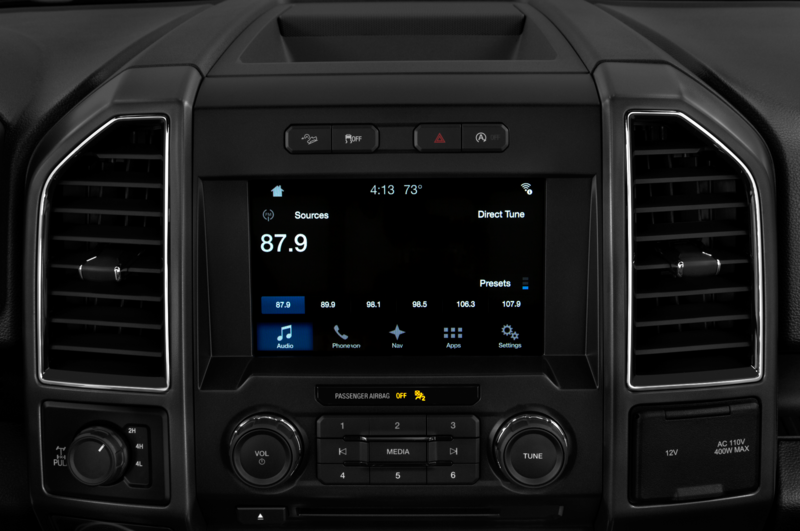 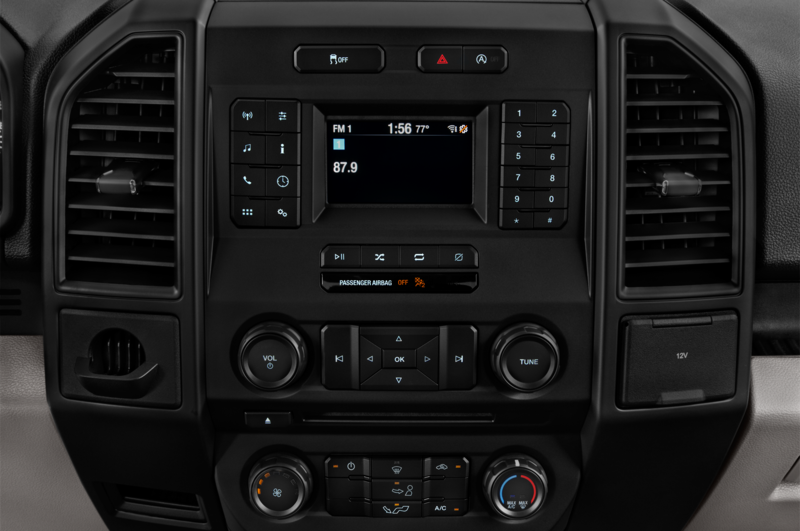 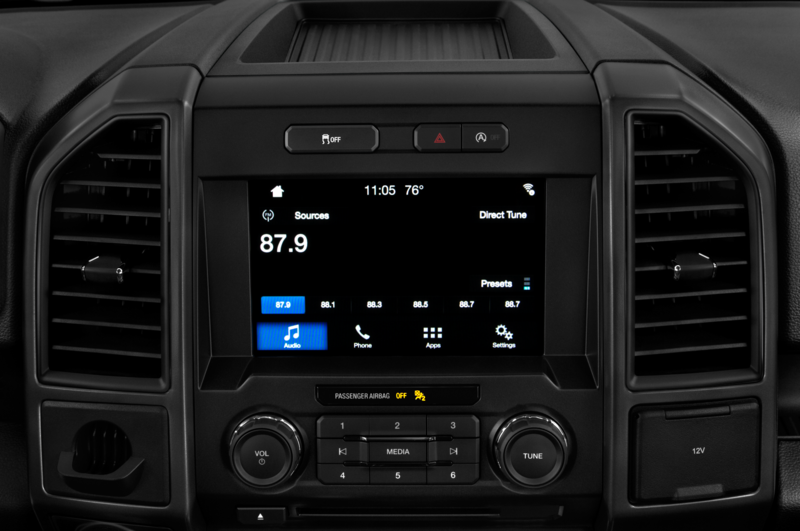 Also added for 2018 is a set of tech gear that includes Android Auto and Apple CarPlay, the presence of which makes it much easier to deal with the Sync3 system’s small touchpoints, which can be difficult to use while the truck is in motion. 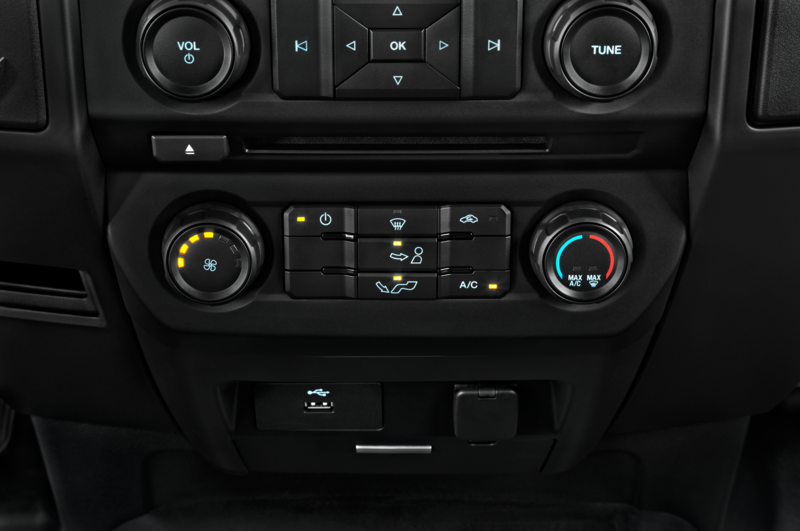 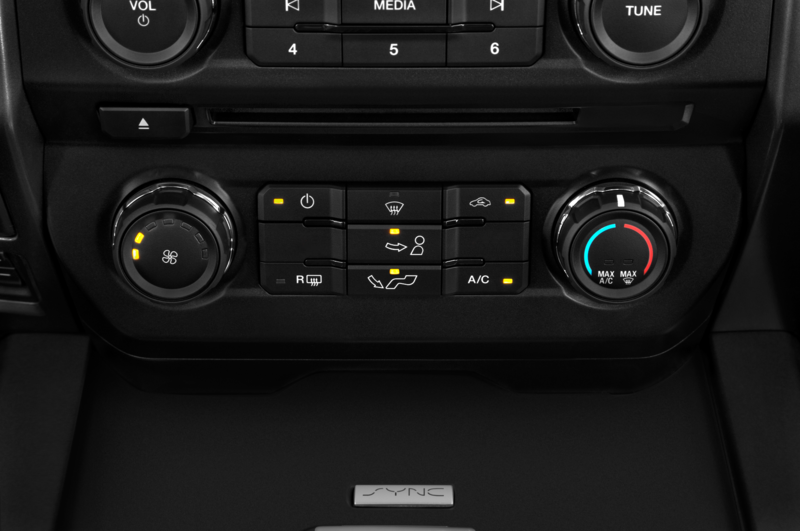 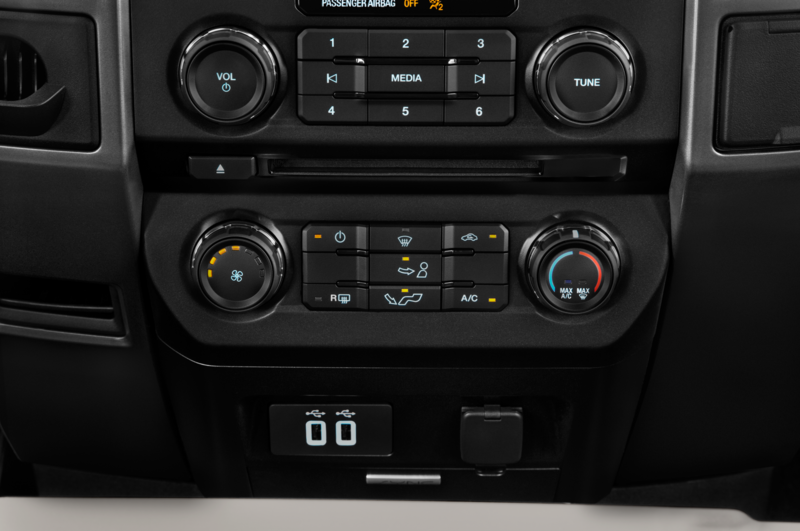 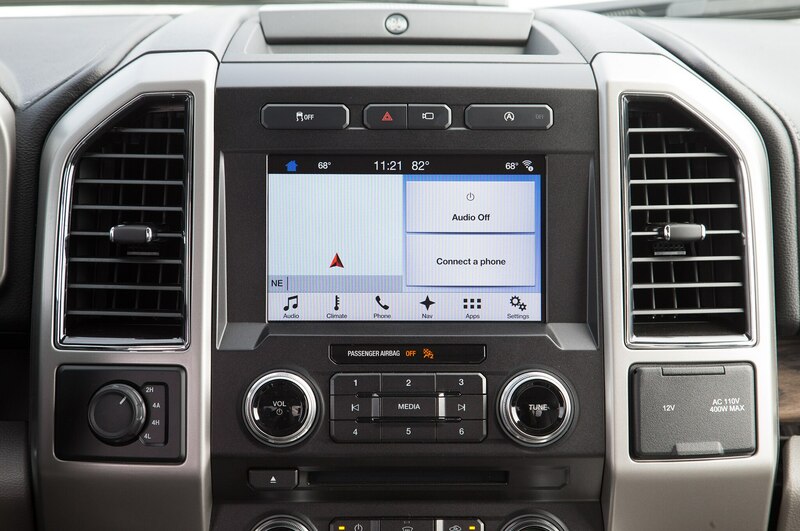 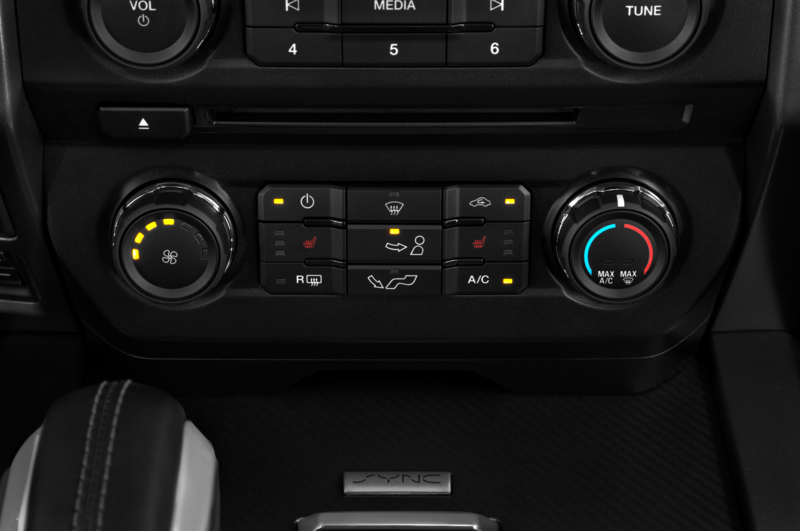 Added to the mix are B&O Play audio, a 4G LTE wi-fi hotspot, and full-stop-capable adaptive cruise control. 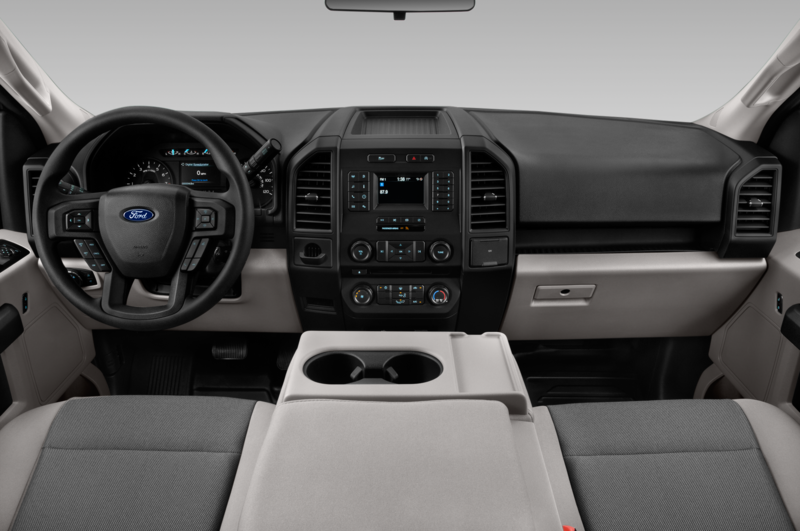 On the Lariat, the 10-speaker B&O Play Premium Audio is part of the $7,335 “Preferred Equipment Group 502A” (German car equipment levels apparently also mean German car package costs) that also adds remote start, blind spot monitoring with cross-traffic alert, a 110-volt outlet, heated and cooled leather bucket front seats, heated rear seats in SuperCrew models like this one, heated power tilt and telescoping steering wheel, navigation, LED headlpamps, and a heaping helping of chrome. 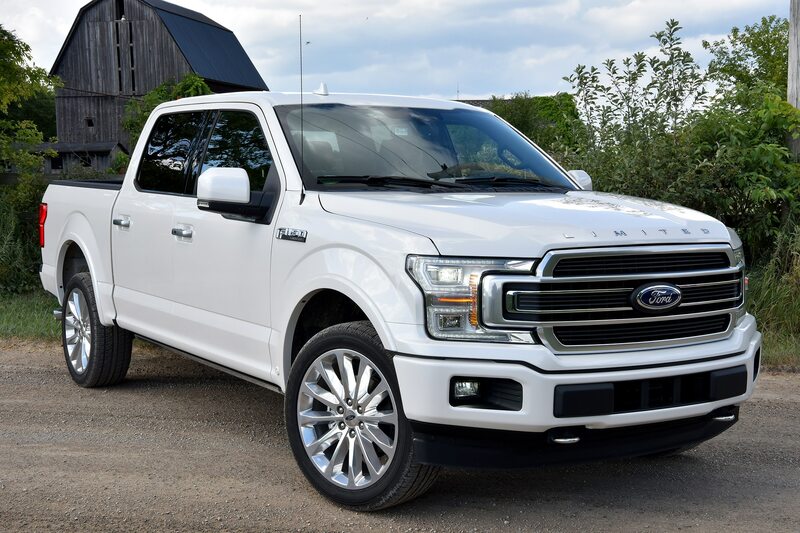 Our tester’s White Platinum Metallic paint added $595 to the sticker, the spray-in bedliner $495, the twin-panel moonroof another $1,295, and the 20-inch chrome wheels tacked on $1,095. 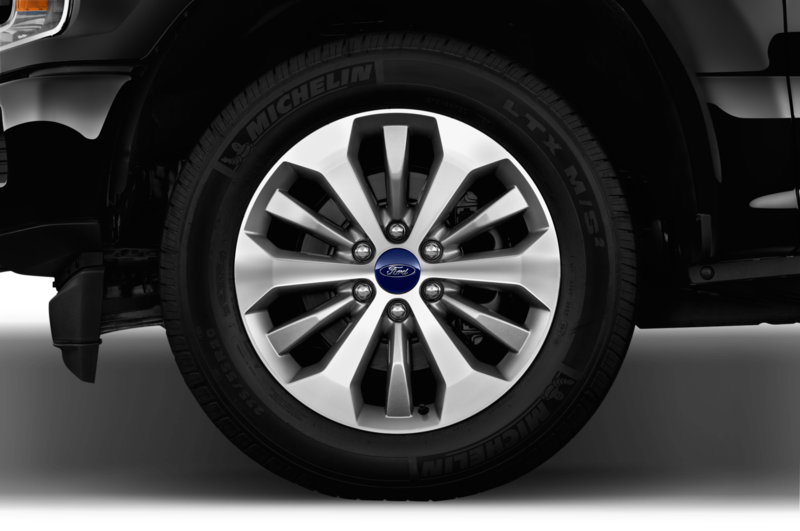 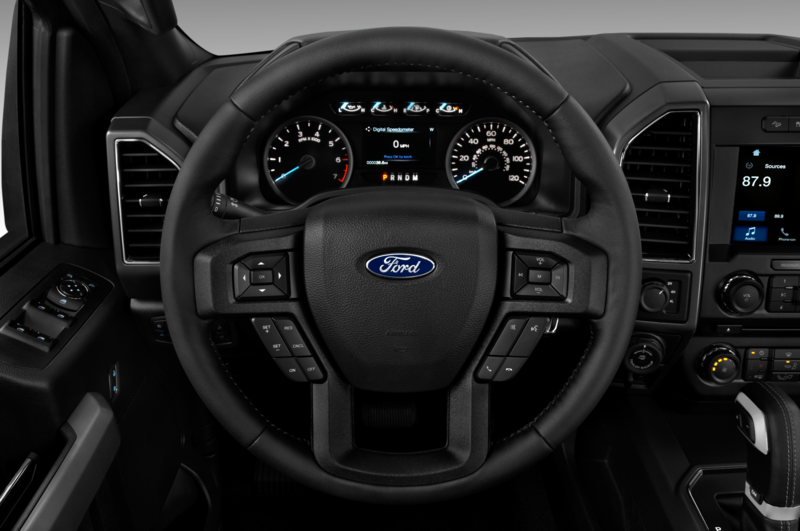 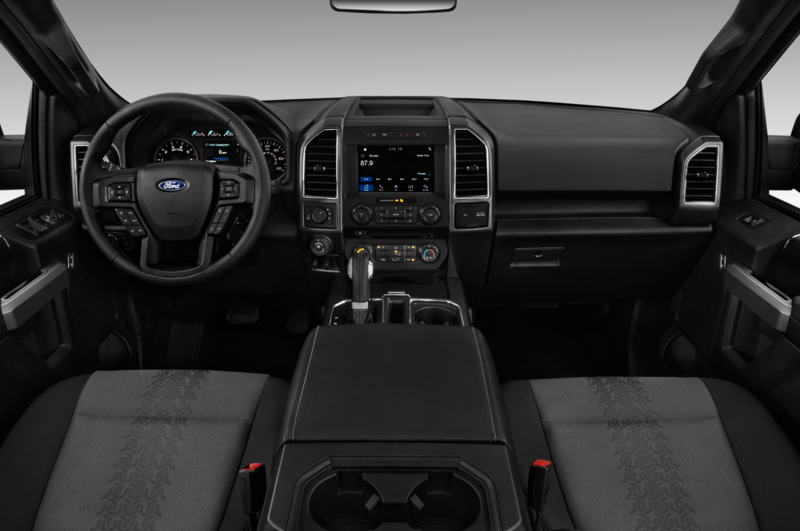 Oh, and we can’t forget the $1,395 Technology Package, which adds a 360-degree camera and Ford’s Active Park Assist system. 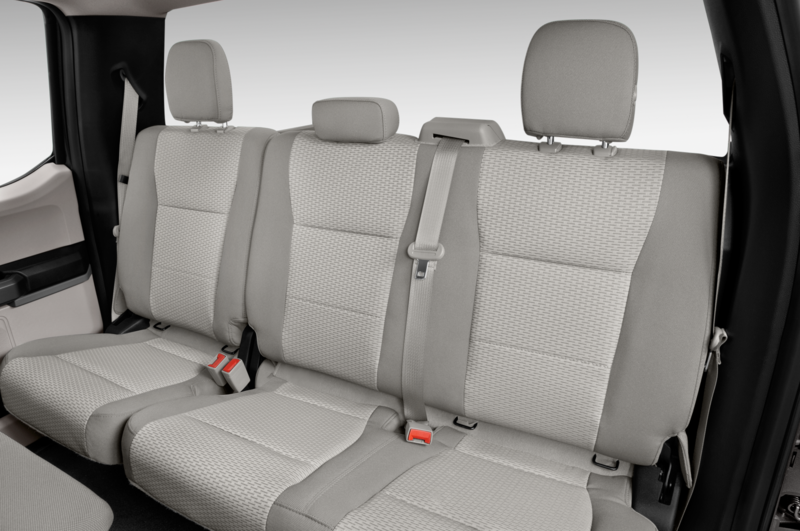 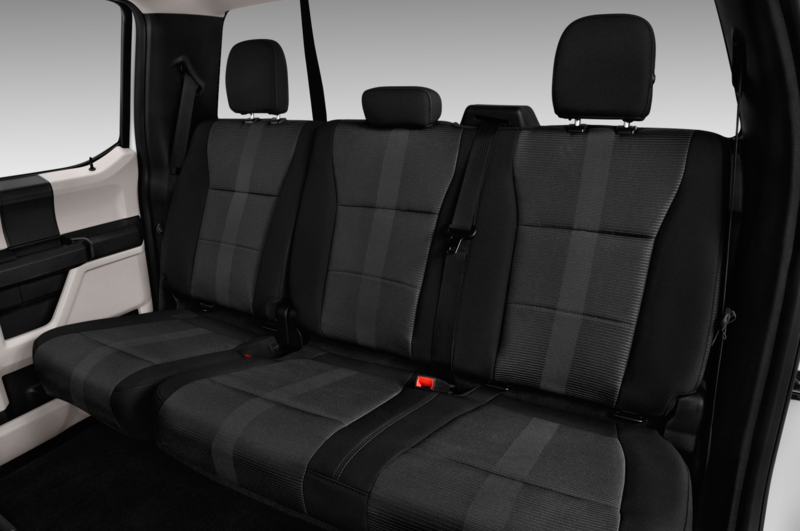 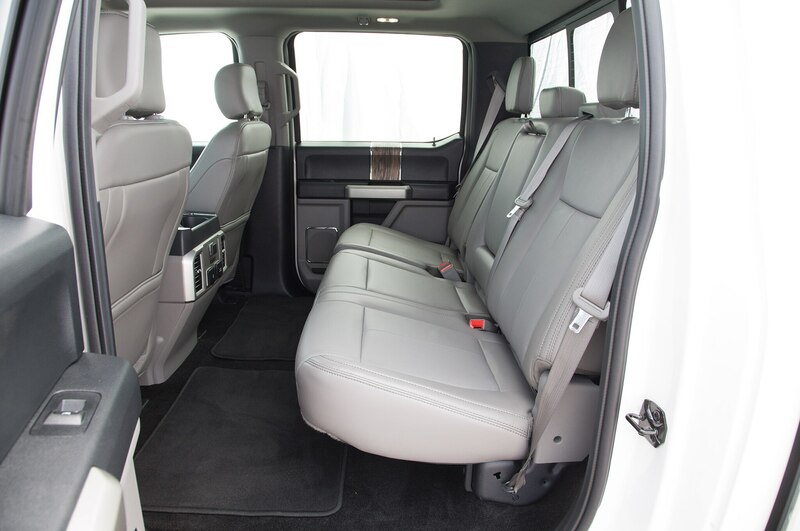 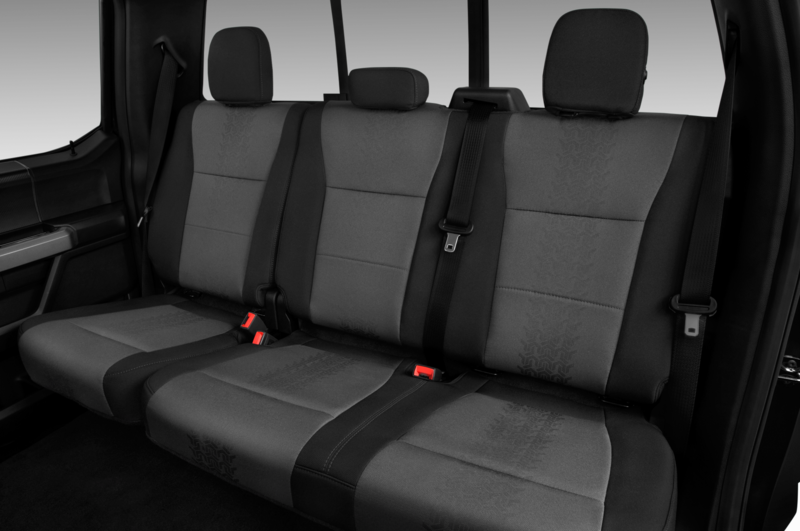 Opting for the SuperCrew cab makes for a rear seat that offers luxury car levels of space, including a whopping 43.6 inches of leg room. 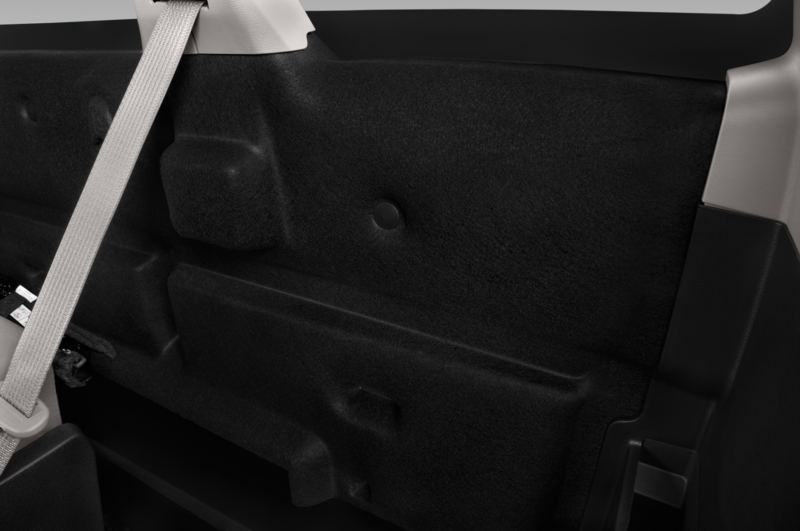 Fitting five full-grown adults inside won’t be a problem unless all five are about the same size as Dwayne “The Rock” Johnson. 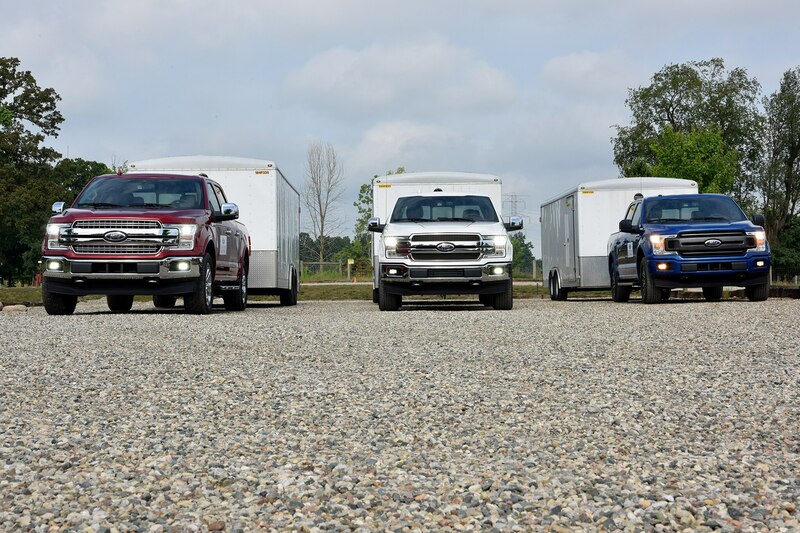 The downside of the SuperCrew, however, is that you have to choose between short or extra-long sizes. 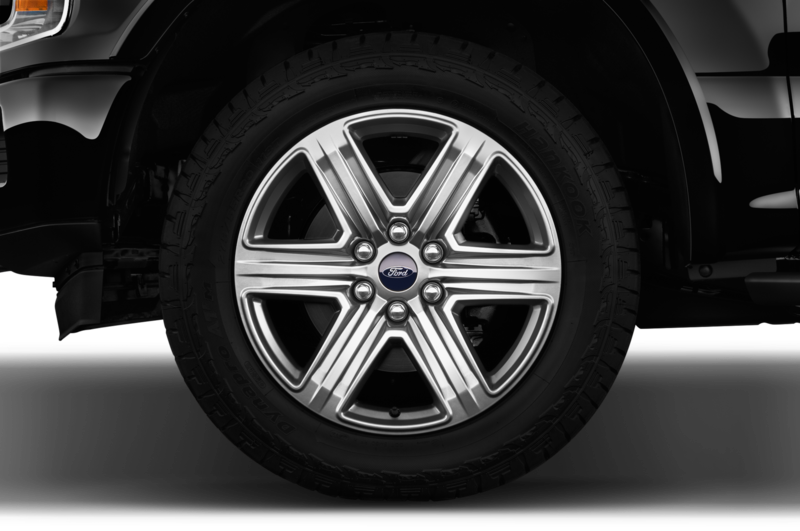 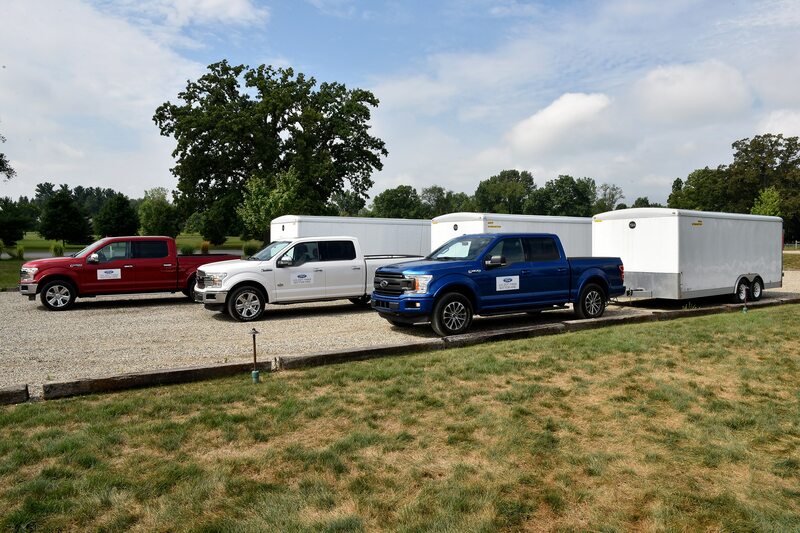 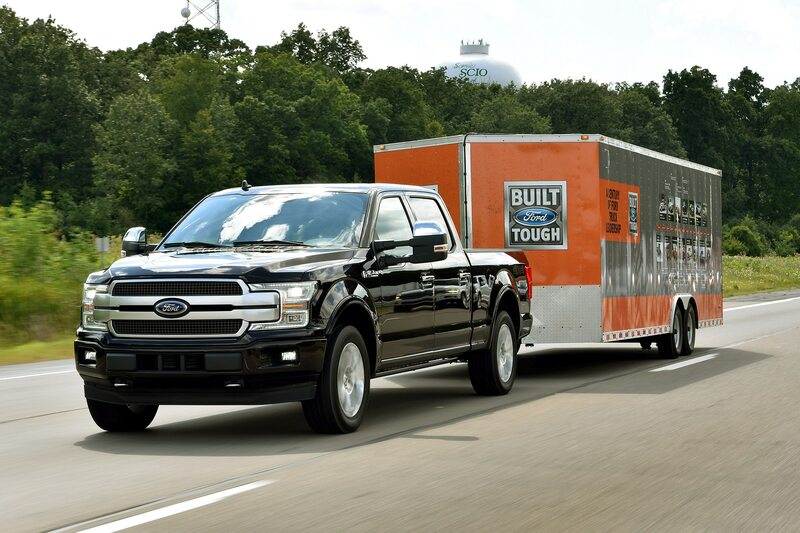 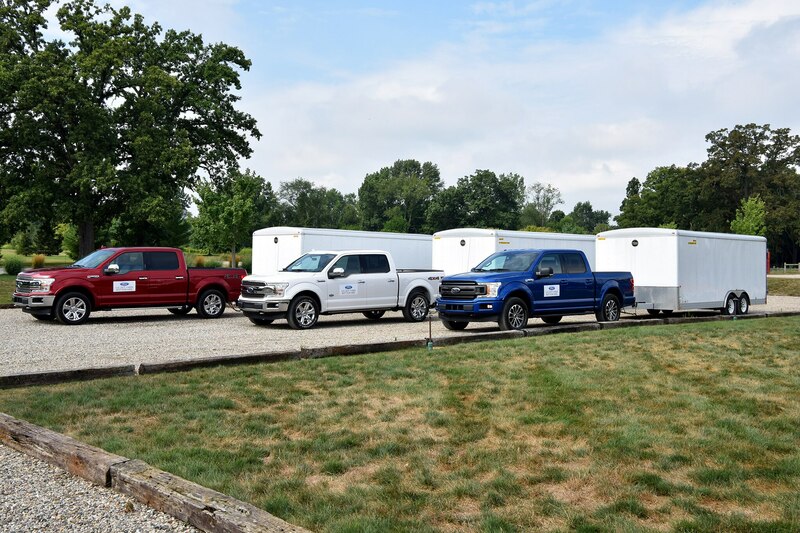 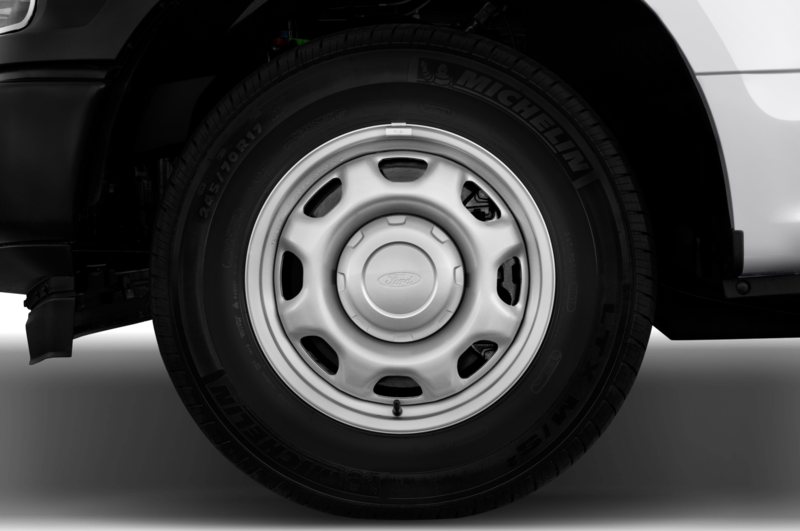 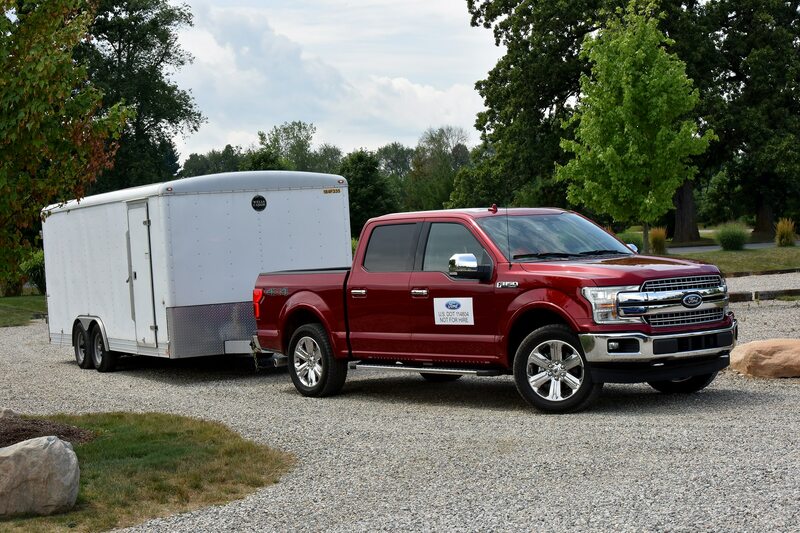 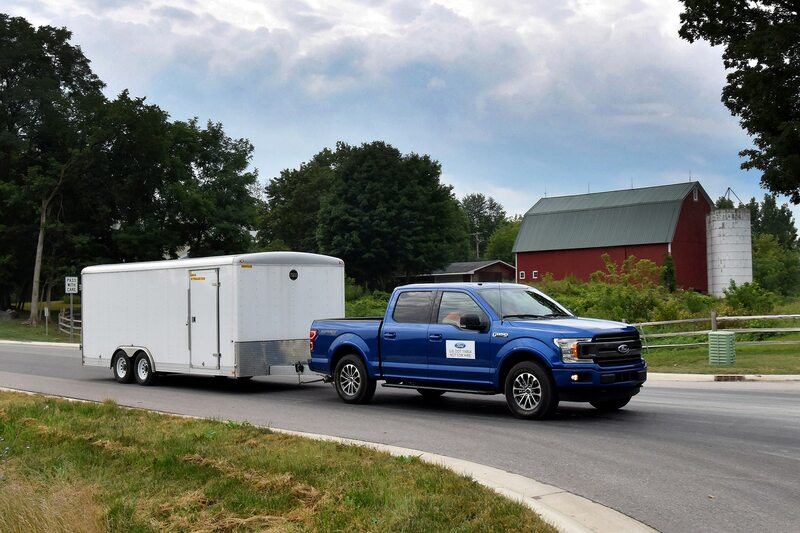 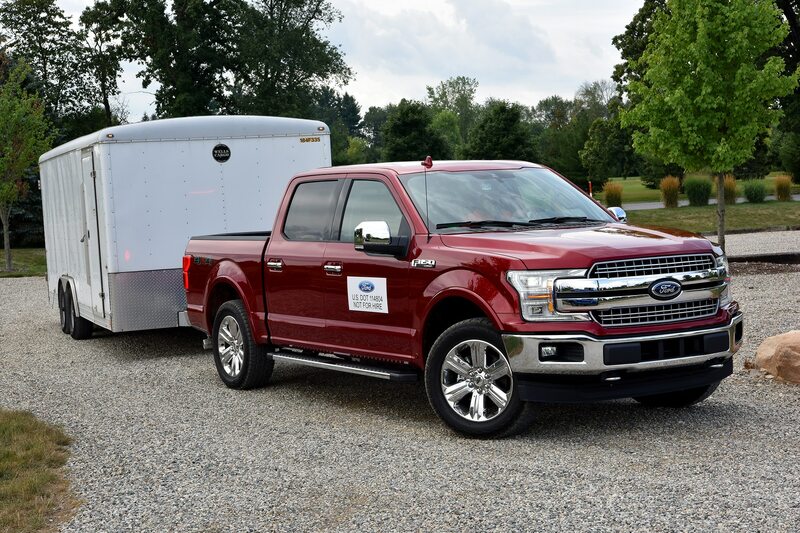 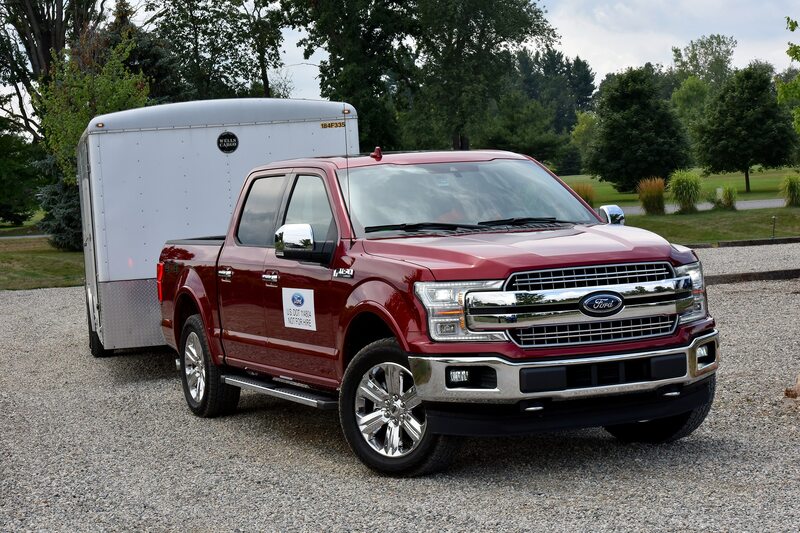 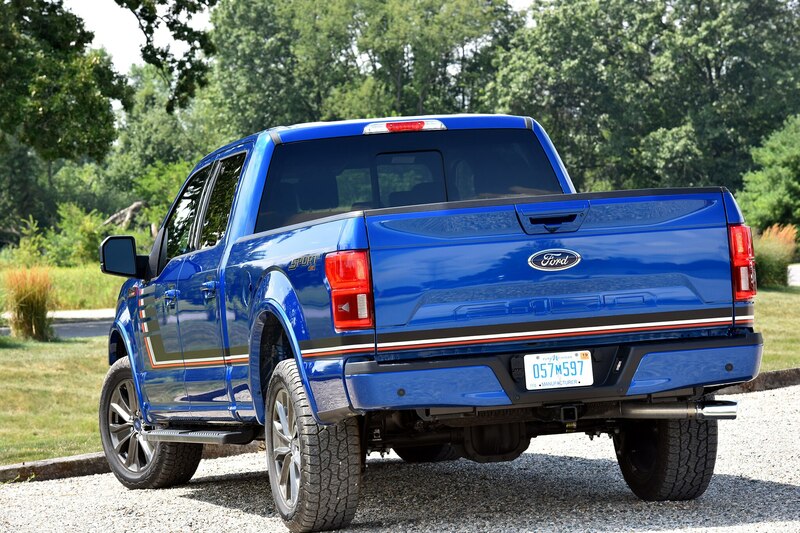 As most customers likely do, Ford opted to go with the former when building this tester, outfitting it with a stubby 5.5-foot bed on a 145.0-inch wheelbase for an overall length of 231.9 inches. 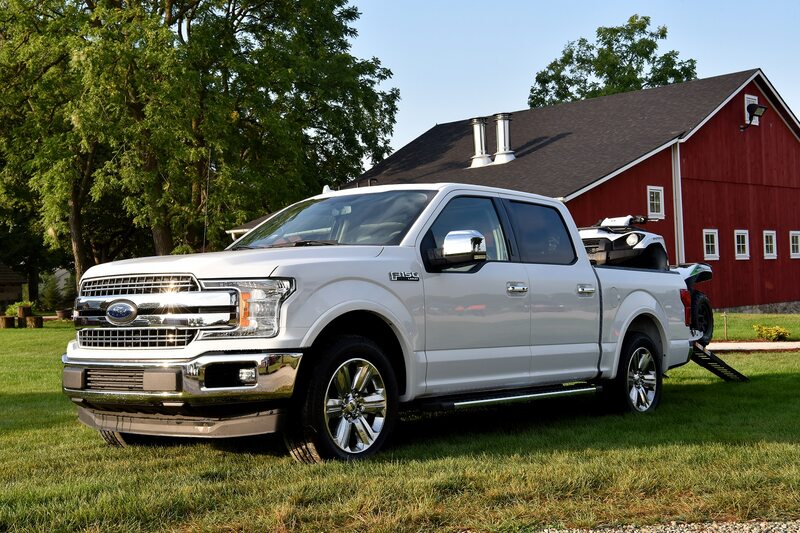 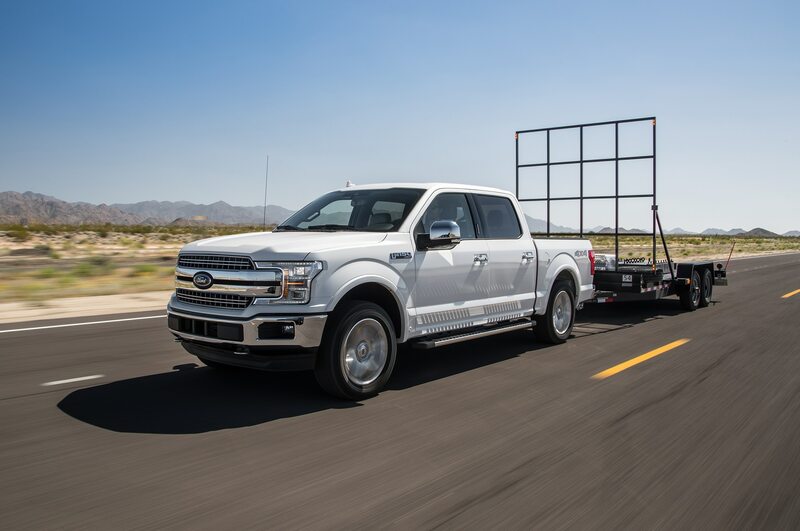 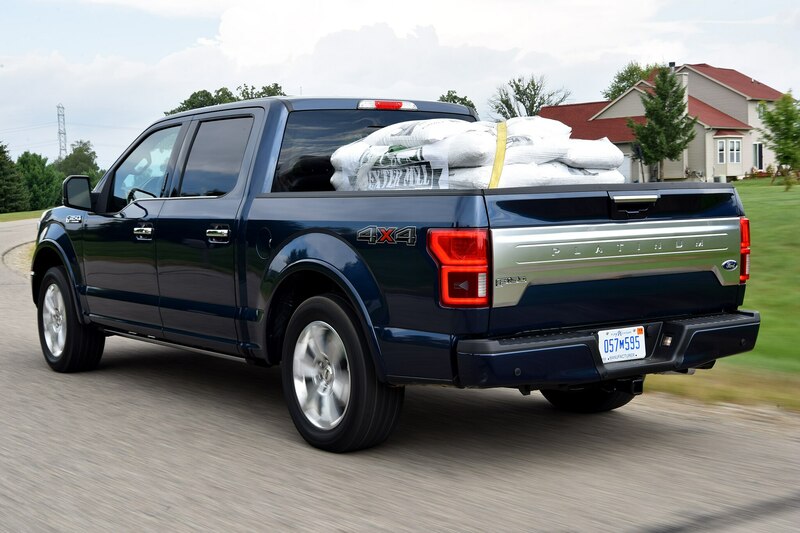 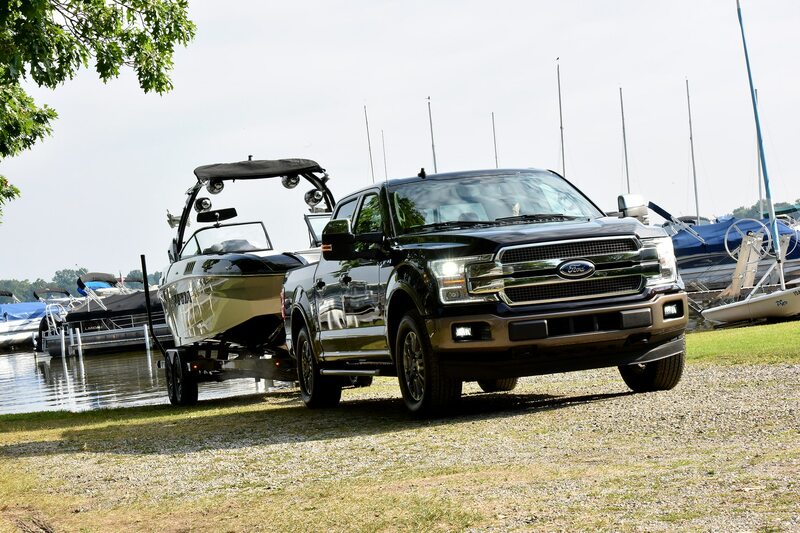 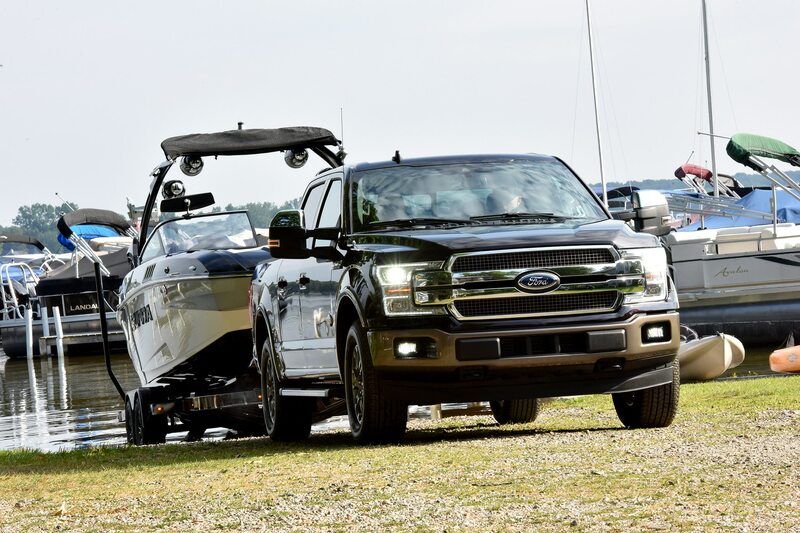 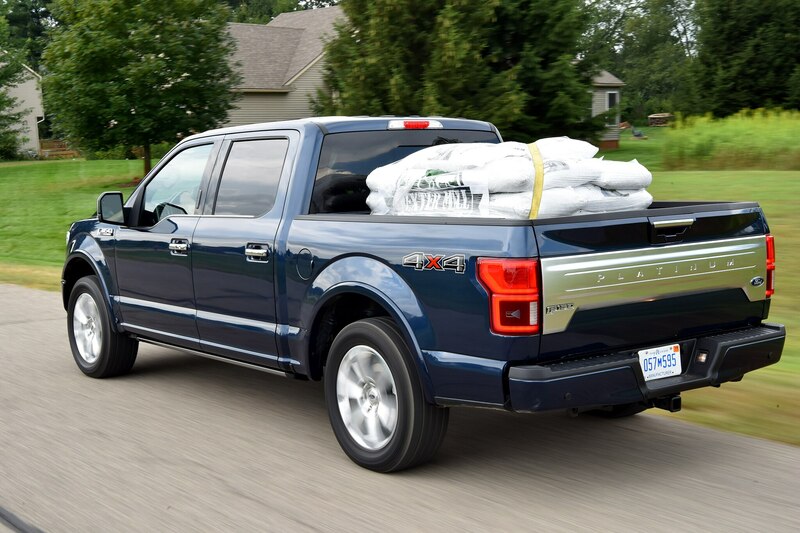 Opt for the 6.5-foot bed and you get an extra foot worth of F-150—wheelbase stretches to 156.8 inches, while overall length hits 243.7 inches. 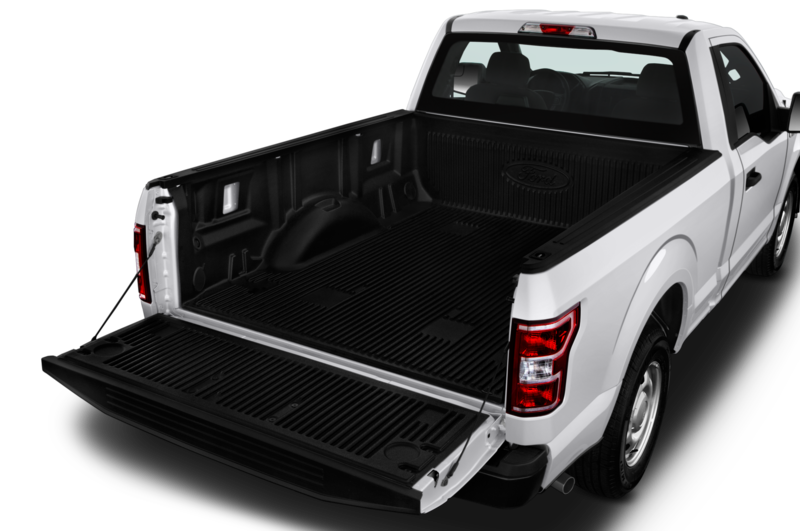 The short bed decidedly limits usefulness if you have oversize objects to carry (e.g. 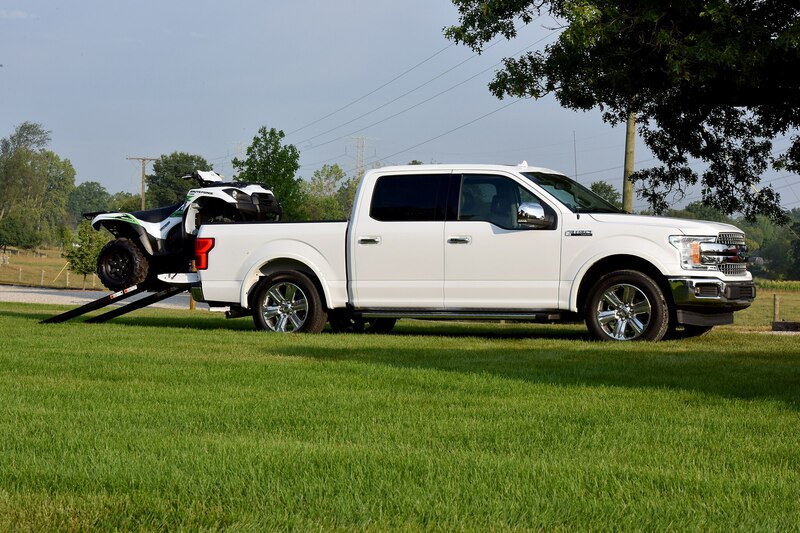 motorcycles or surfboards), but it’s still plenty big for a family weekend at the lake or a day trip to the beach. 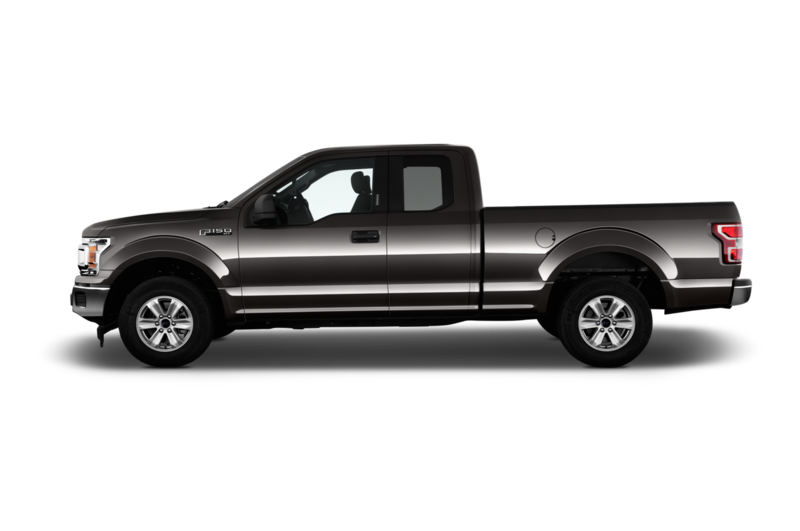 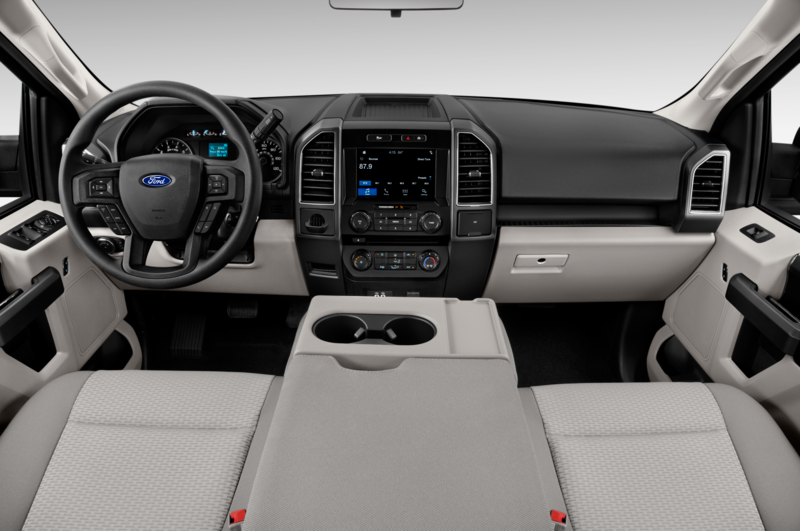 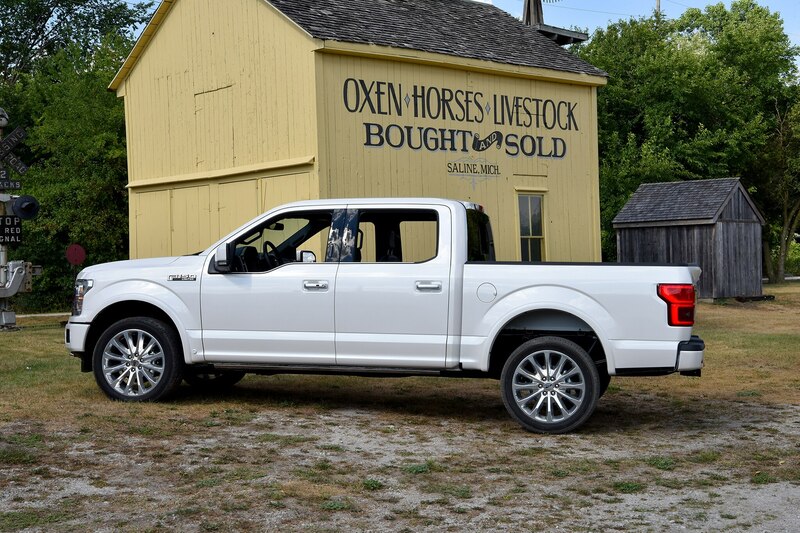 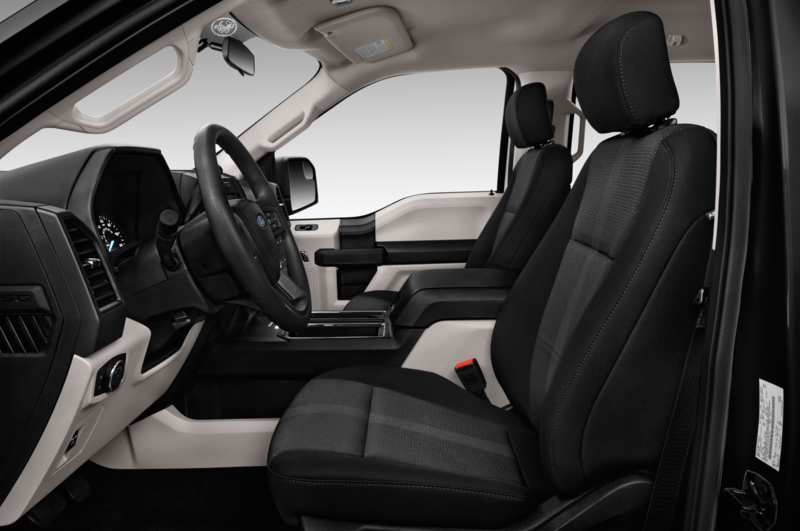 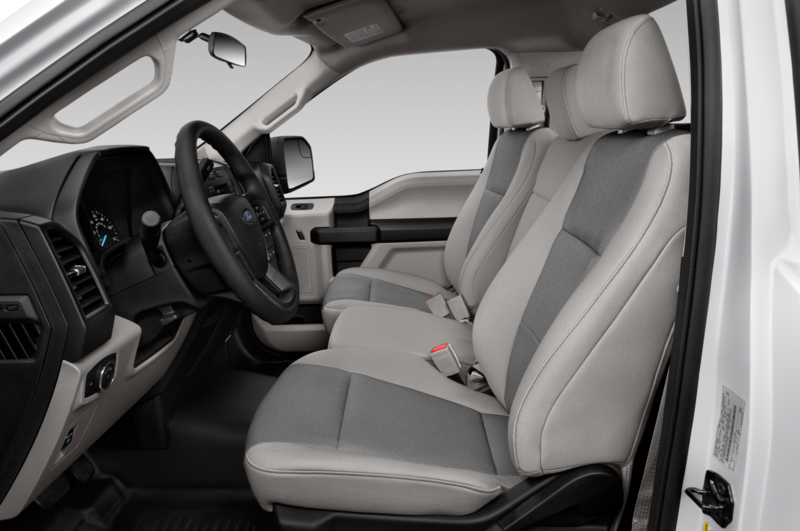 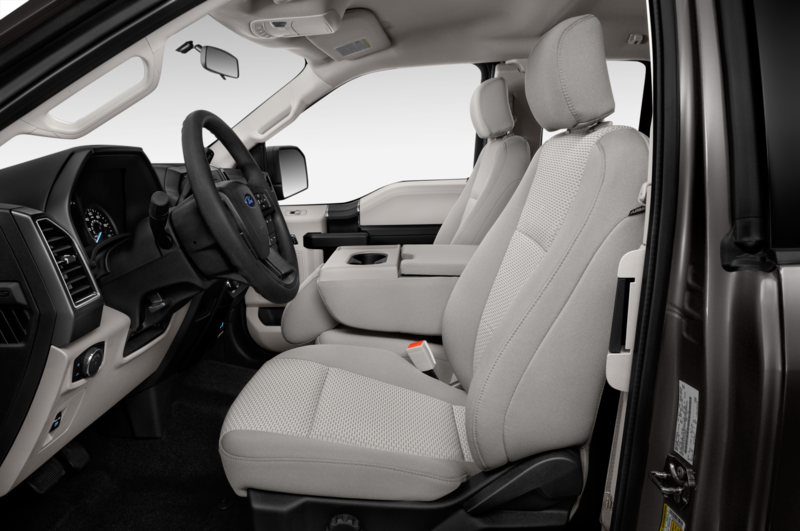 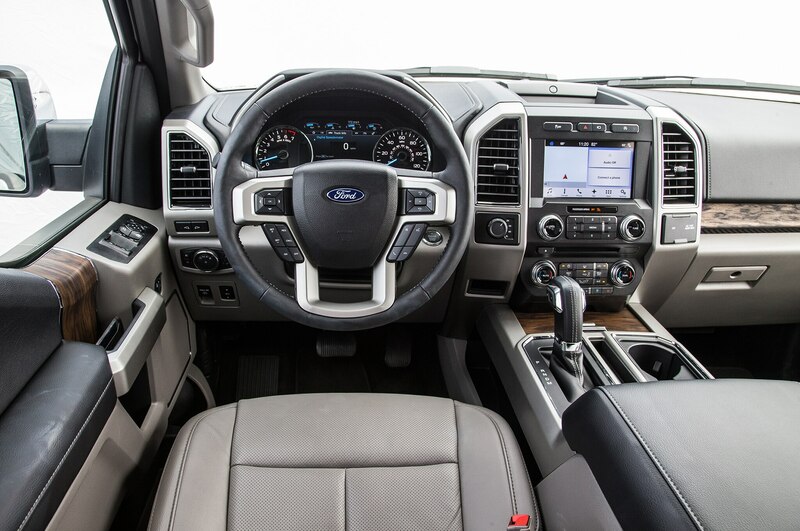 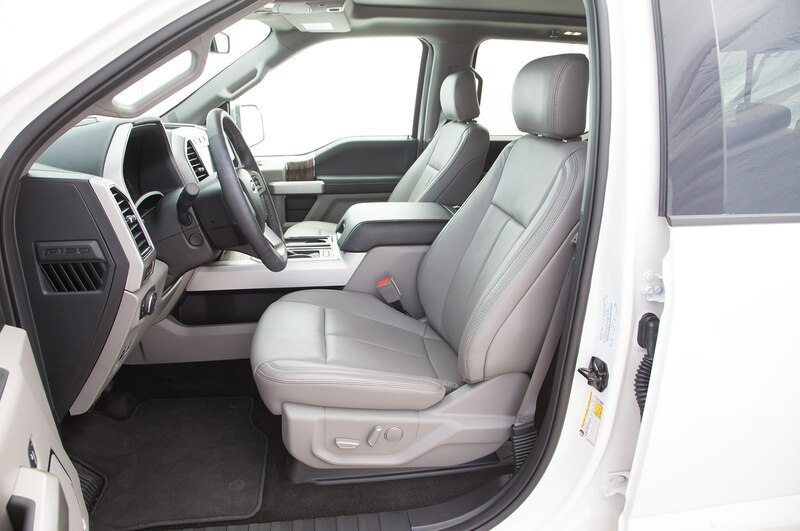 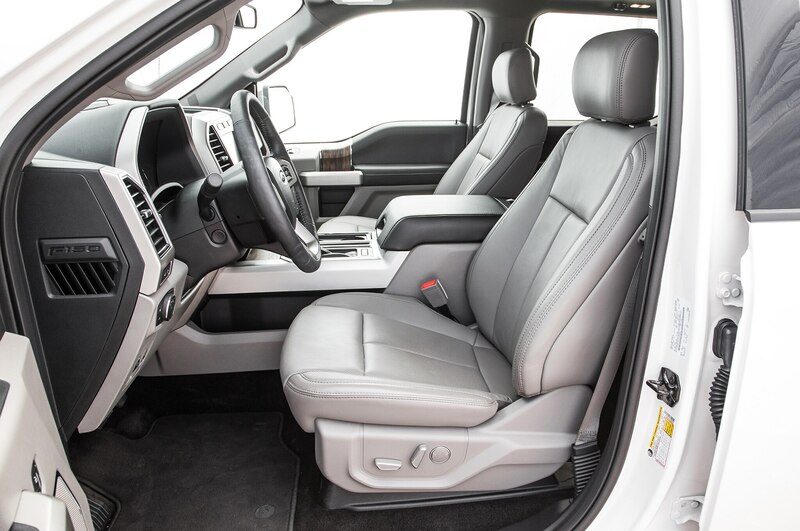 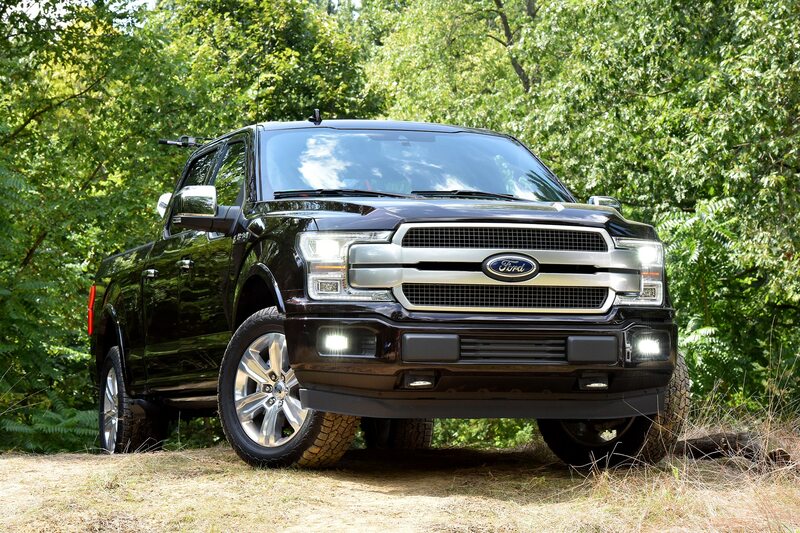 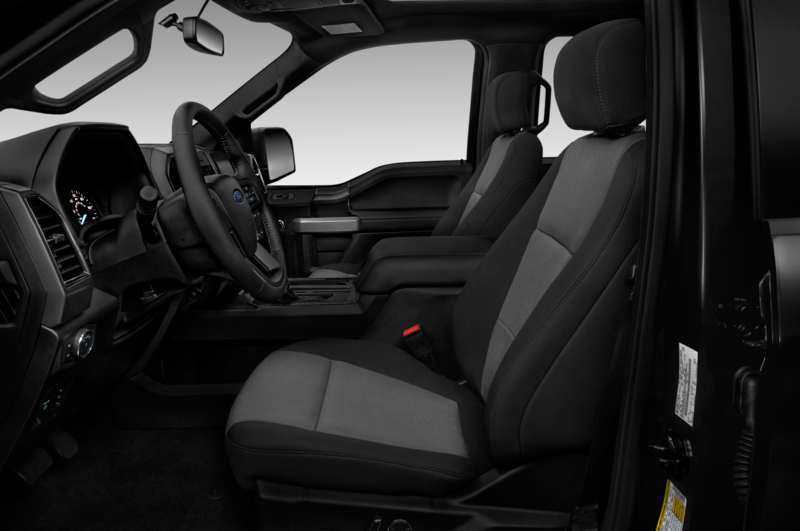 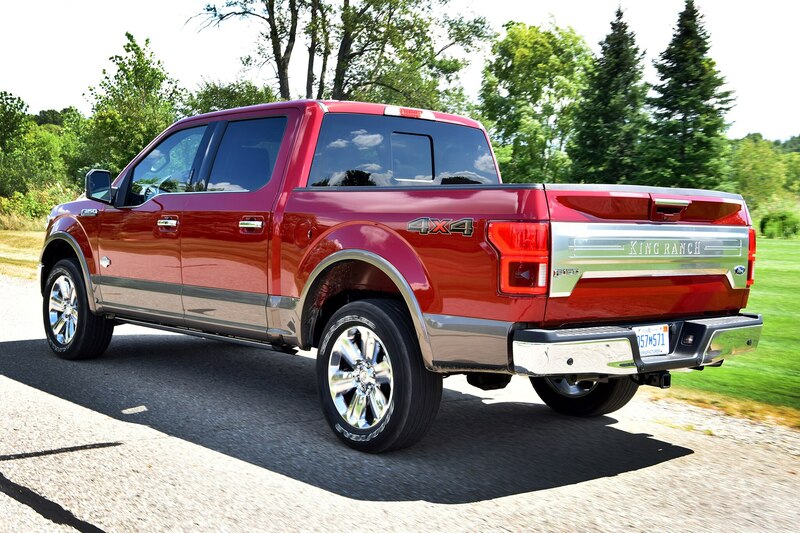 Despite the spacious accommodations, nobody will mistake the F-150’s ride for that of a luxury car. 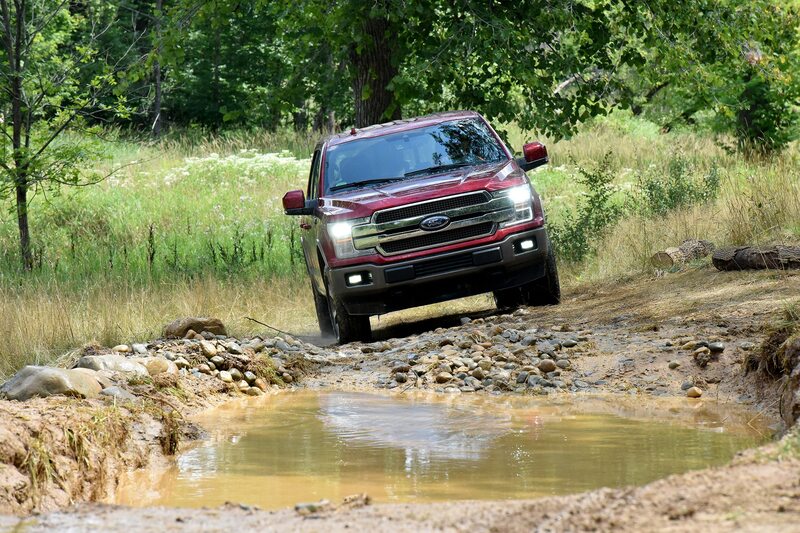 Though the suspension is set up well enough to mitigate all but the most severe freeway hop and doesn’t get unsettled under normal operation, you’ll feel every last bump, irregularity, and pothole in that “4,900-pound truck that knows it’s there but doesn’t care” way that’s characteristic of modern full-size behemoths. 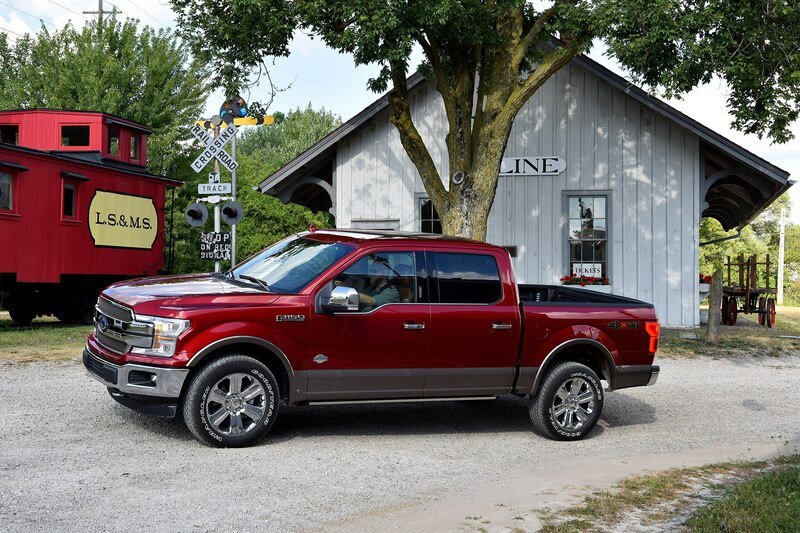 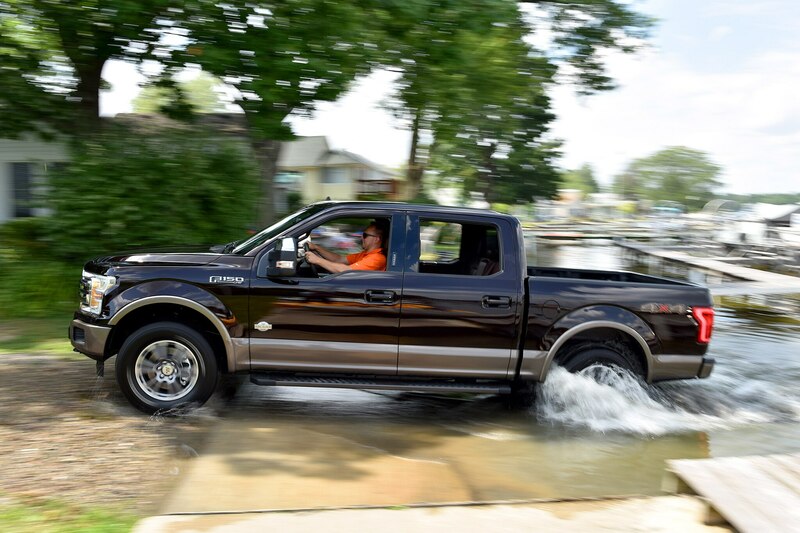 The new 2019 Ram 1500 that I sampled shortly after this Ford offered a decidedly smoother unladen ride, but this isn’t the place to go any deeper into the never-ending full-size truck battle for supremacy. 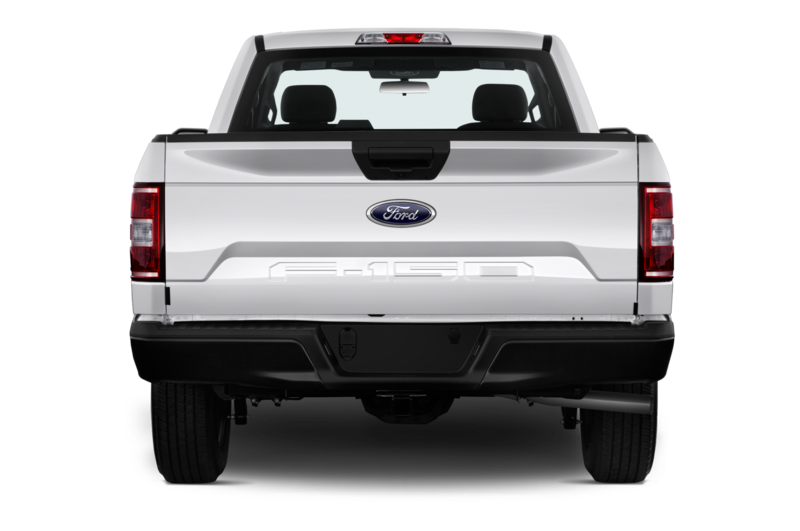 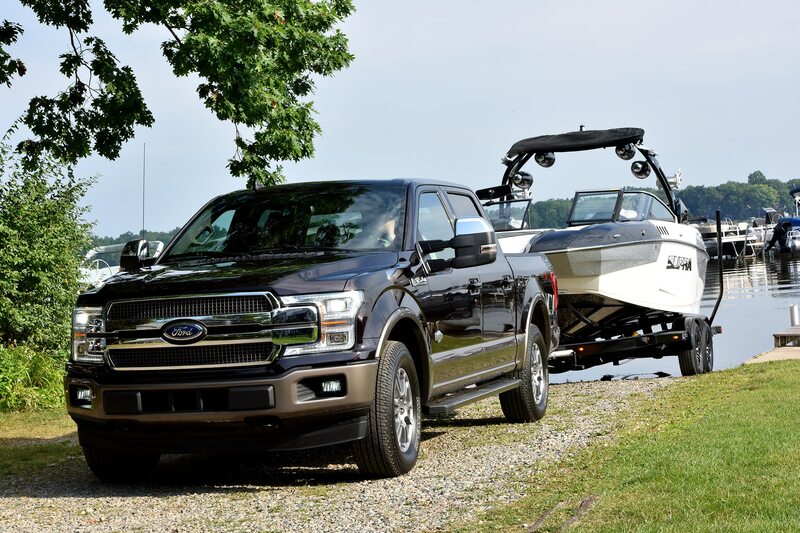 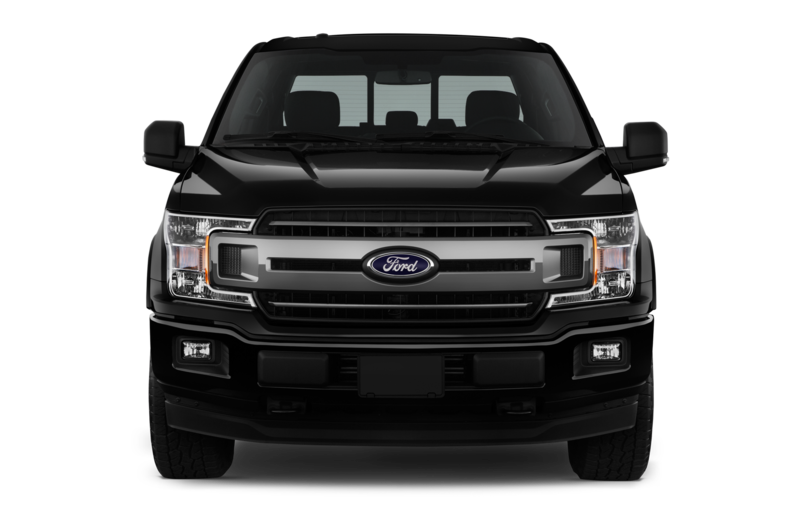 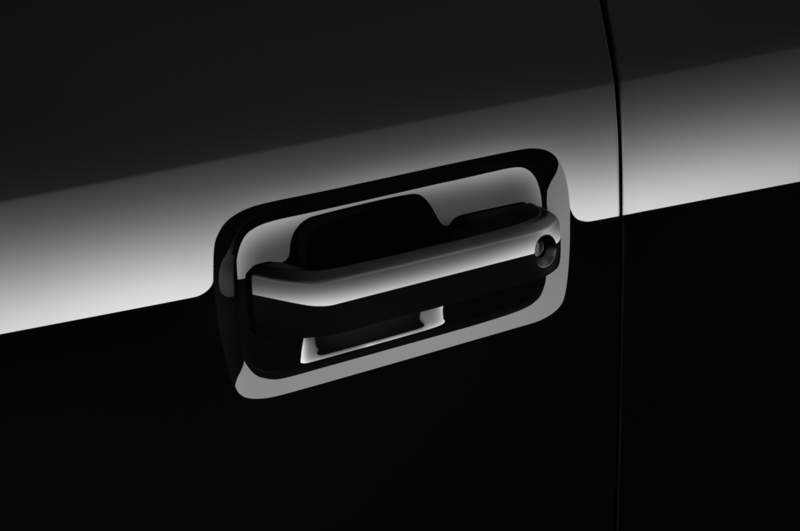 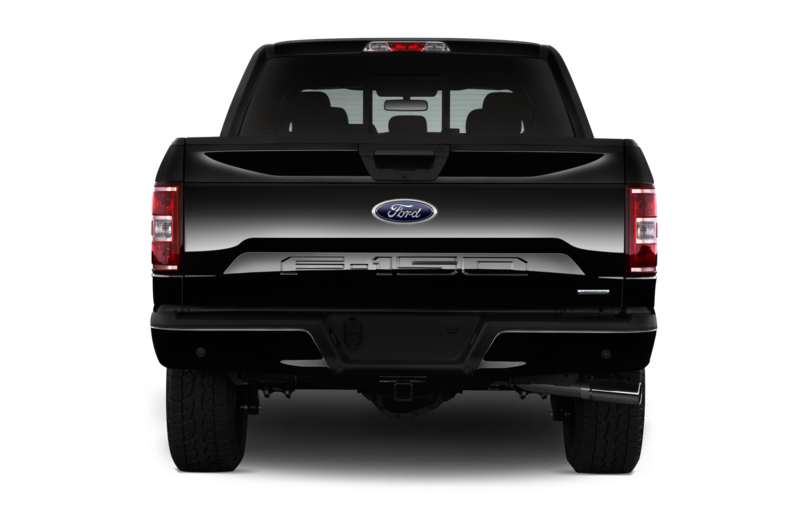 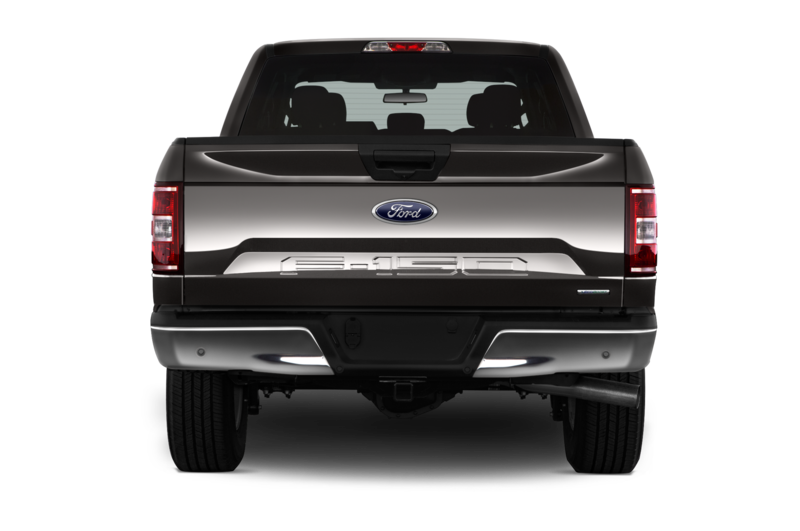 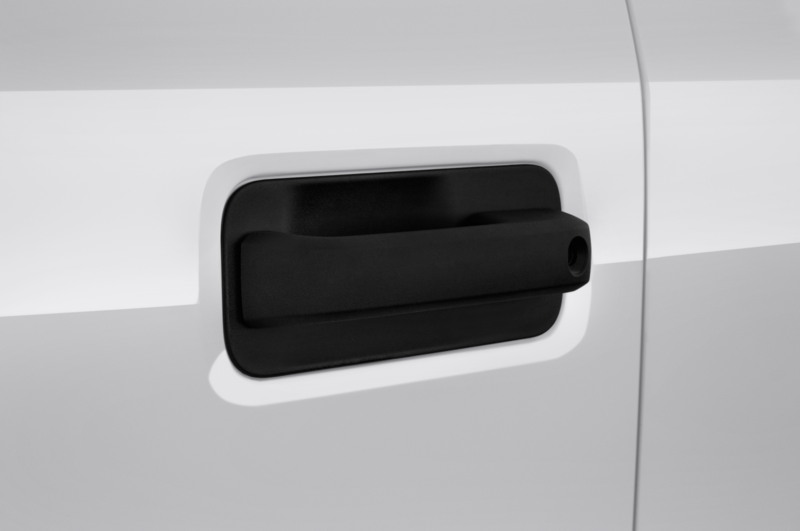 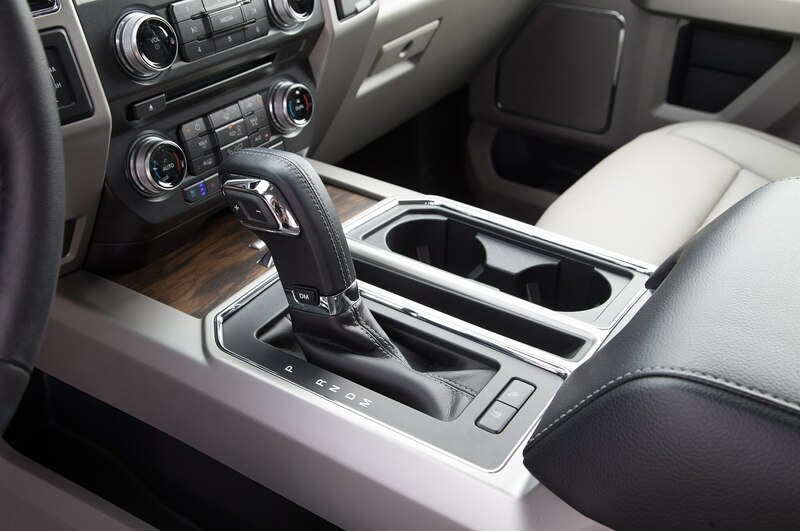 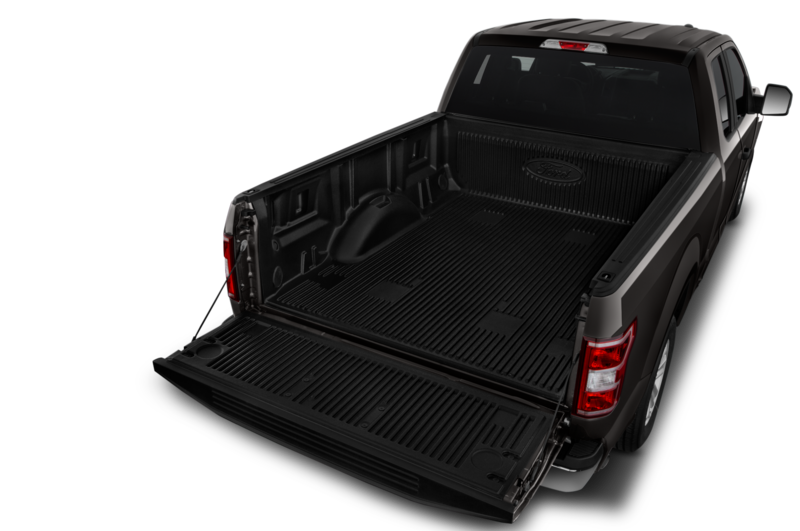 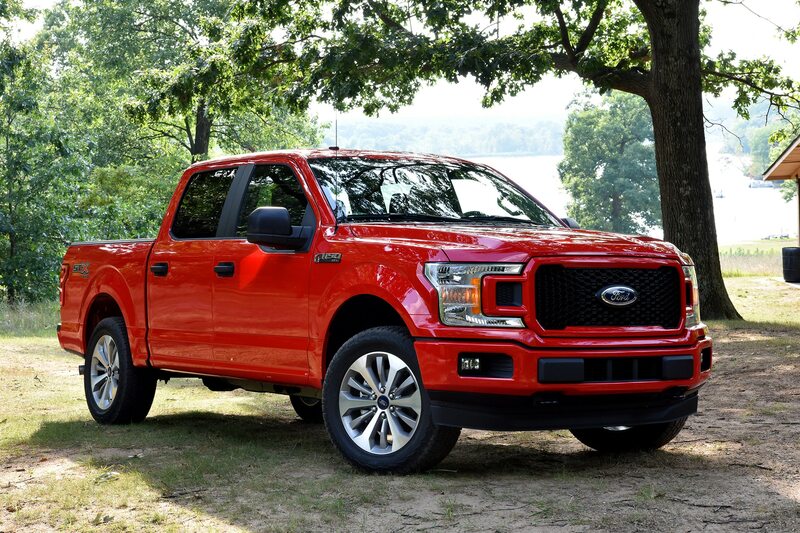 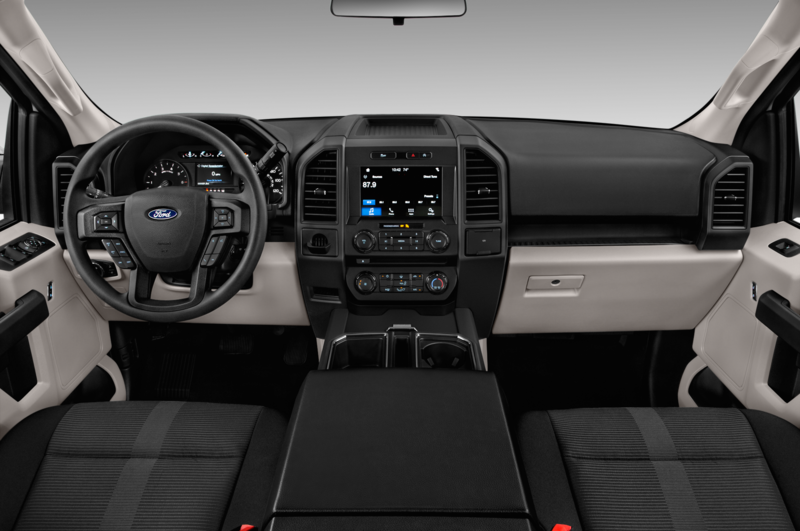 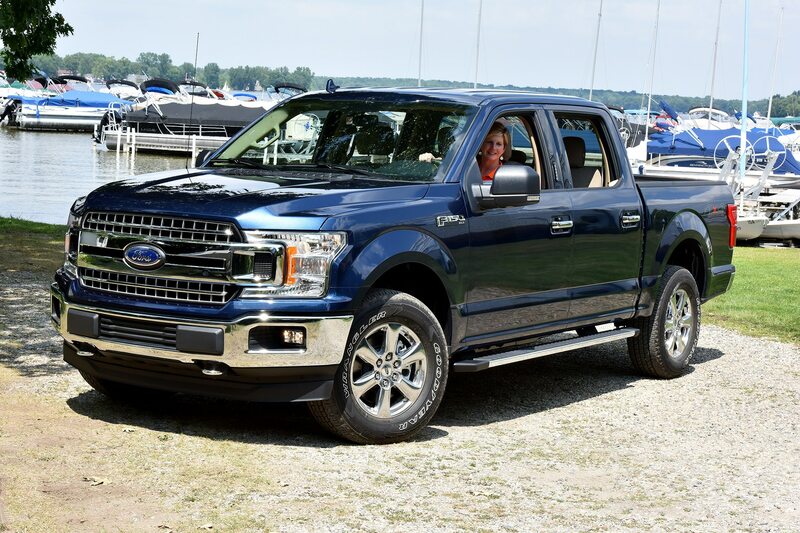 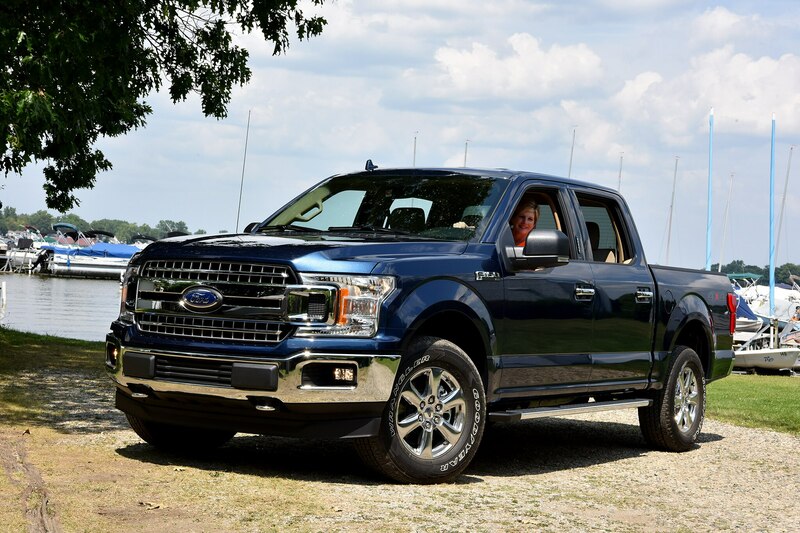 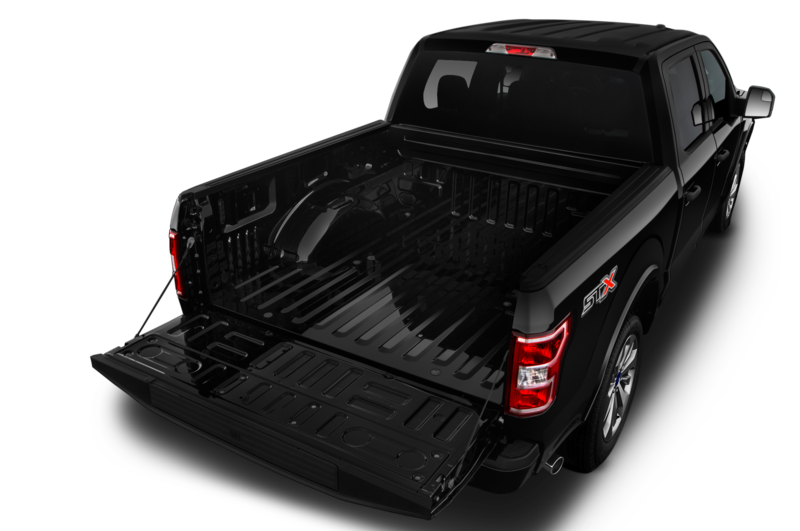 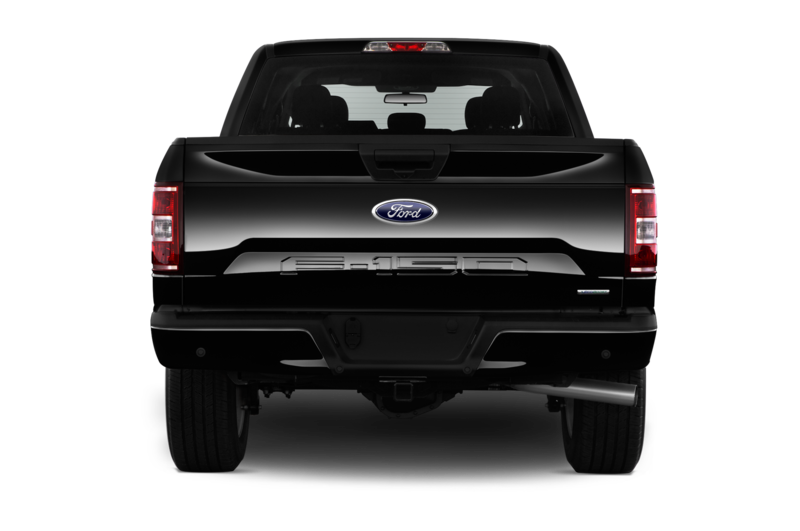 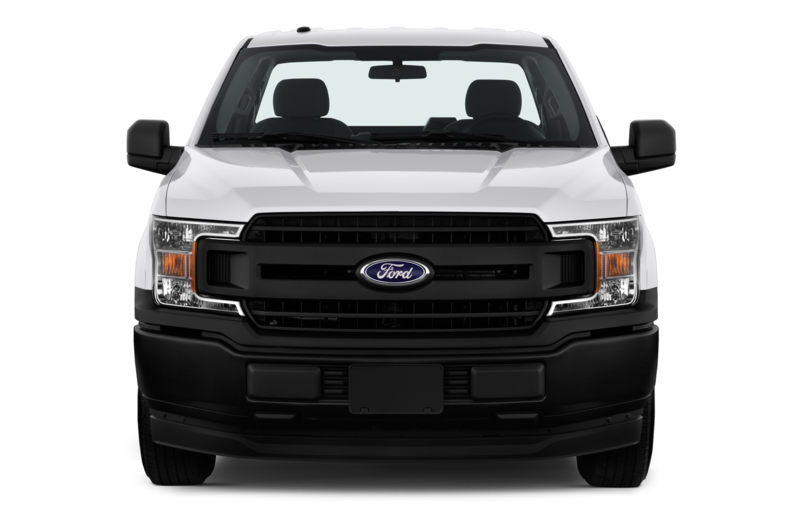 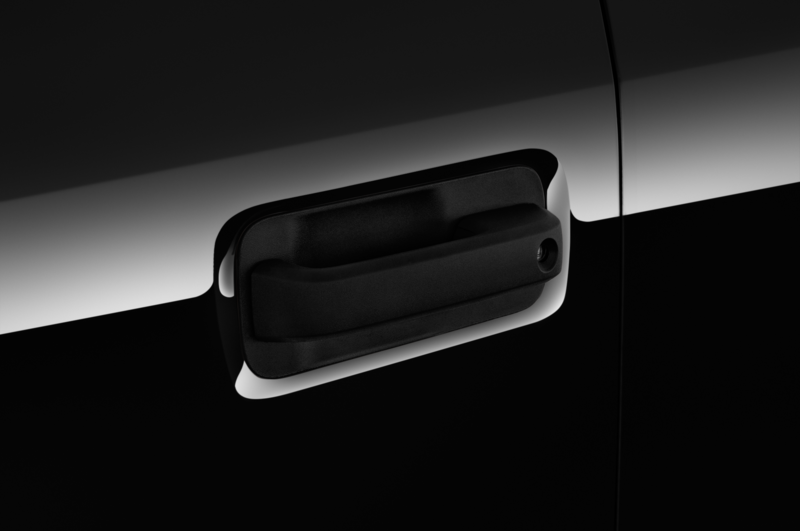 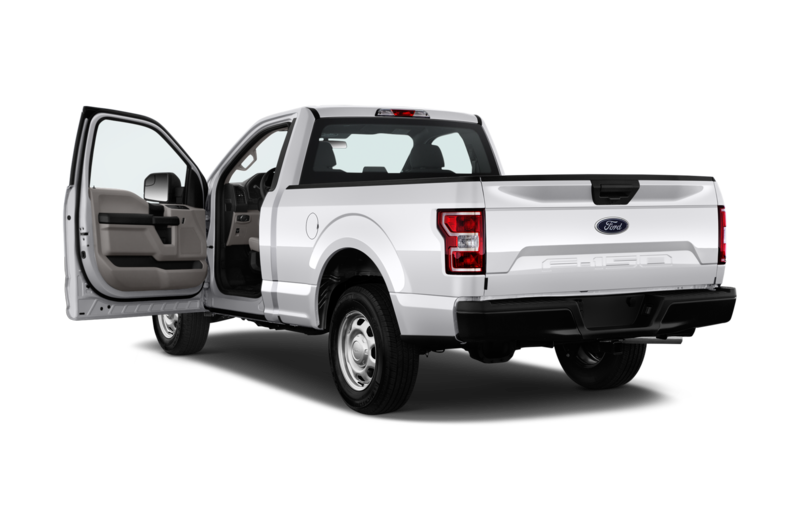 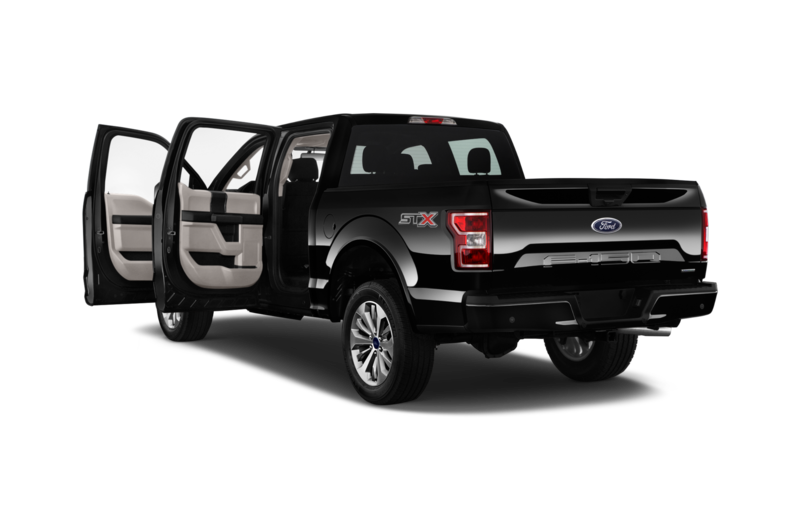 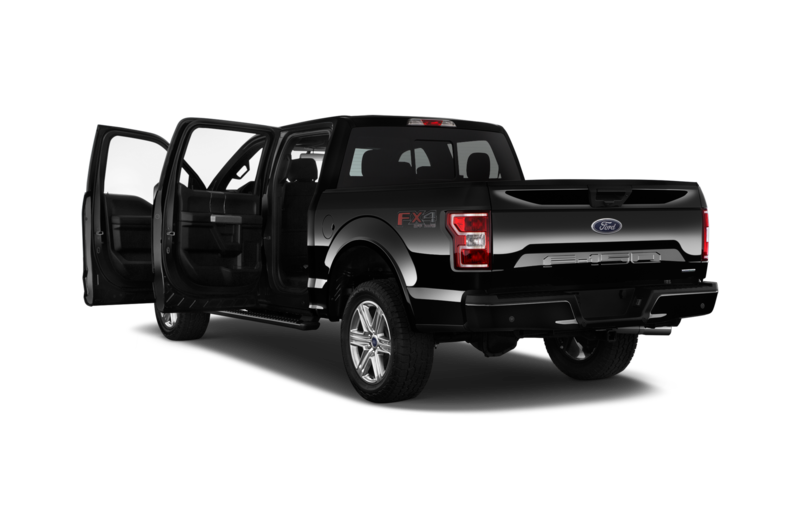 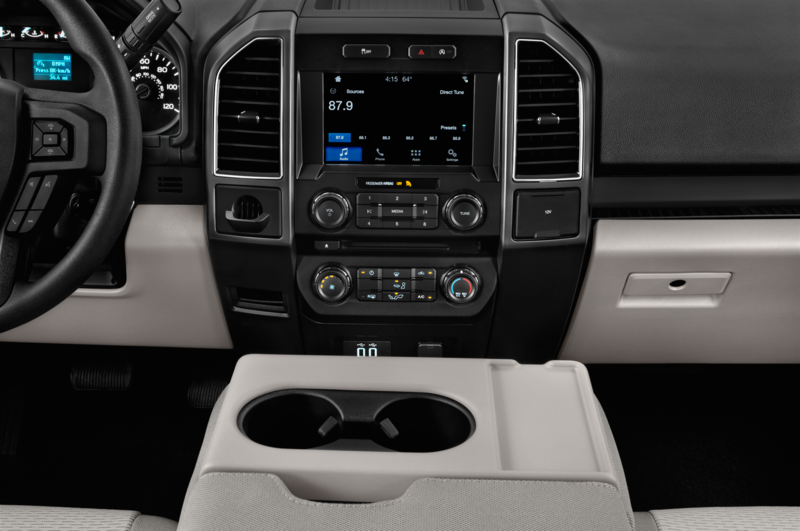 Short bed aside, this particular configuration of the 2018 Ford F-150 will please the increasingly large segment of buyers that effectively want a luxury car with a pickup bed. 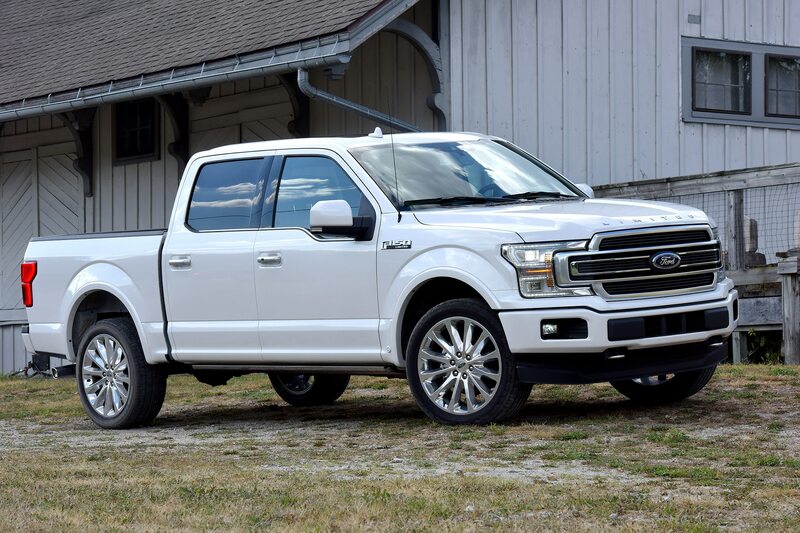 I’d spec mine differently, opting for a SuperCab with the 6.5-foot bed and the larger 3.5-liter EcoBoost V-6, but part of the beauty of the modern full-size truck market is its plethora of choices. 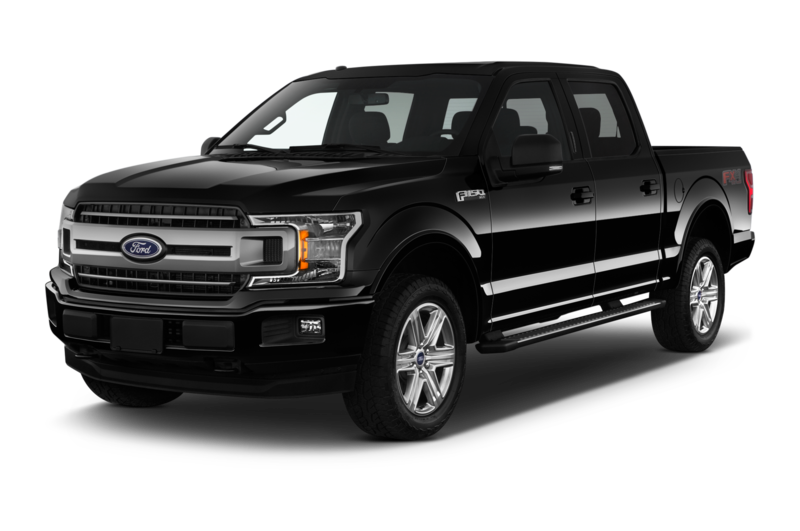 I certainly wouldn’t mind this one as an Uber Black.